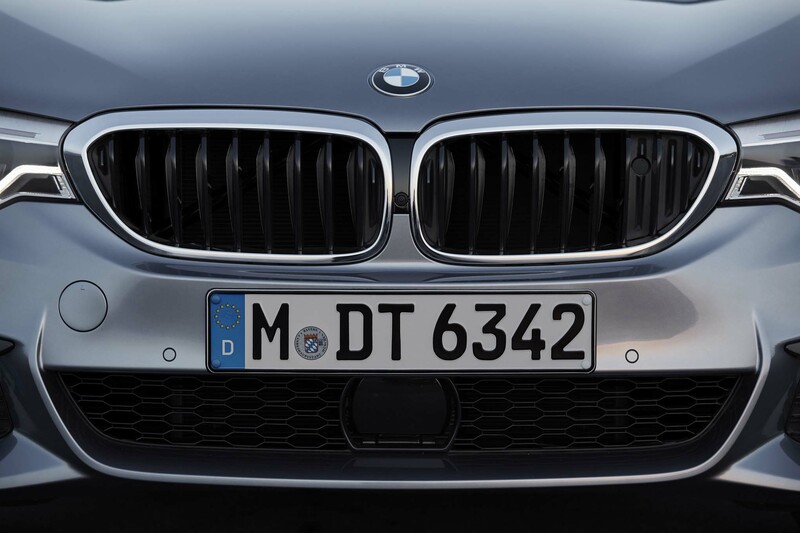 Can the return of a lofty name do the E39 5 Series proud? 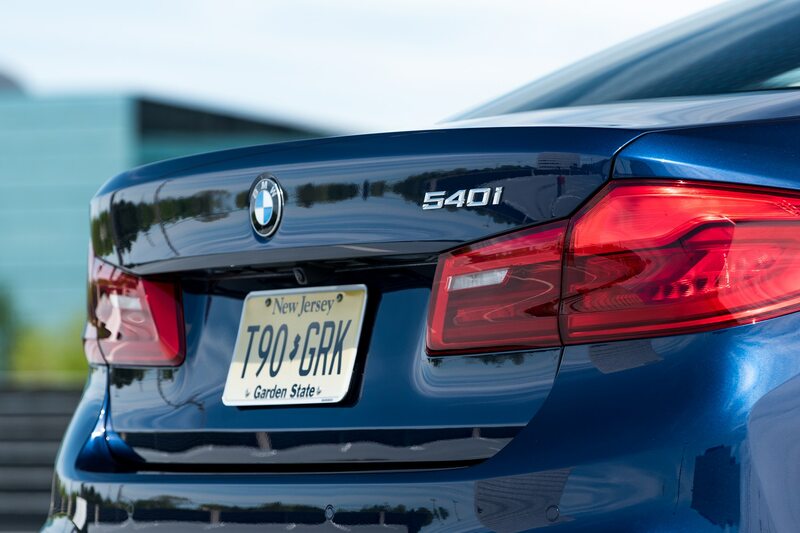 BMW’s identity in the United States is inextricably linked to the now ubiquitous 3 Series, itself rooted in the heritage of the 2002. 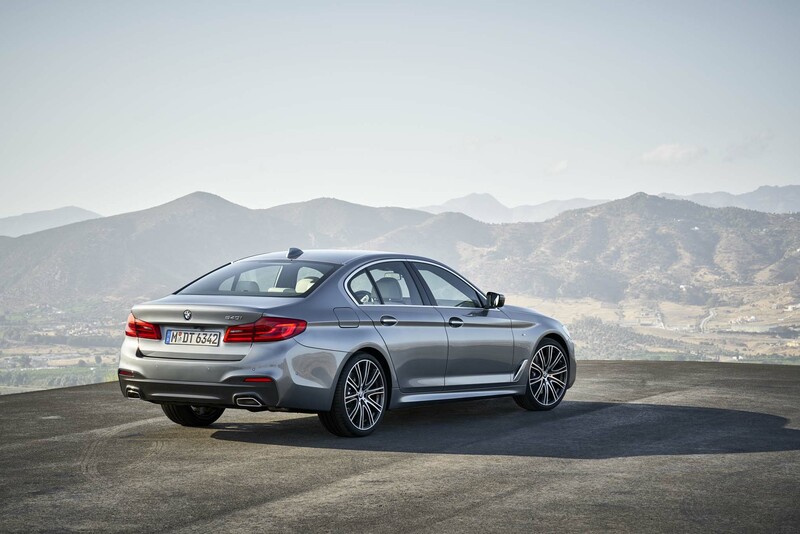 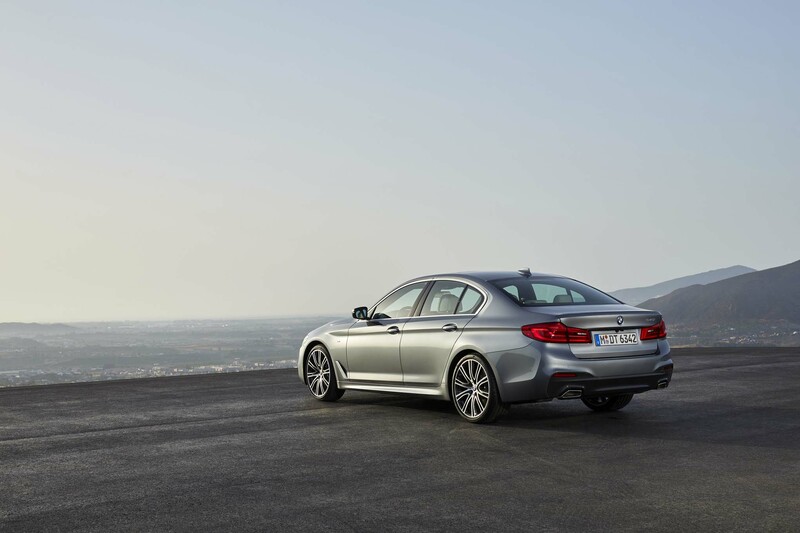 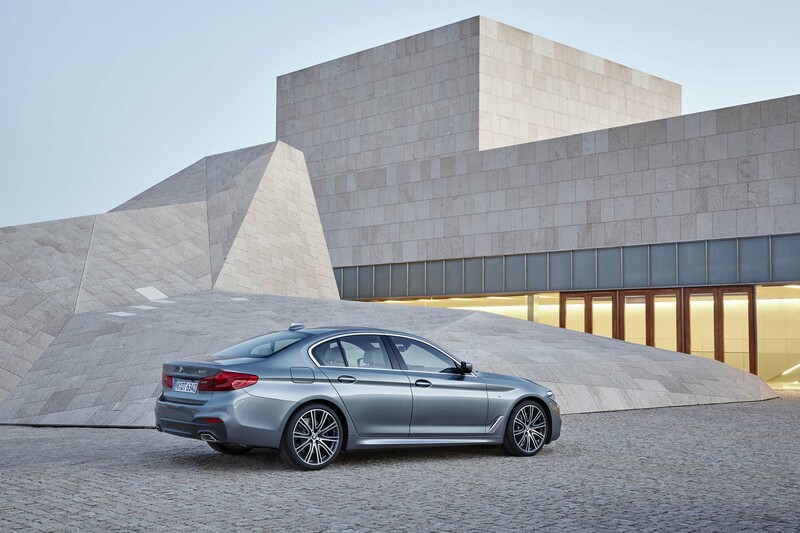 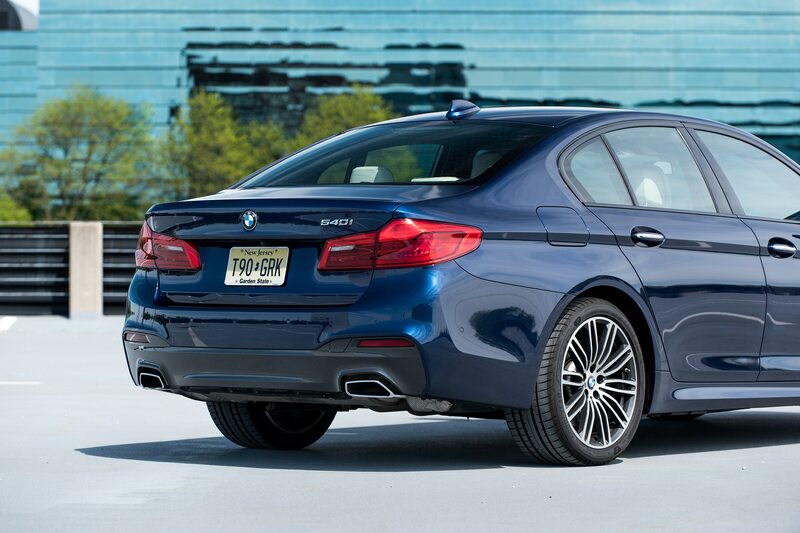 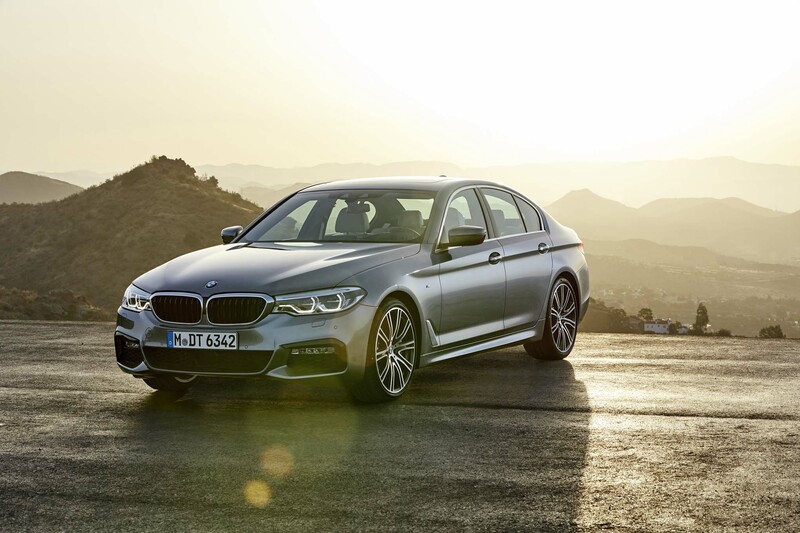 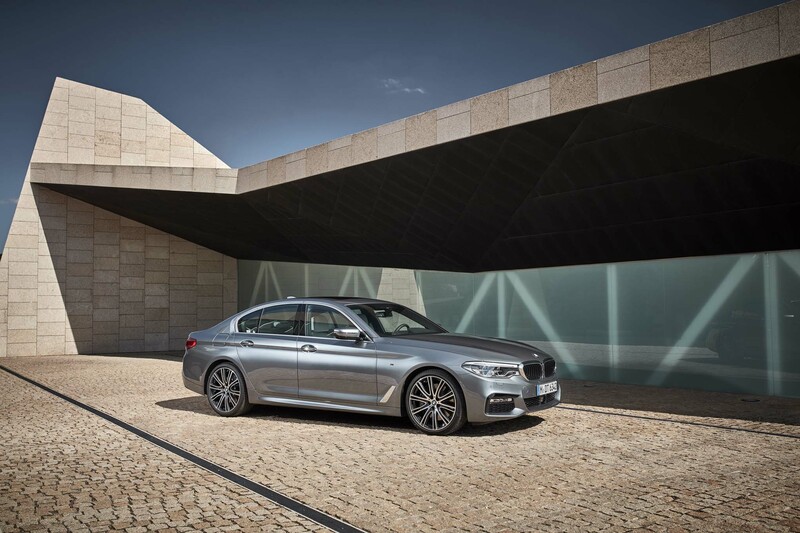 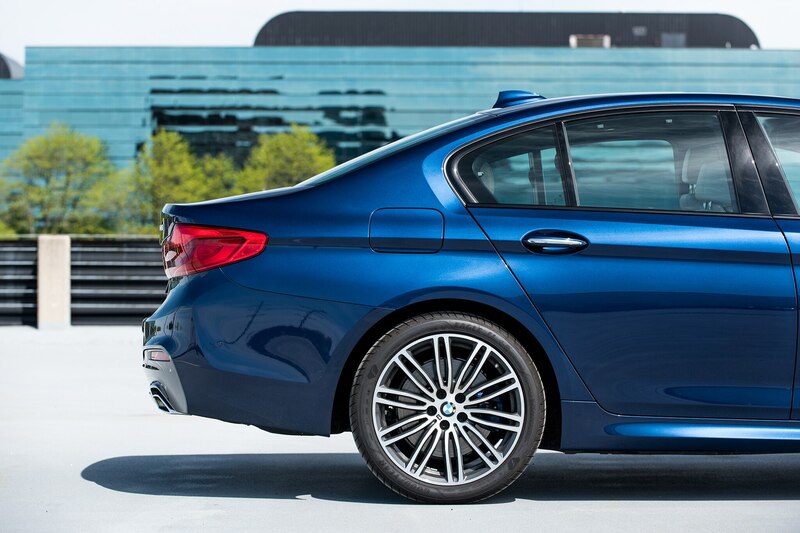 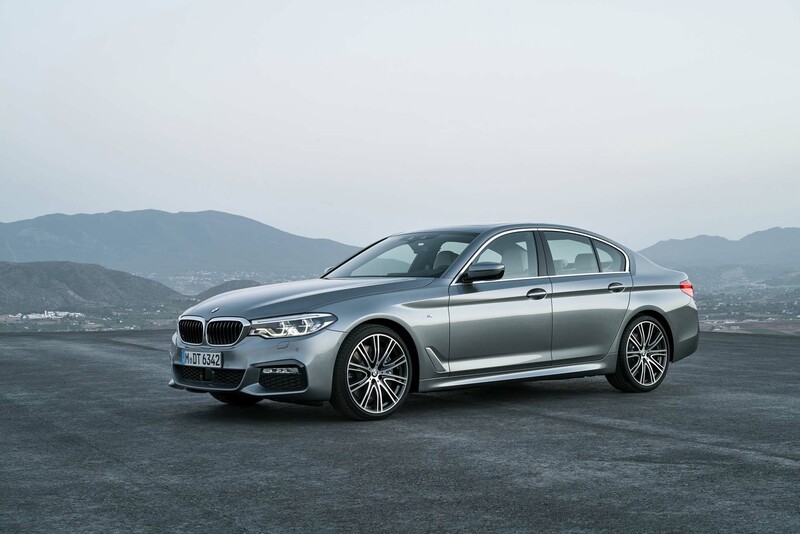 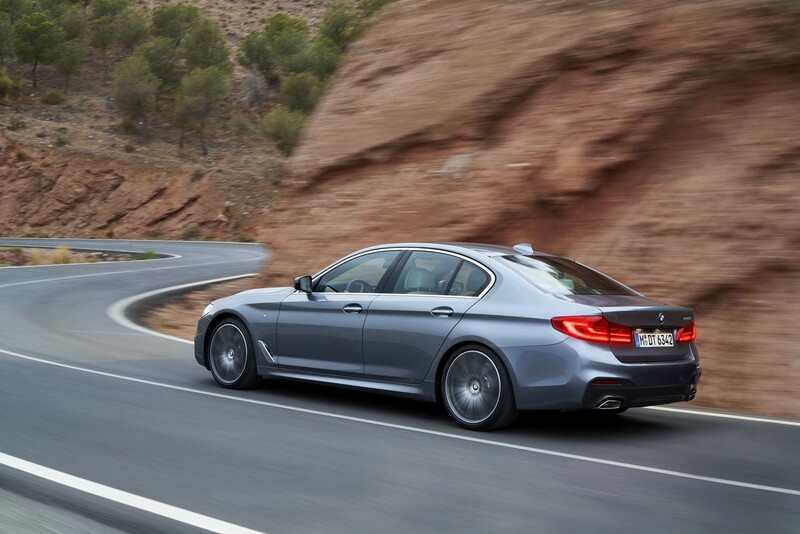 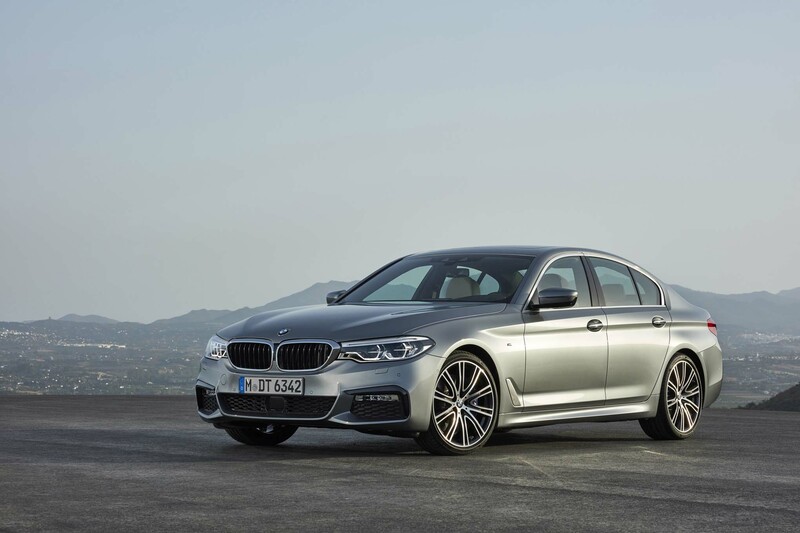 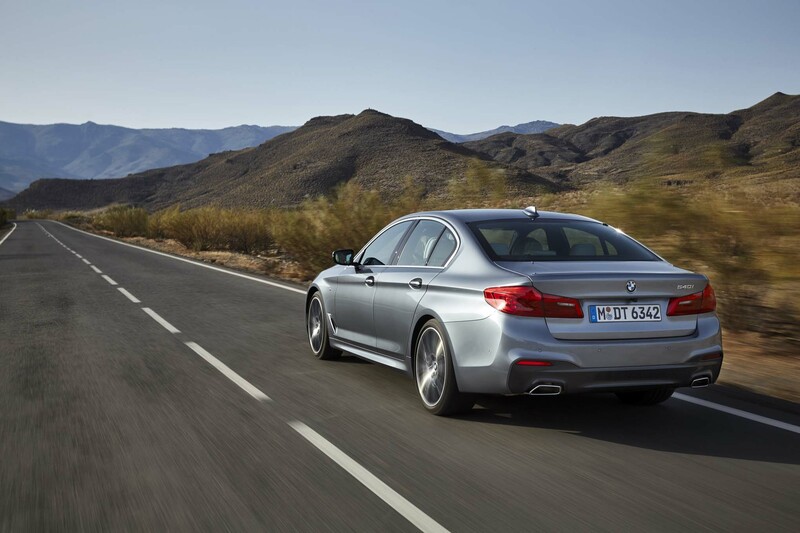 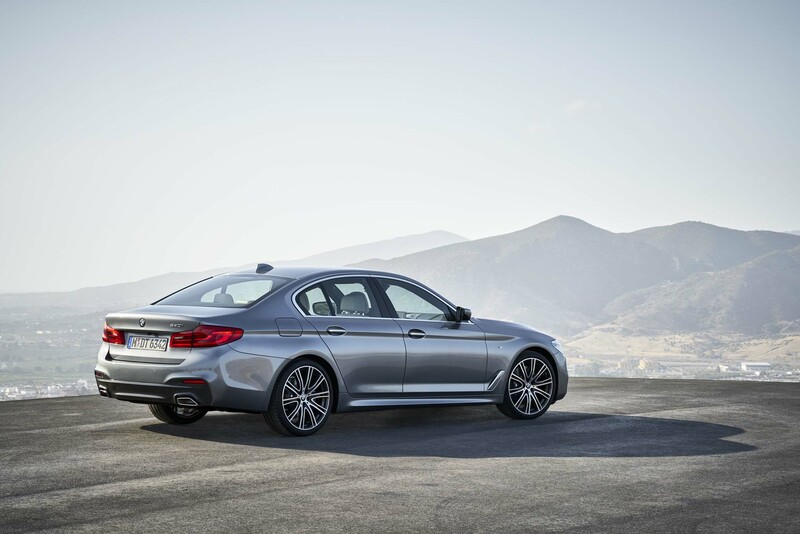 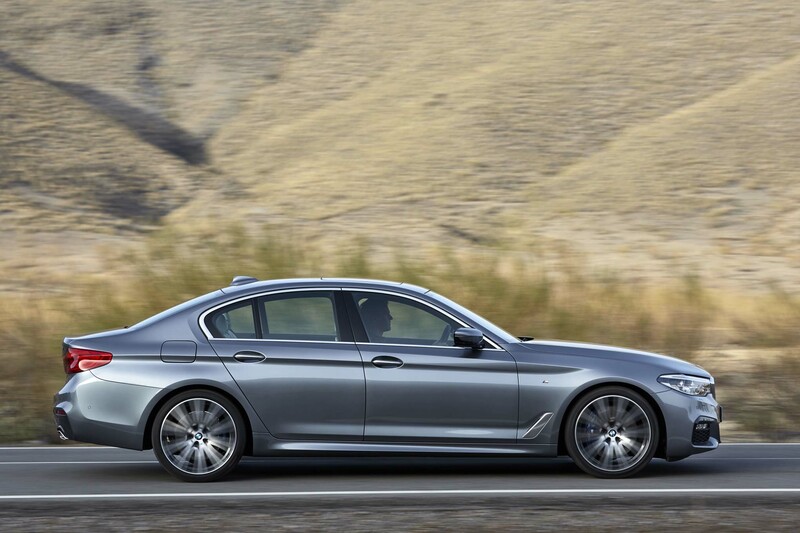 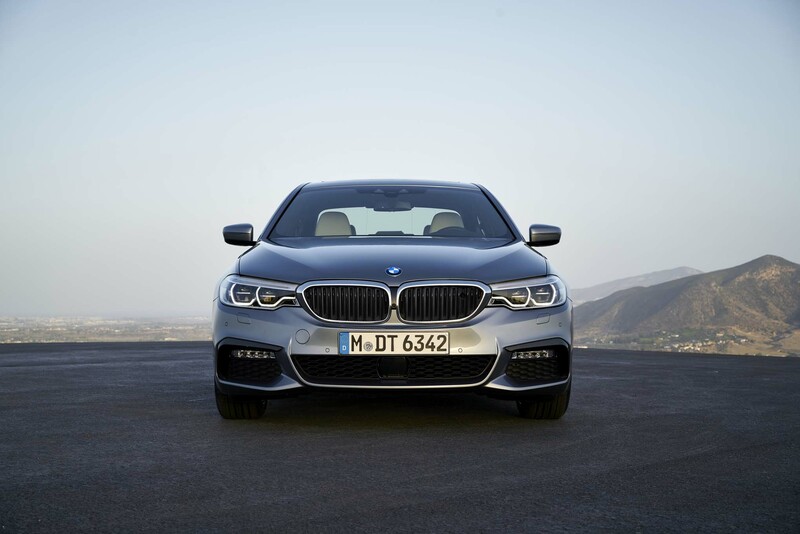 The larger 5 Series, however, is the lifeblood of Munich’s the global sedan story. 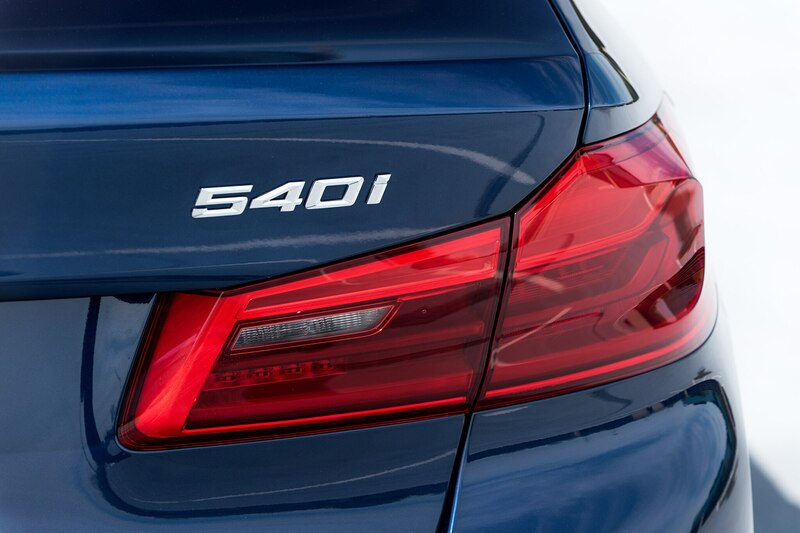 And though it’s been somewhat forgotten about here in the U.S. amidst the massive shift toward the X3 and X5, BMW loyalists still prick up their ears when the 540i moniker is in the air. 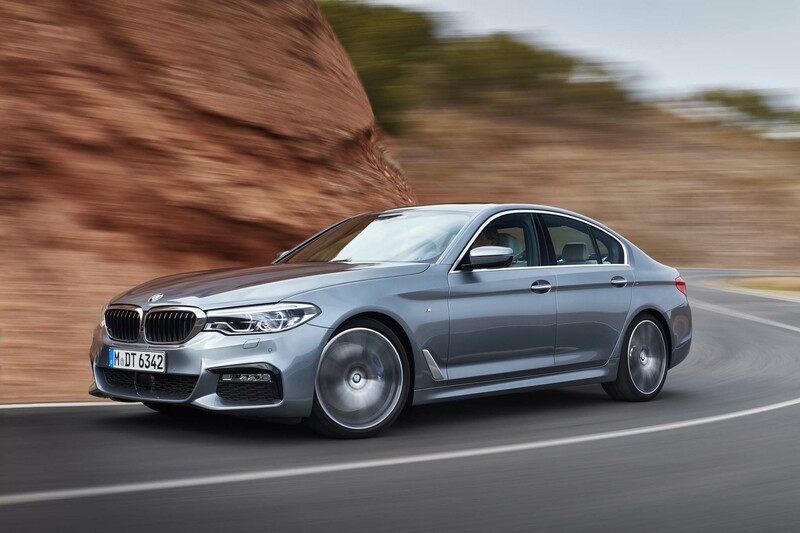 Particularly for fans of the much-adored E39 generation (1996-2003), that name represents the pinnacle of what an executive sport sedan could (and should) be. 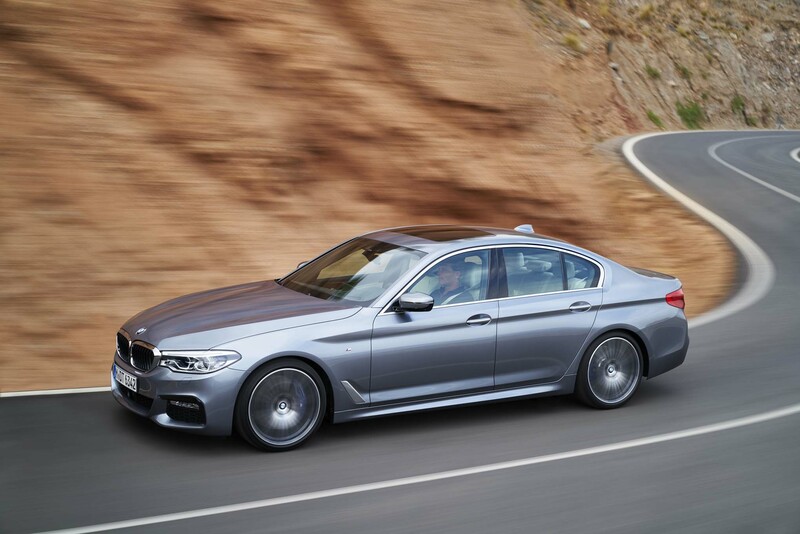 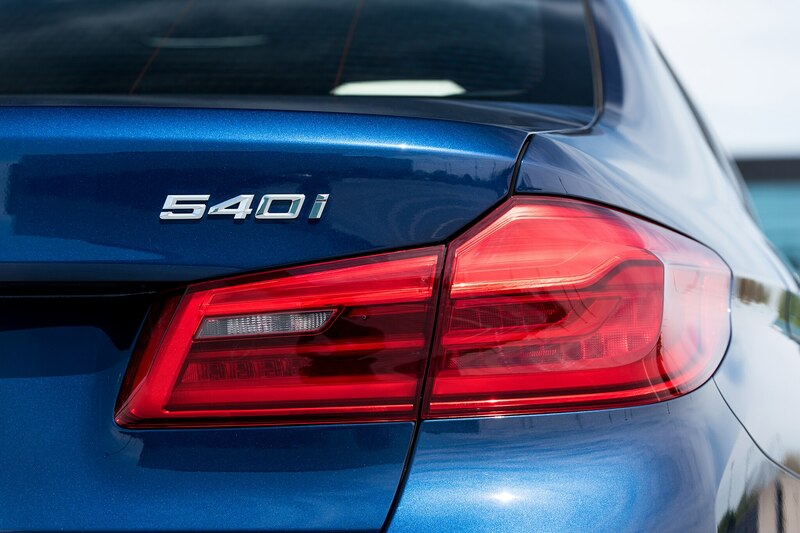 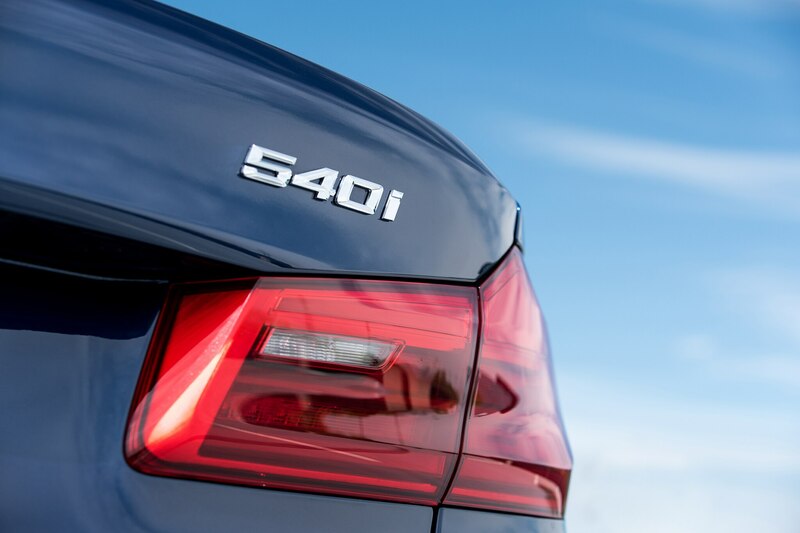 Absent since 2010, the 540i is back for the 7th-generation 5 Series. 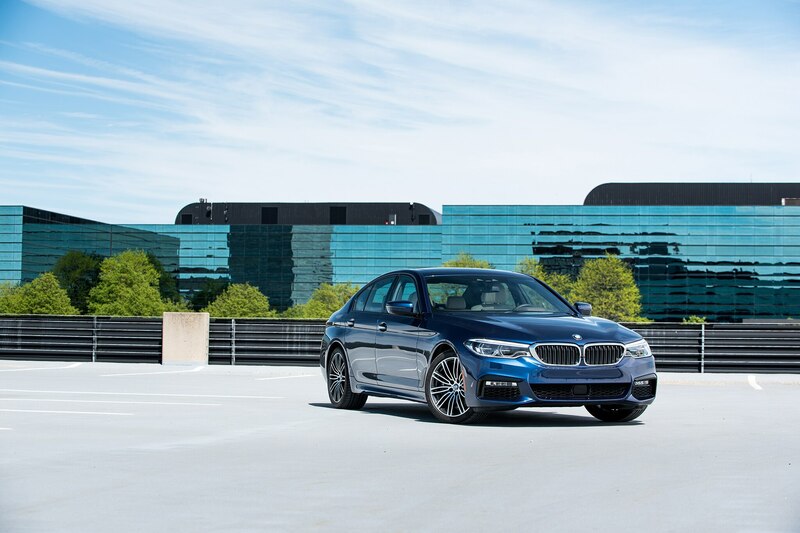 The world has changed during its hiatus, as the pendulum has swung away from V-8 engines and toward forced-induction six-cylinders. 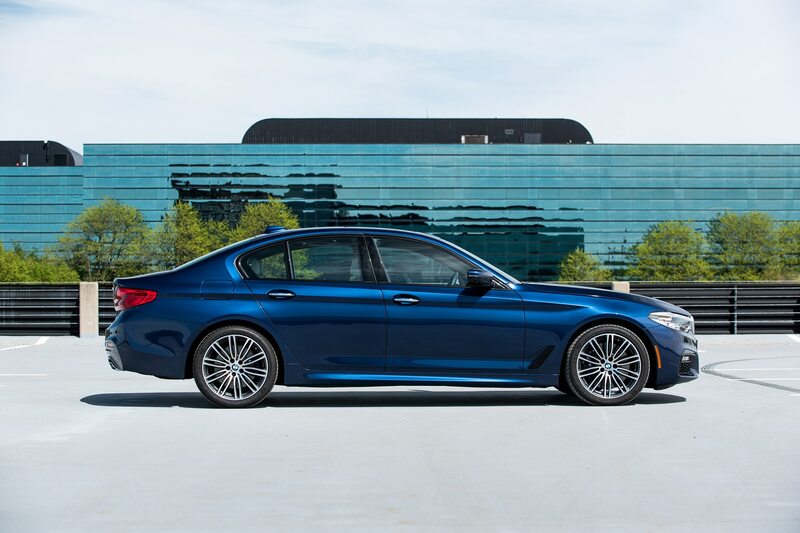 That means you’ll find a turbocharged 3.0-liter straight-six under the hood. 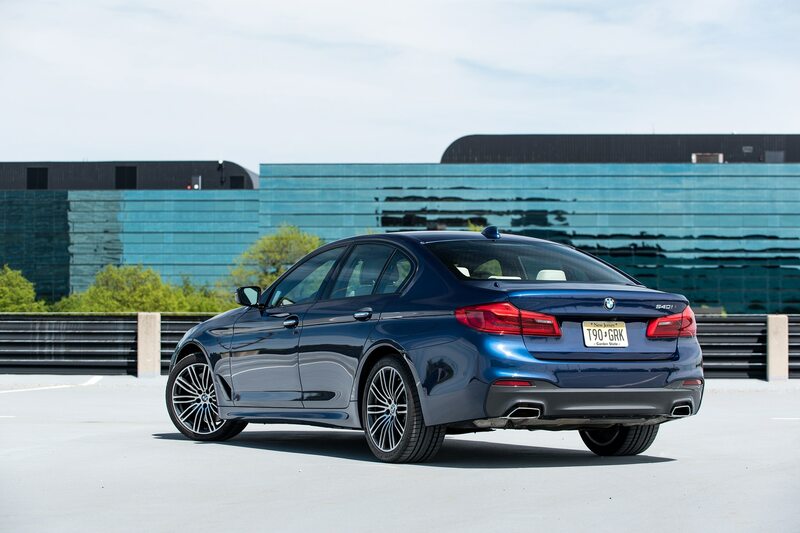 As much as we’ll miss the 4.4-liter V-8 in the E60 540i, the new G30 brings a magnificent mill to the table. 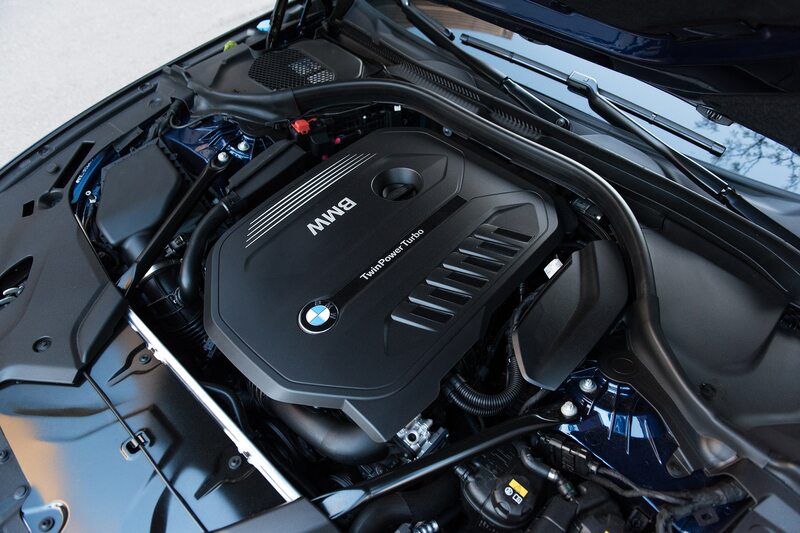 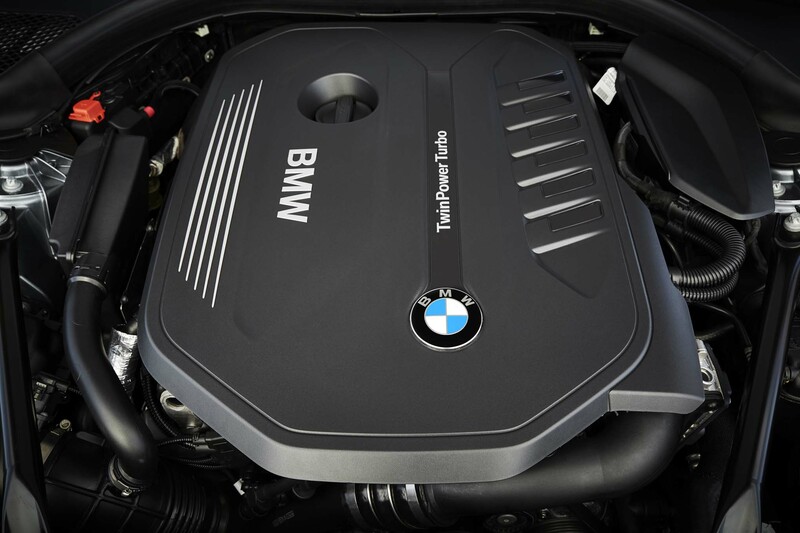 Not only is the boosted inline-six more powerful, more torque-rich, and more efficient than the V-8 it replaces, it maintains that beautiful smoothness that still makes BMW the last word in engine building. 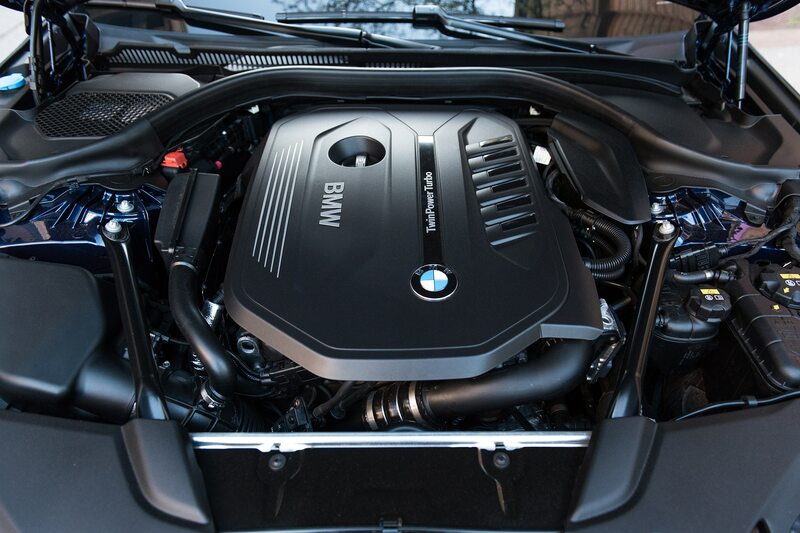 Its output of 335 hp and 332 lb-ft of torque (up 35 hp and 32 lb-ft) should have Audi and Mercedes on notice. 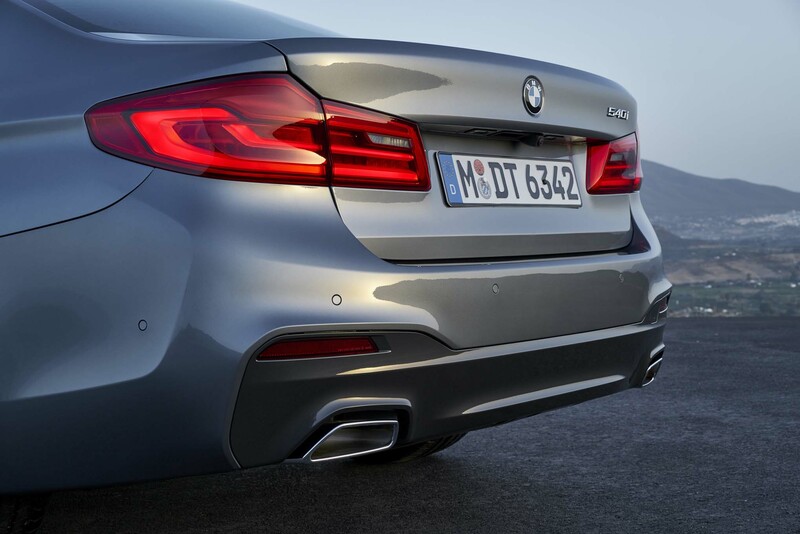 It pulls hard from launch and remains balanced all the way to redline, with more poise than either the supercharged V-6 in the A6 or the twin-turbo V-6 in the Mercedes-AMG E43. 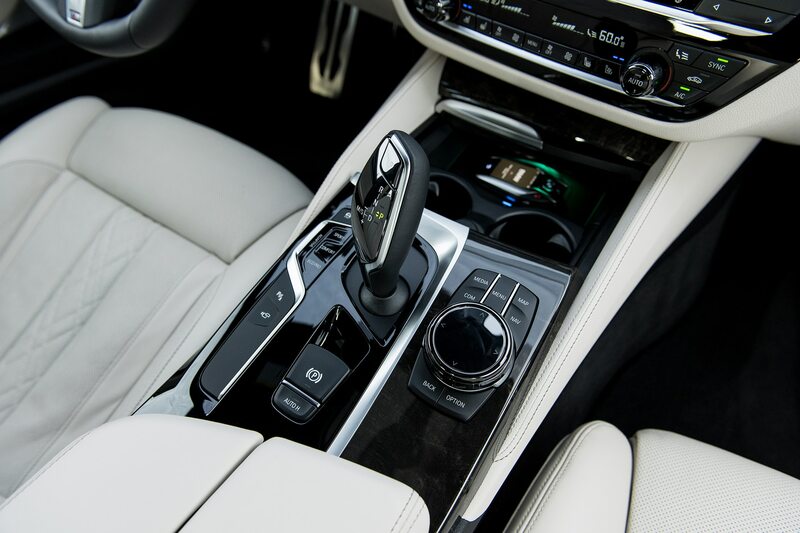 Fantastic, too, is the way the engine pairs with the ZF eight-speed automatic transmission, which delivers consistently crisp and timely shifts. 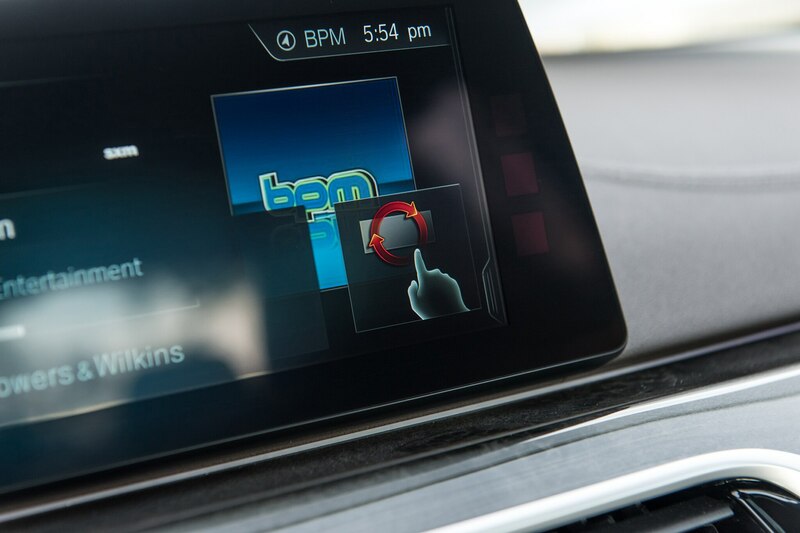 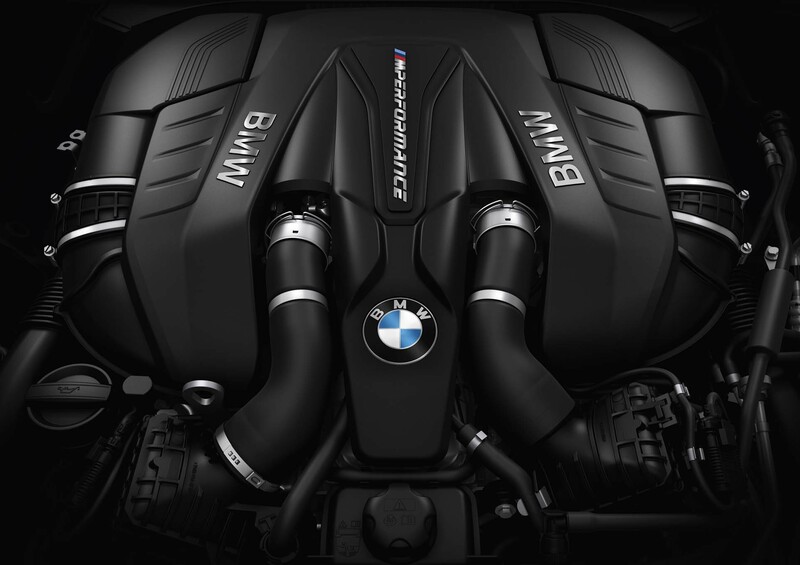 If I have one complaint it’s the lack of a more emotional engine note, but having heard the bat-out-of-hell roar of the 4.4-liter twin-turbo V-8 in the G30 M550i, it’s probably better that the straight-six leave the power ballads to the professionals. 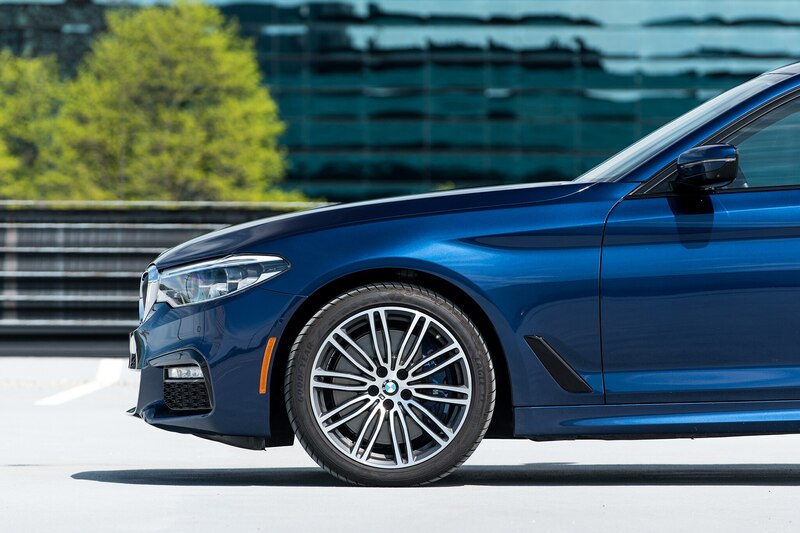 Beyond the excellence of its powertrain, though, the 540i is a long way from the engaging sport sedan that diehards remember. 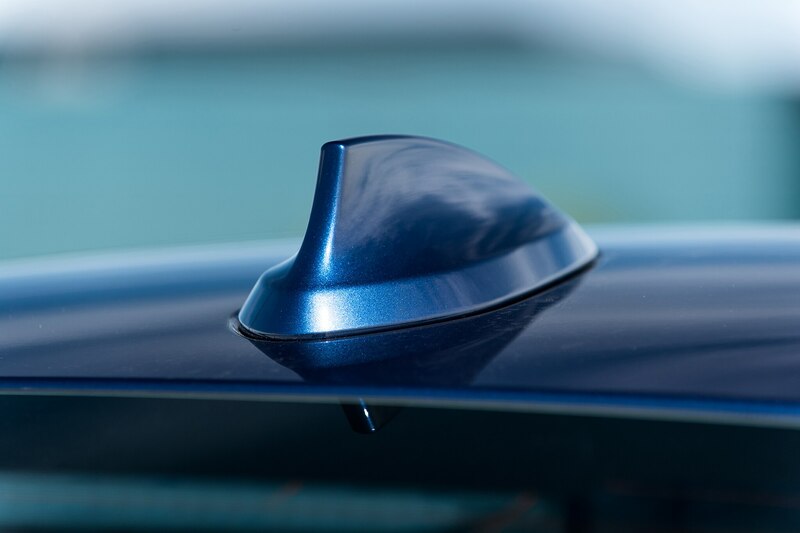 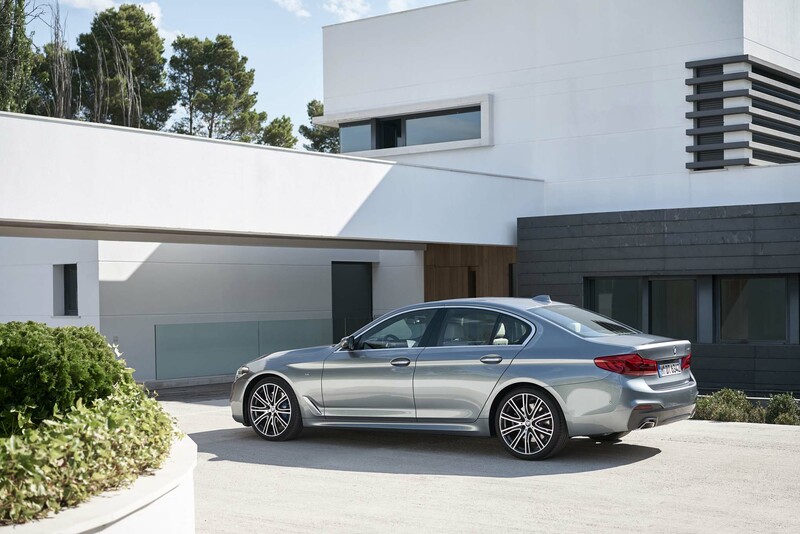 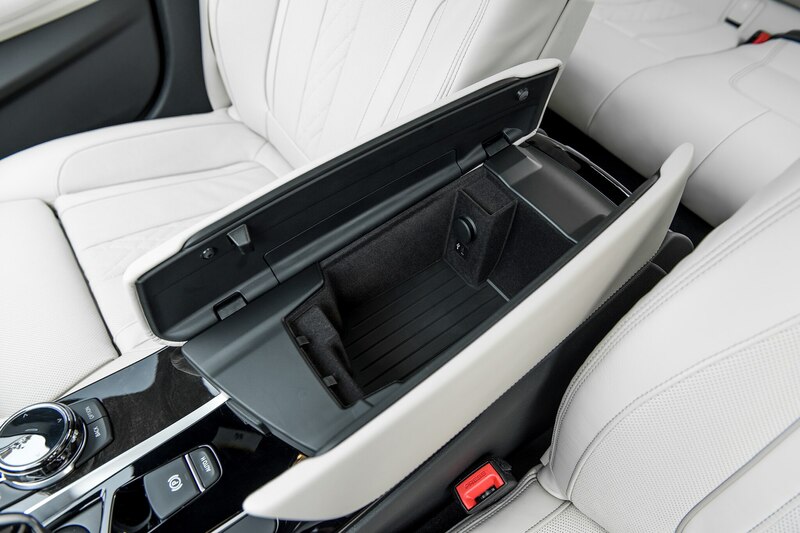 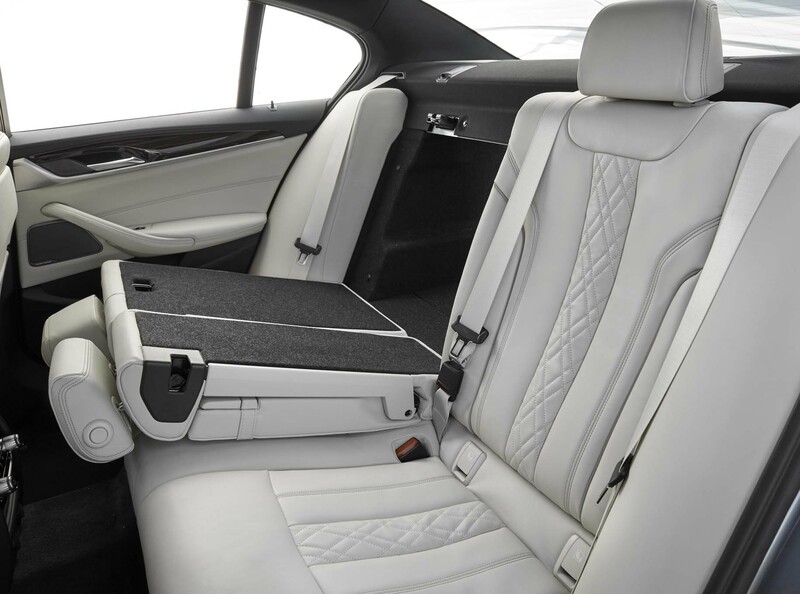 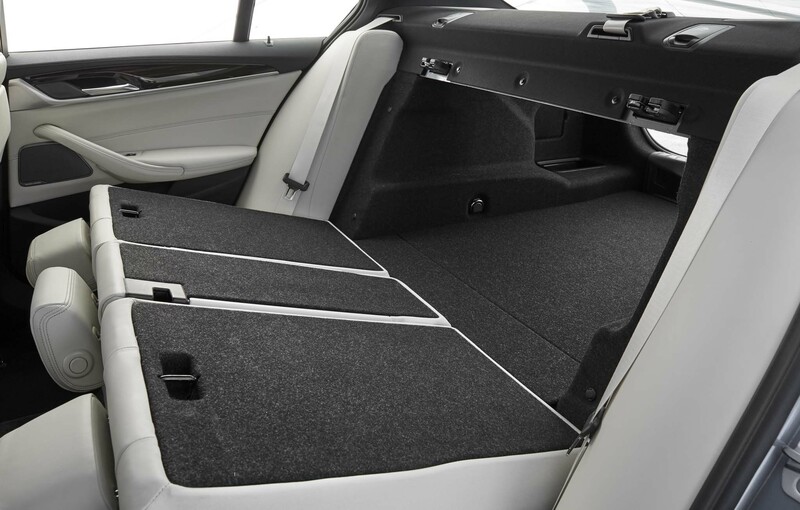 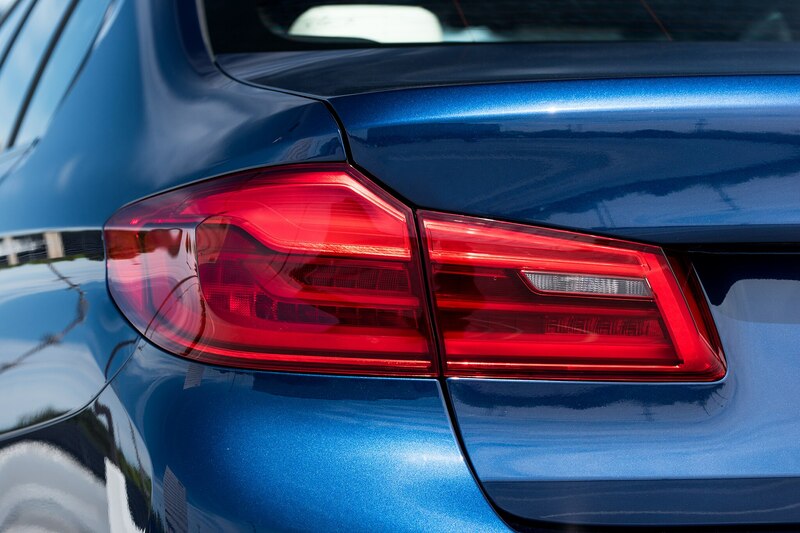 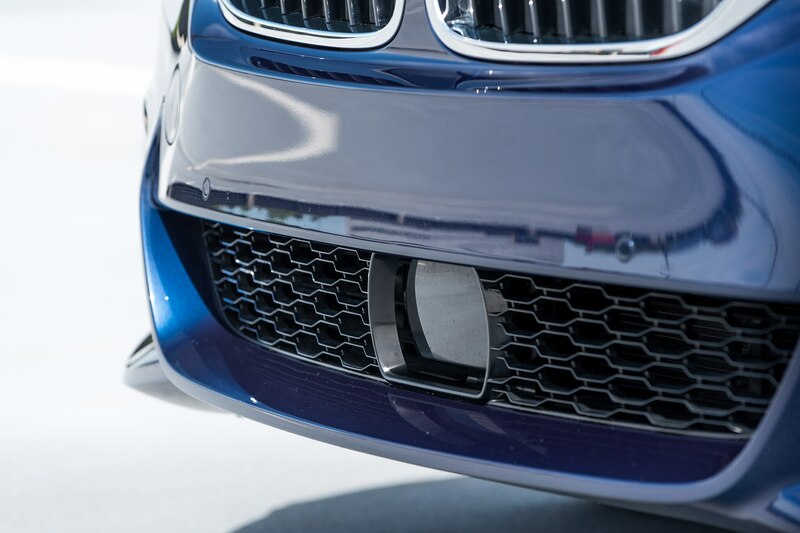 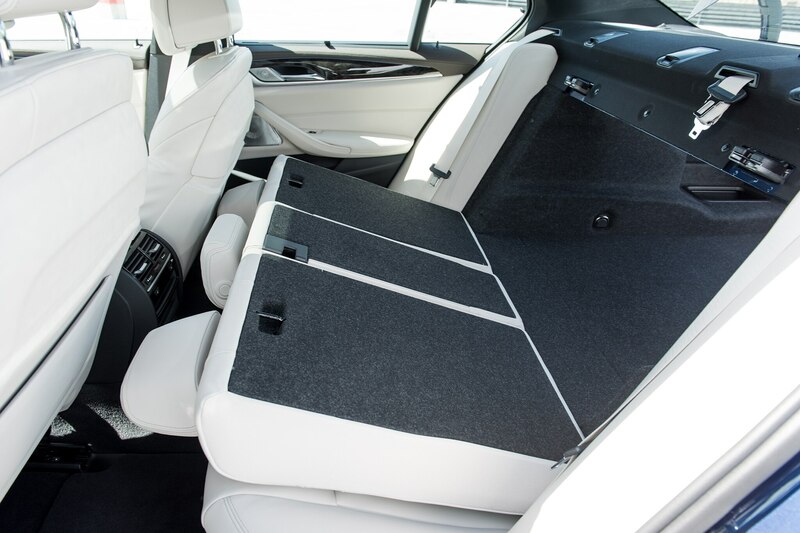 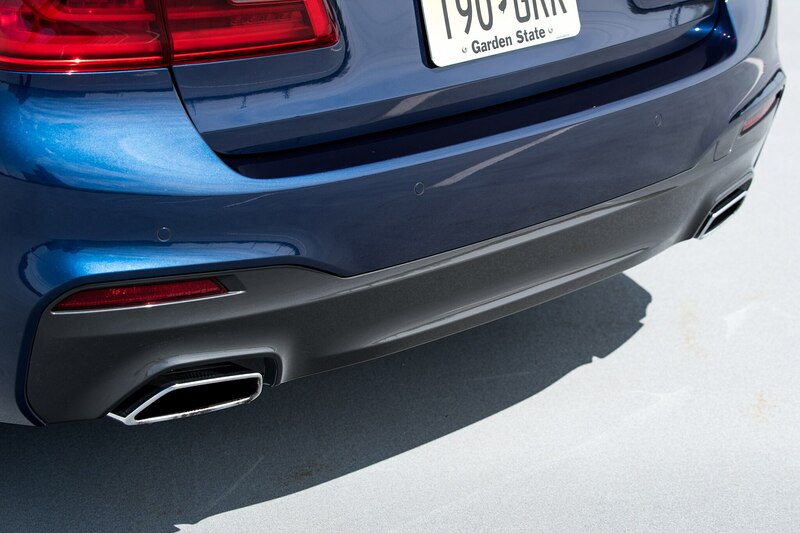 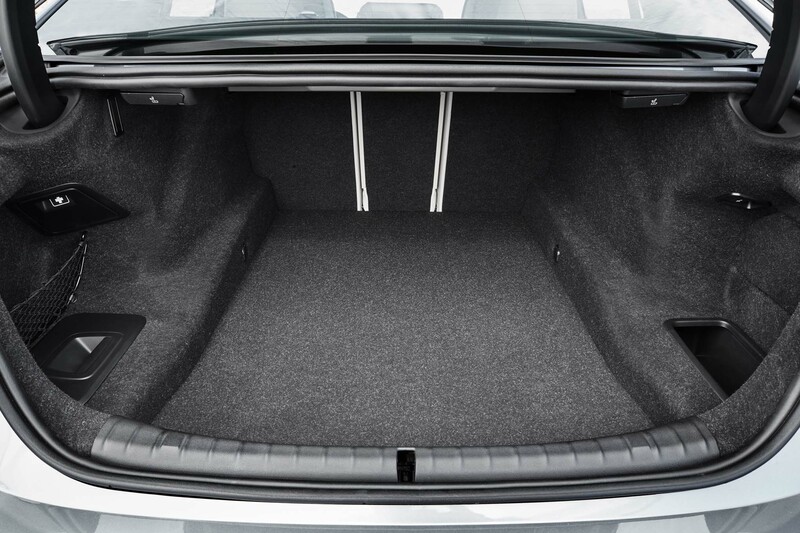 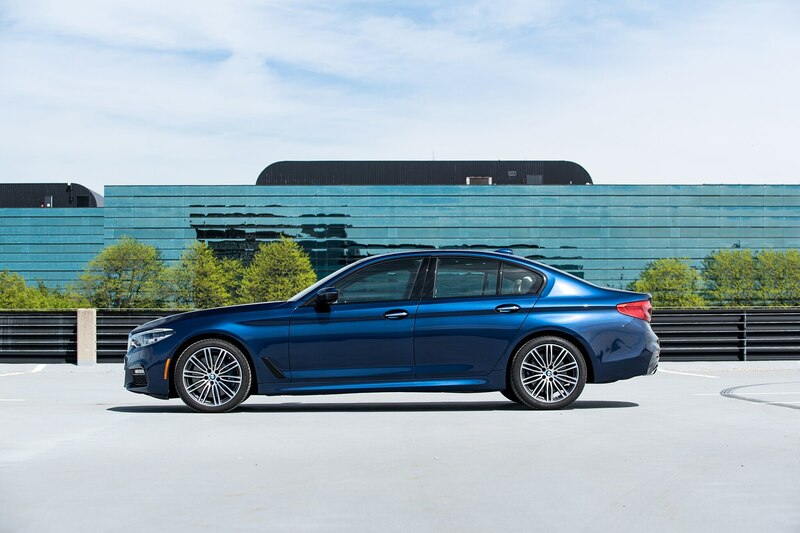 Yes, the G30 5 Series is up to 137 pounds lighter than the outgoing car, thanks in part to the use of aluminum for the trunk, trunk lid, doors, and roof. 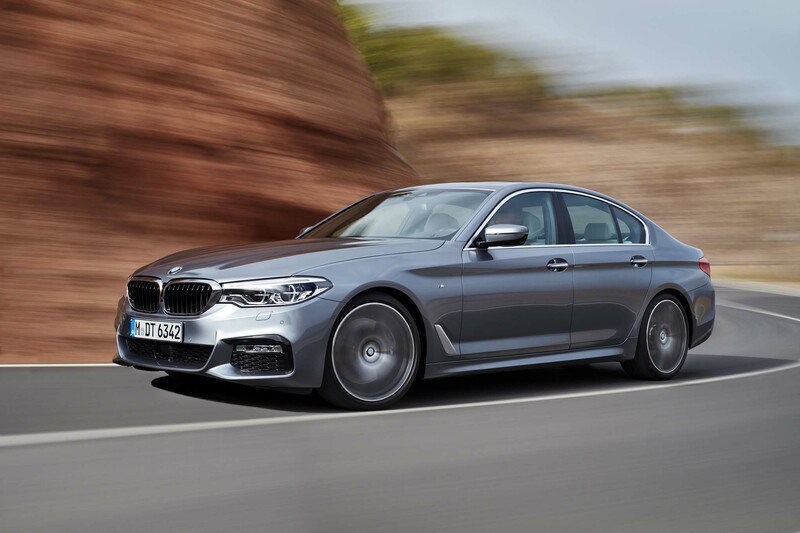 But even with the $2,600 M Sport package, $3,200 Dynamic Handling Package, and $650 M Sport brakes, the 540i left me feeling a little cold and uninspired. 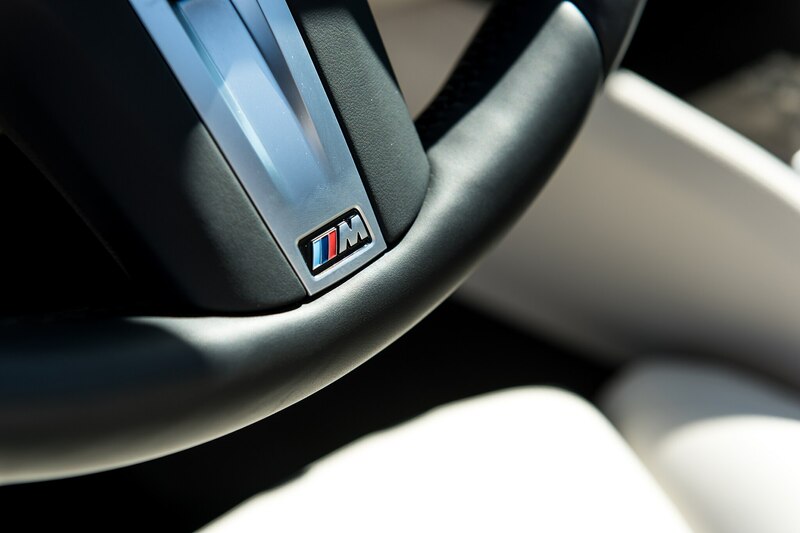 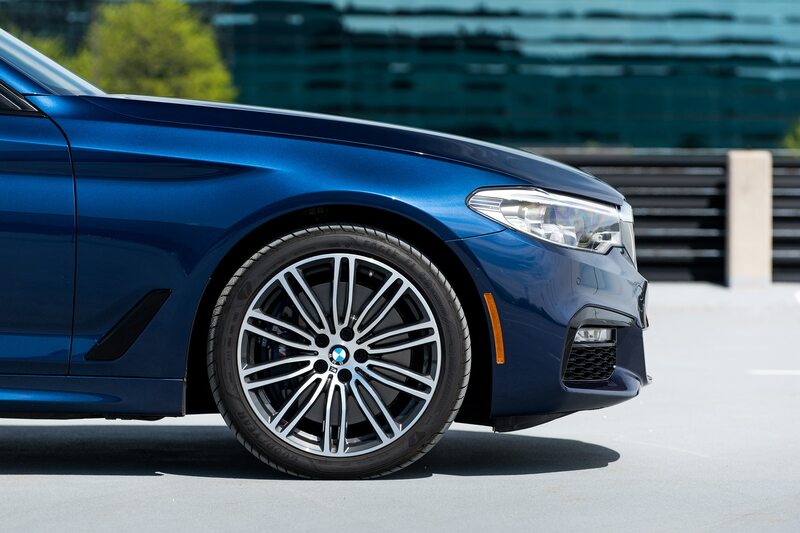 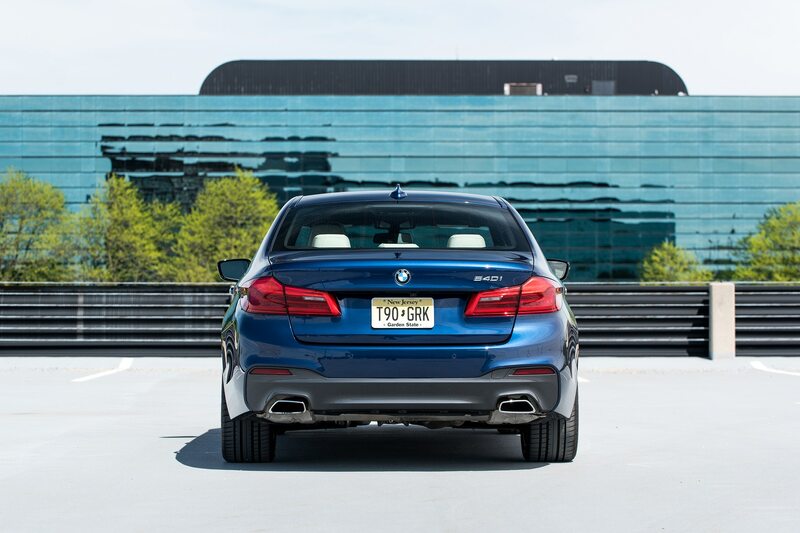 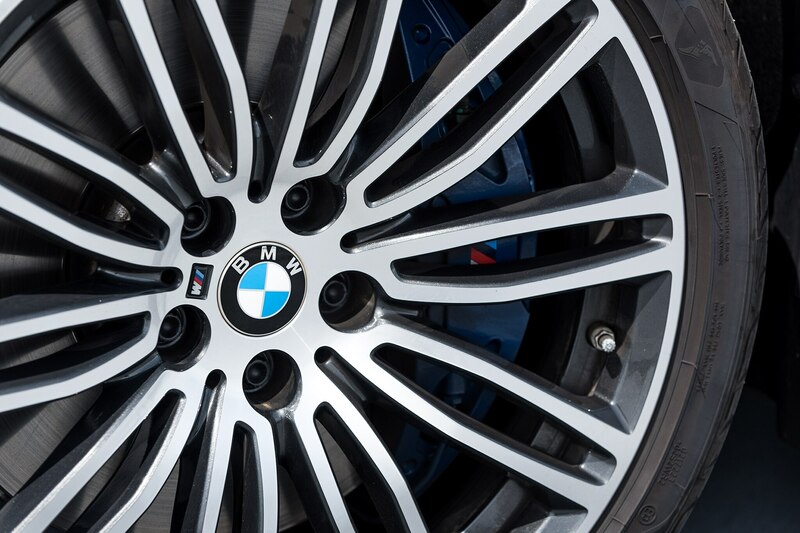 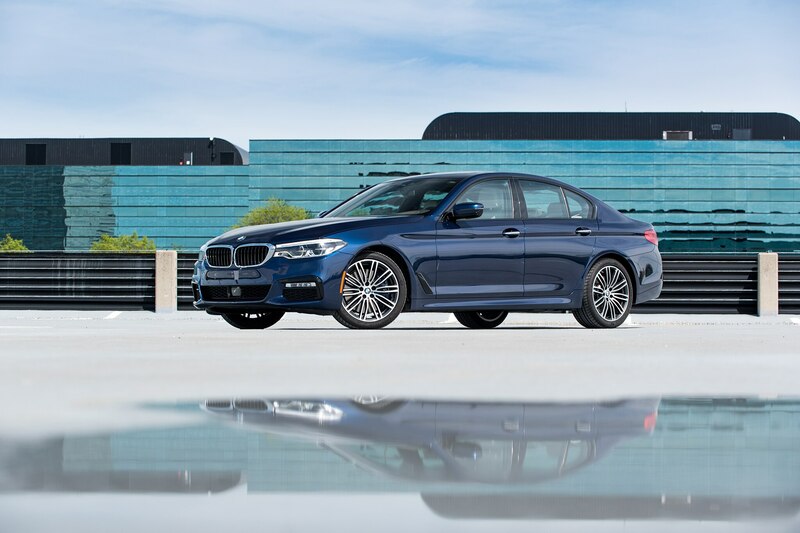 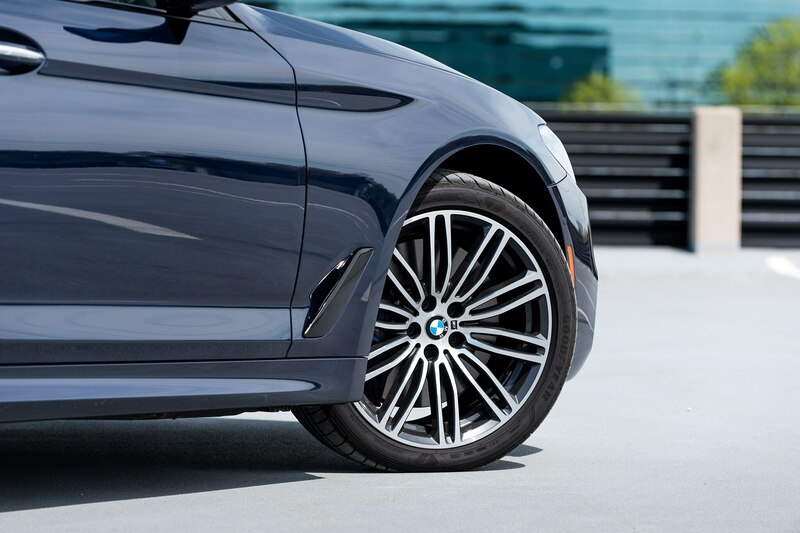 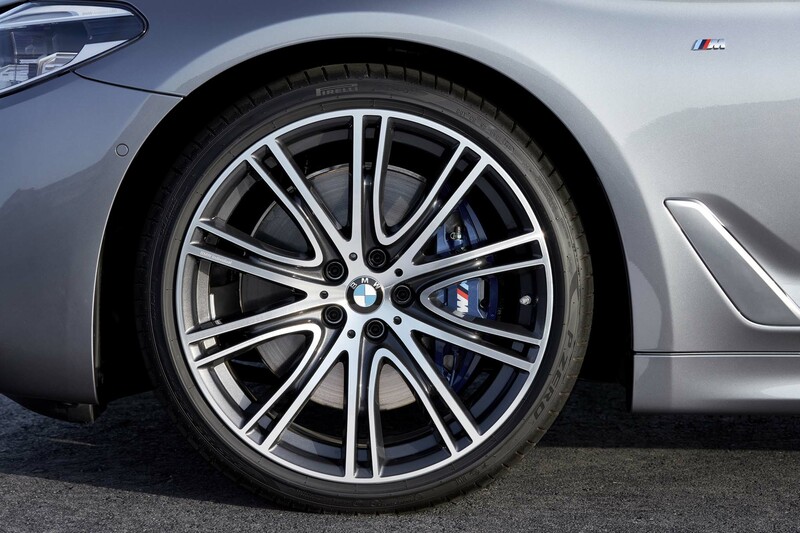 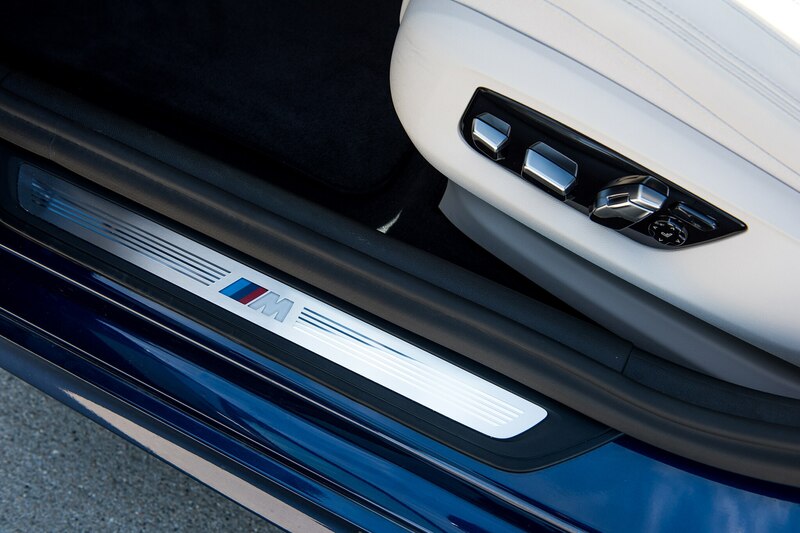 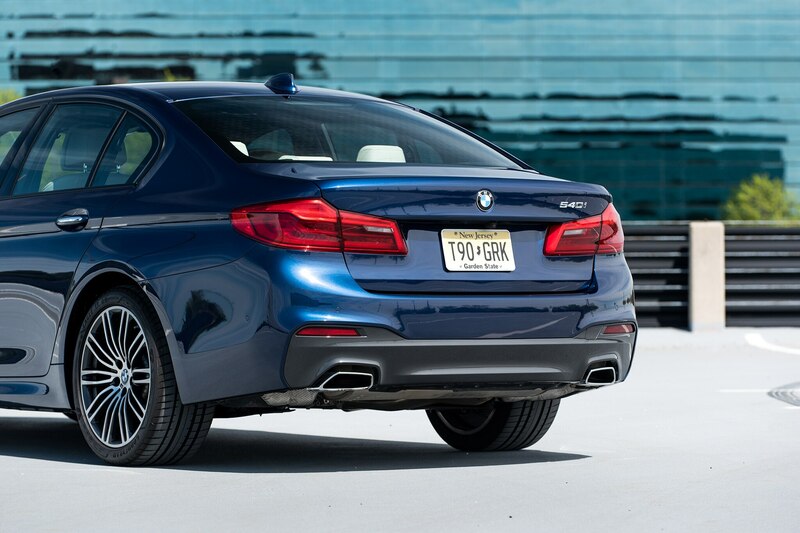 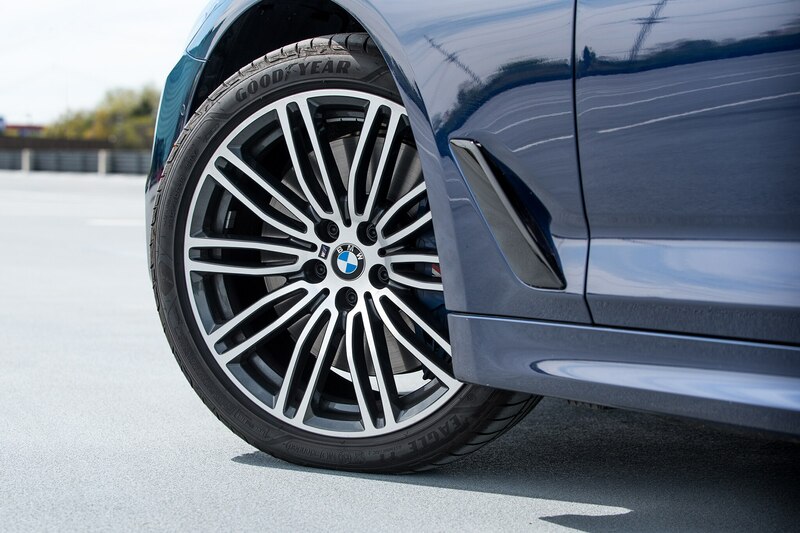 The M Sport package adds 19-inch wheels with performance run-flats, a lowered suspension, a fat M Sport steering wheel, aluminum pedals, and a 155-mph top speed. 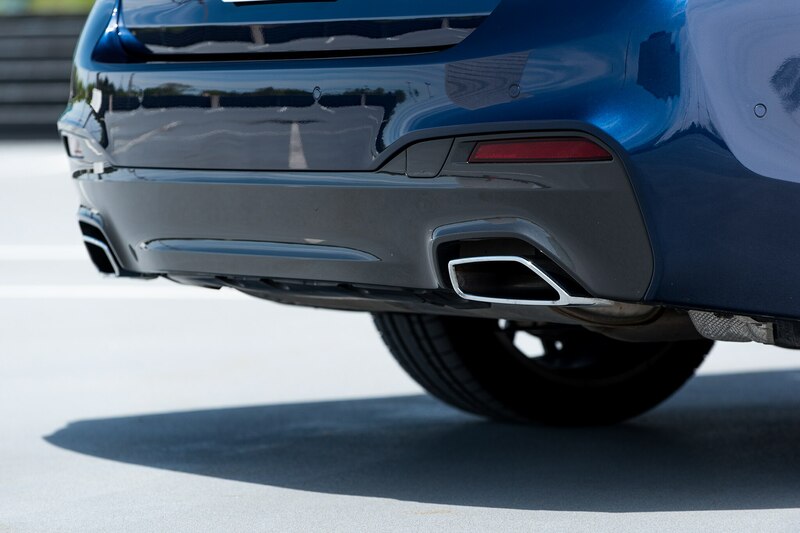 Also included is an aero kit with meaner-looking front air intakes, side skirts, a rear diffuser, trapezoidal exhaust tips, and Shadowline exterior trim. 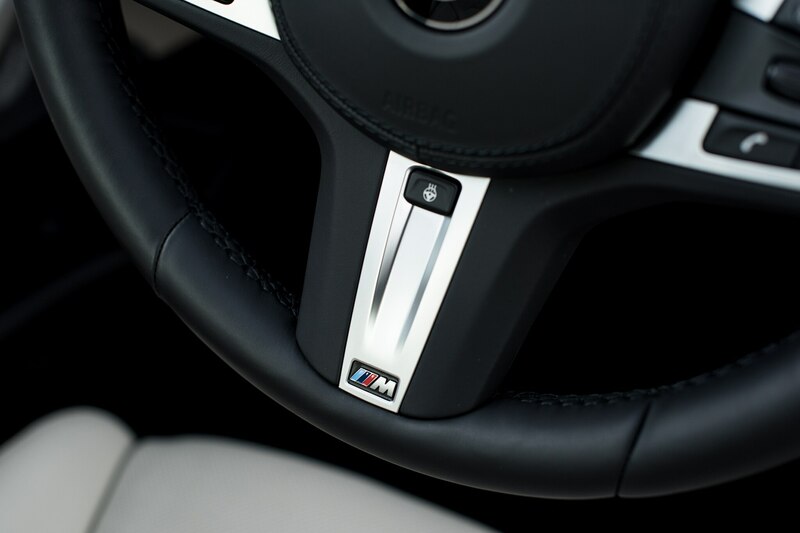 Dynamic damper control and active roll stabilization are they key ingredients for the Dynamic Handling Package and are intended to improve ride quality and reduce cornering lean. 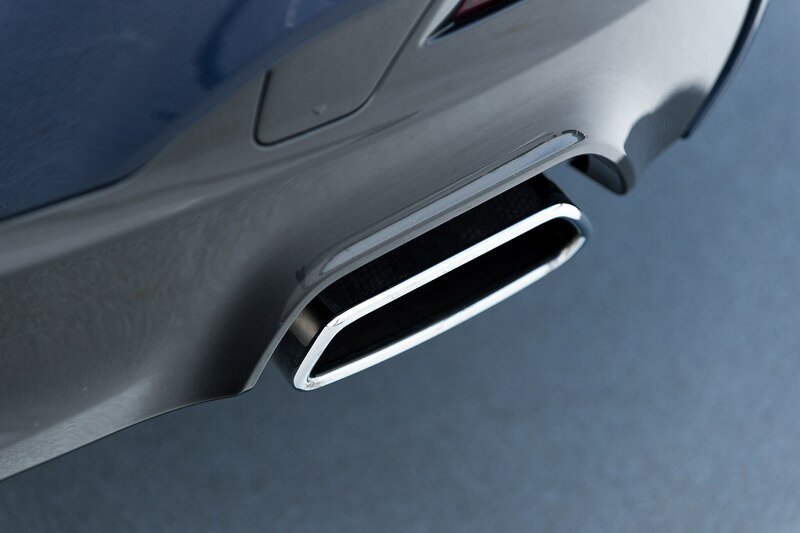 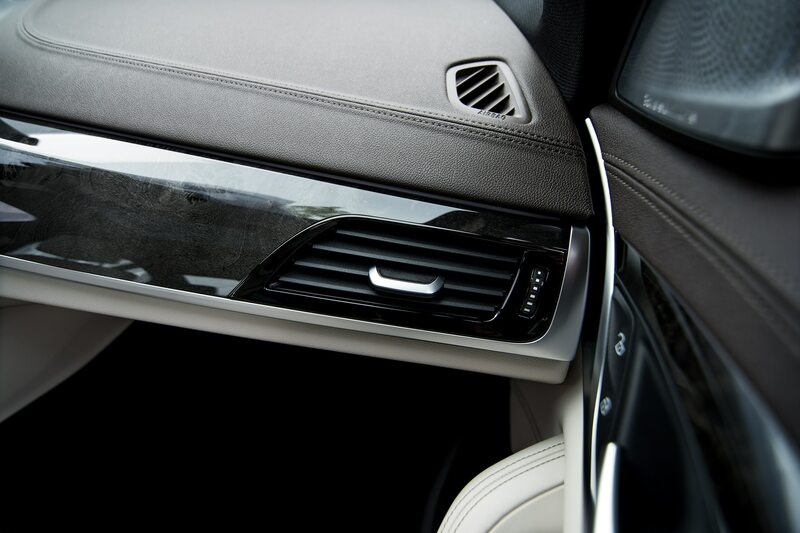 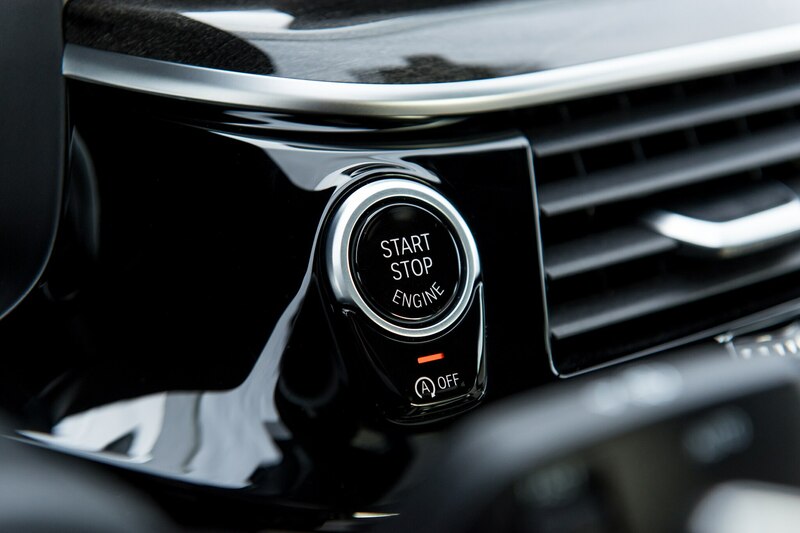 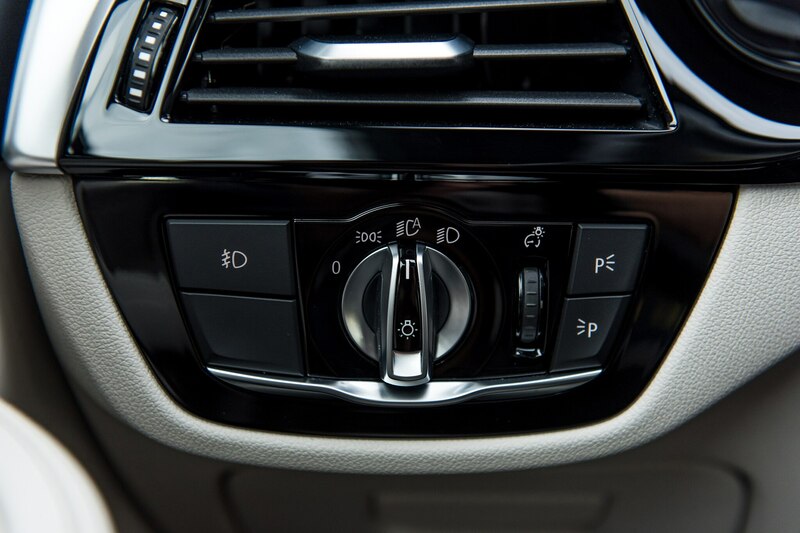 The dynamic dampers are constantly adjusting themselves in accordance with the chosen driving mode. 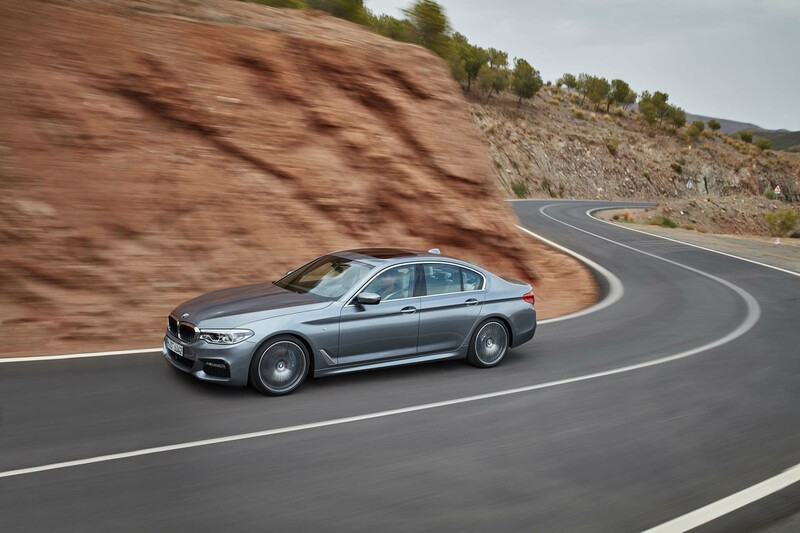 Active roll stabilization, meanwhile, works by twisting the anti-roll bars on the front and rear axles, which is itself not new, but now works using faster-responding electric motors replacing the old hydraulic system. 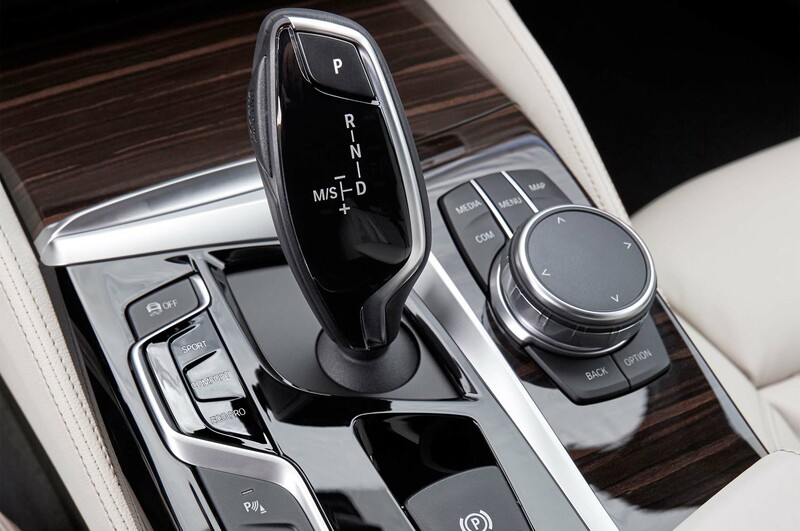 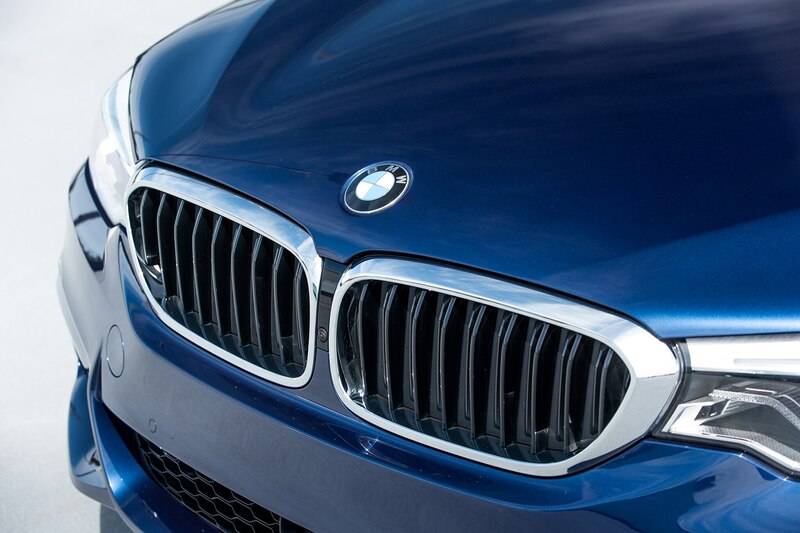 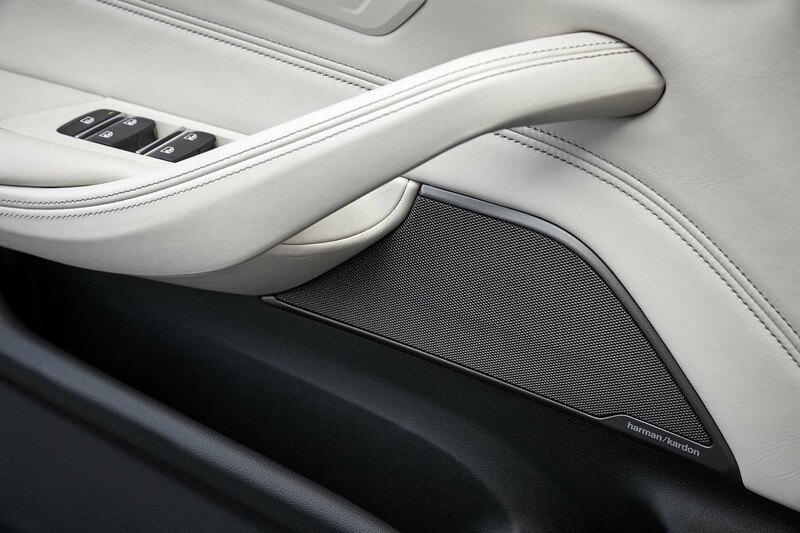 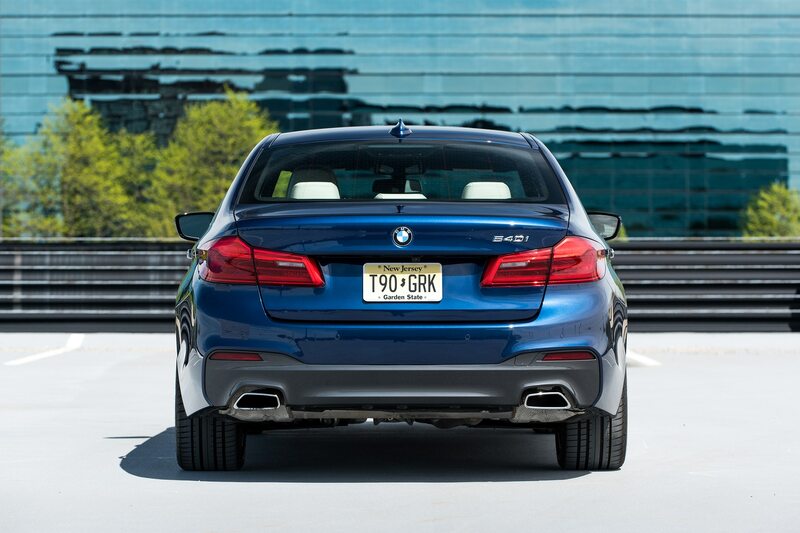 On all-wheel-drive models, BMW also offers rear-wheel steering. 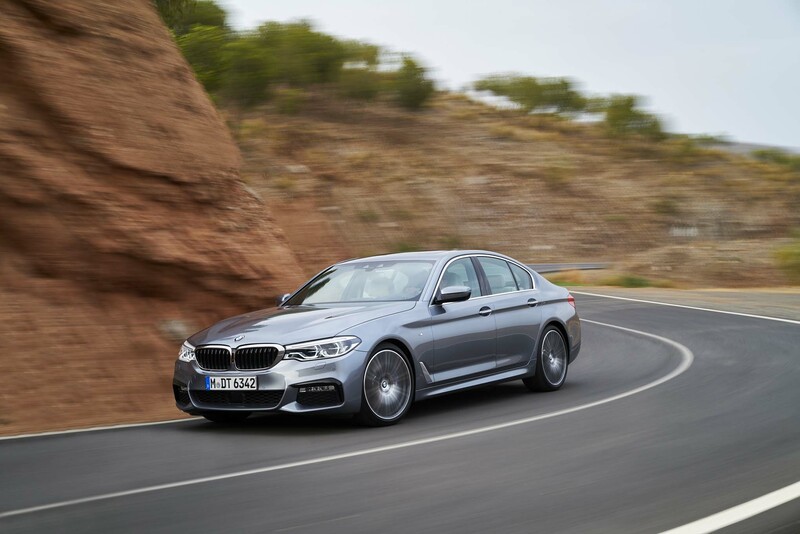 While the 540i is indeed very comfortable and controlled on pockmarked roads, even on smooth pavement it lacks the steering feel and chassis feedback that made the E39 such a treat. 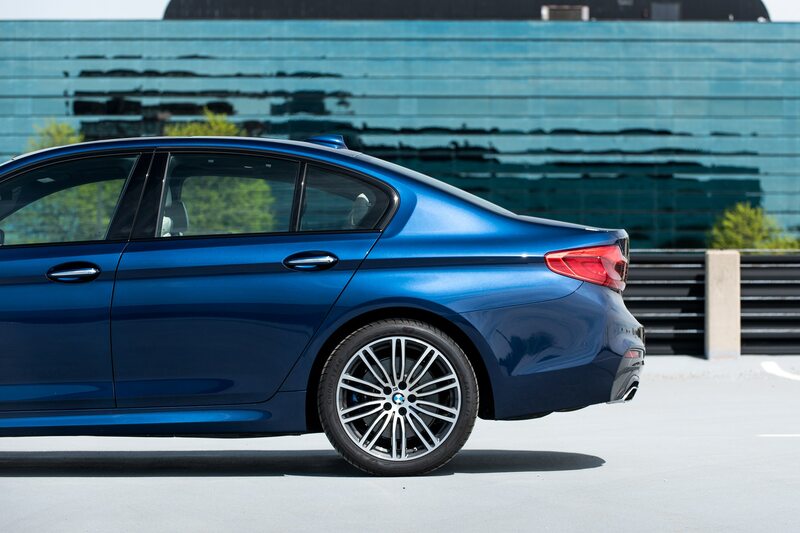 There’s seemingly too much of the 7 Series philosophy of executive comfort at work and not enough of the driver-focused mojo that remains the heart and soul of the 2 Series. 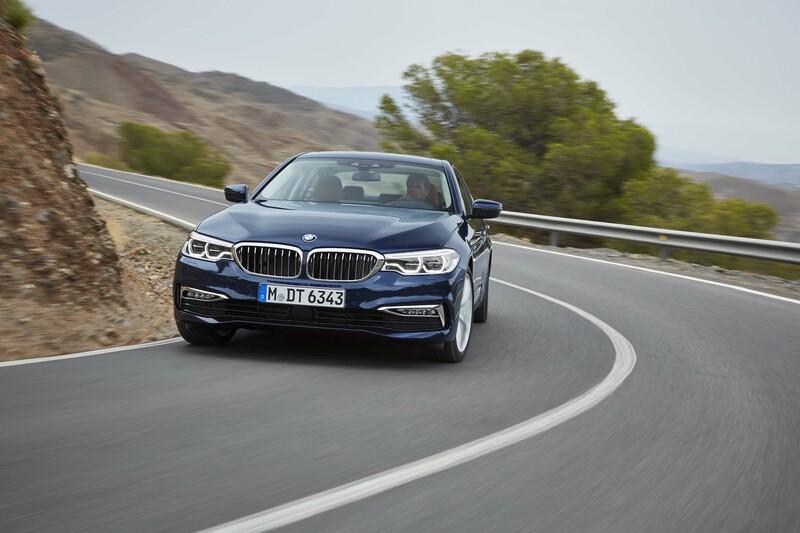 The 540i confidently hurtles itself down the road, tackling twisting sections of pavement with calmness and composure, but no part of me feels involved with the experience. 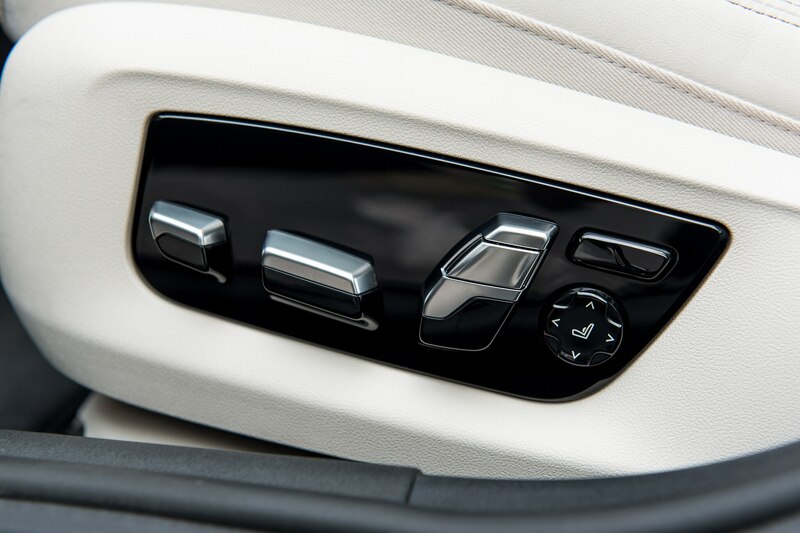 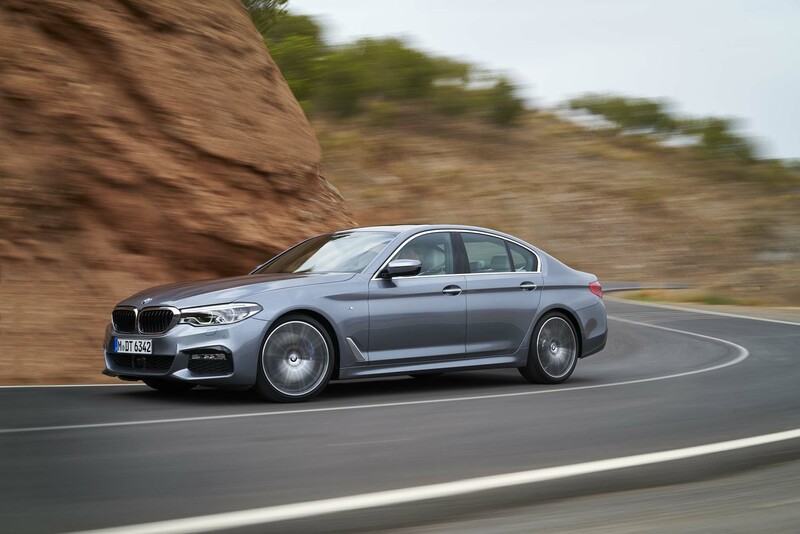 Even equipped with rear-wheel drive instead of all-wheel drive, the chassis doesn’t transmit enough information to the driver about what’s going on before it’s too late and you’ve exhausted the grip of the tires. 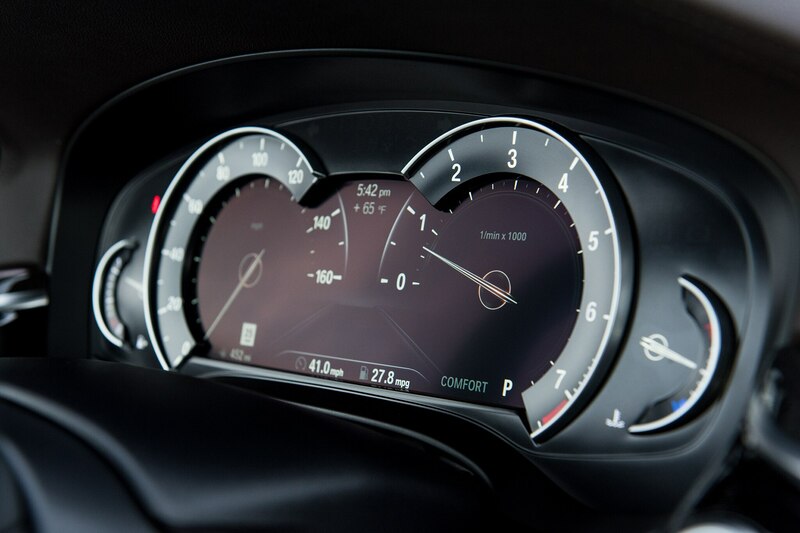 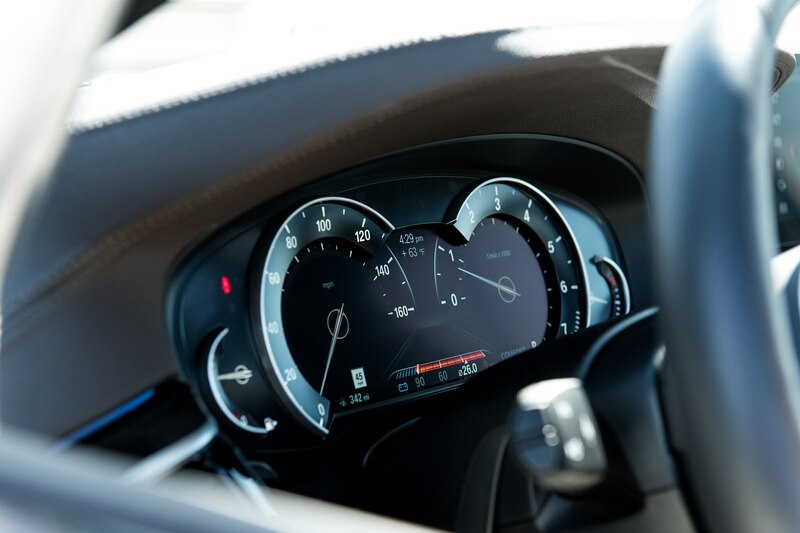 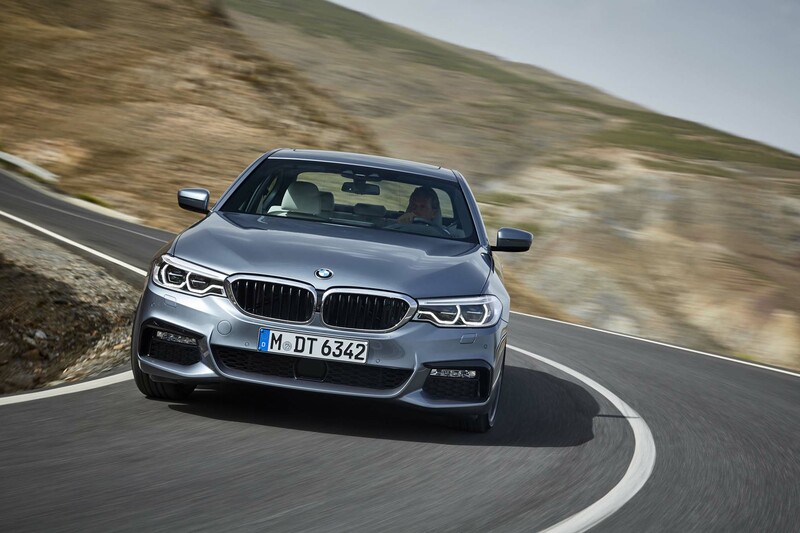 While the trappings of sportiness are there, heavier steering, red-colored gauges, and adaptive bolsters that keep you snug in your comfy seat don’t constitute the essence of a sport sedan. 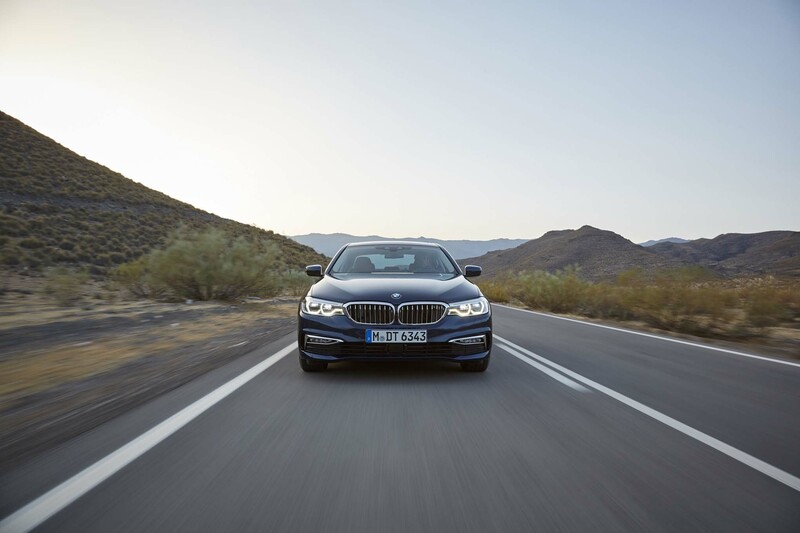 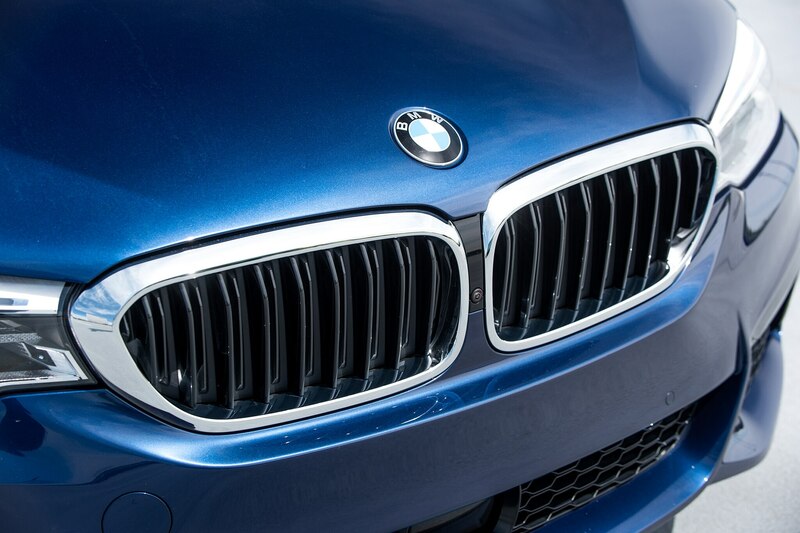 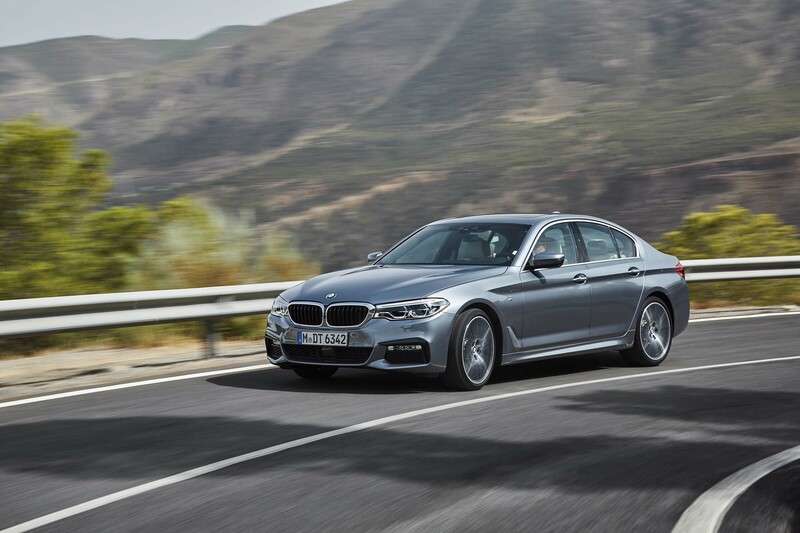 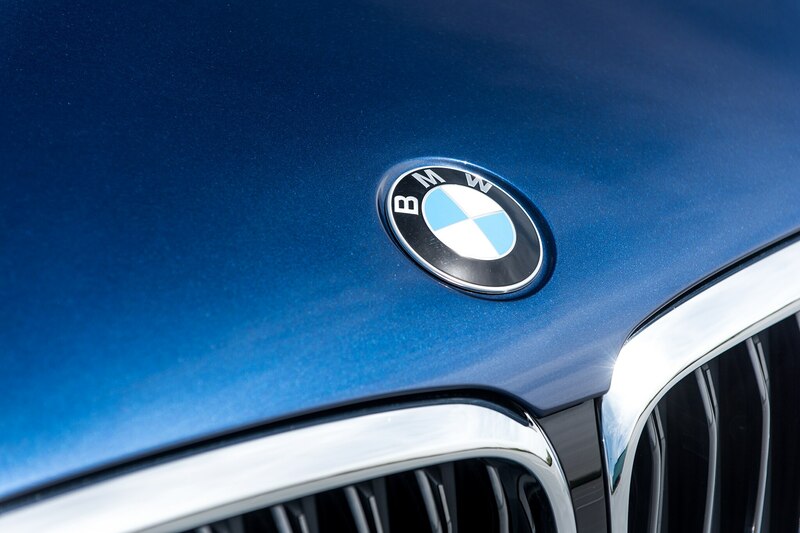 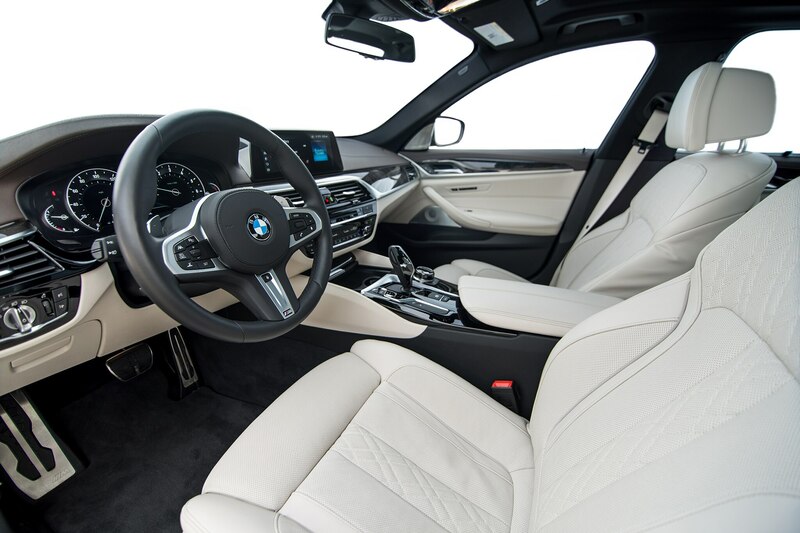 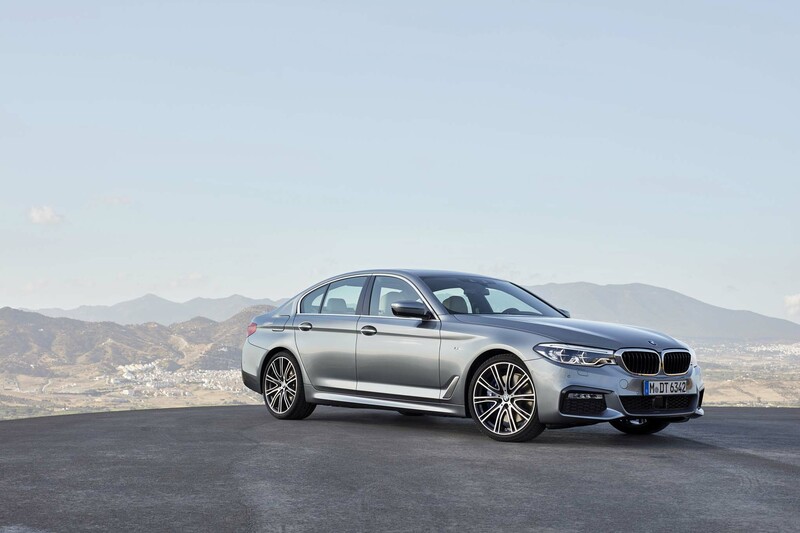 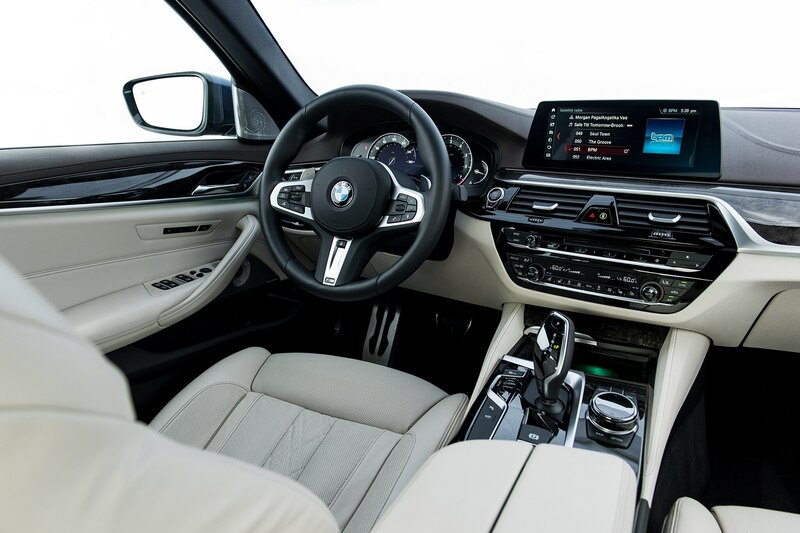 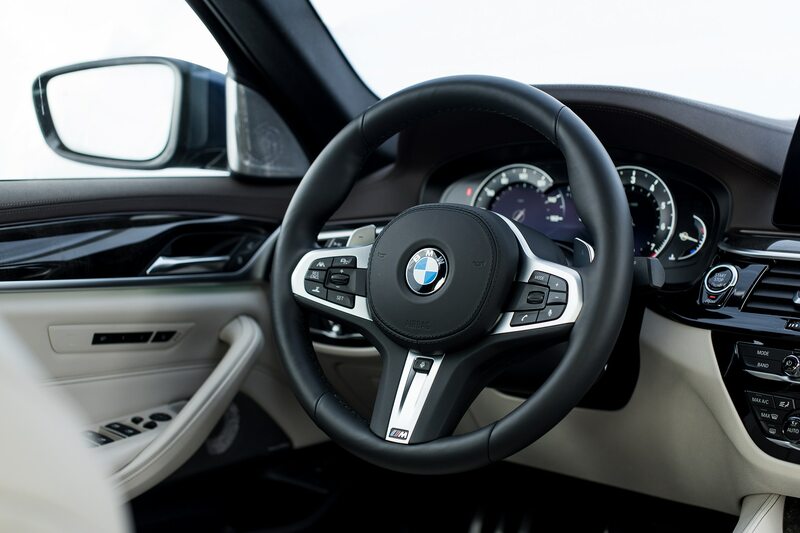 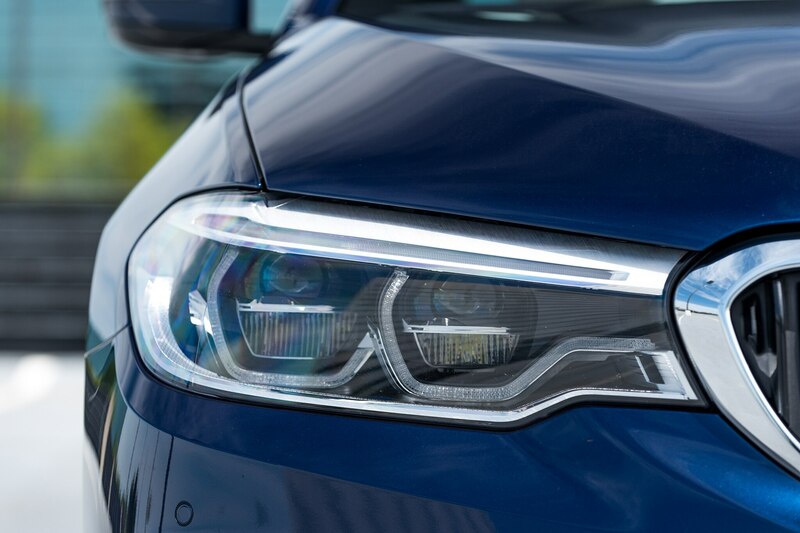 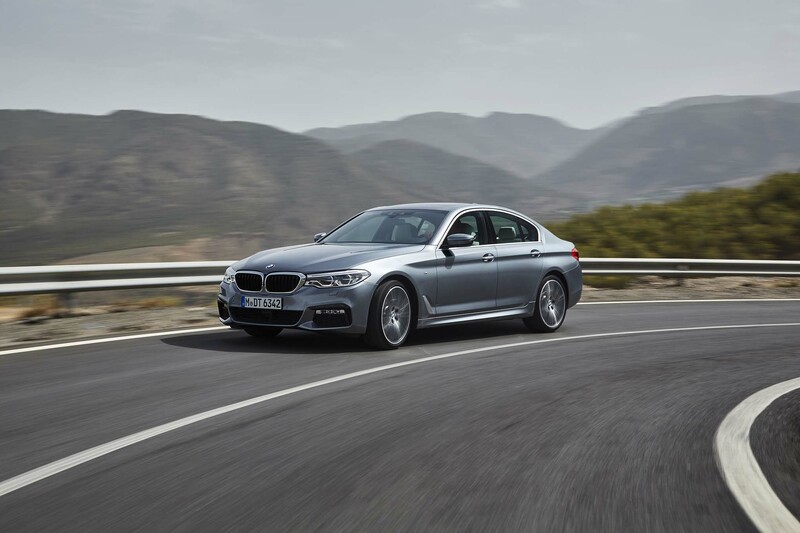 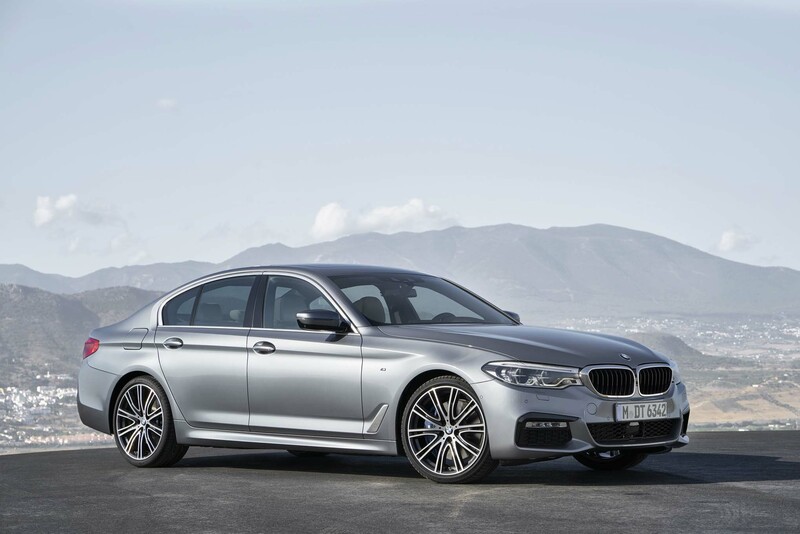 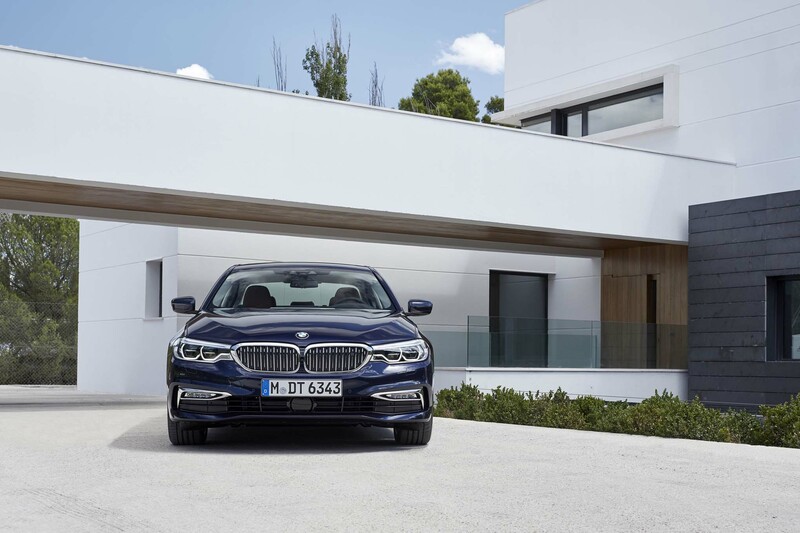 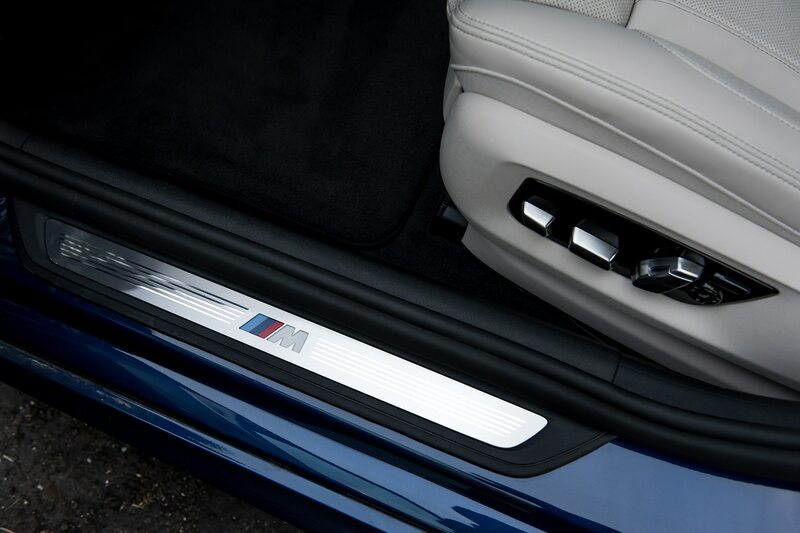 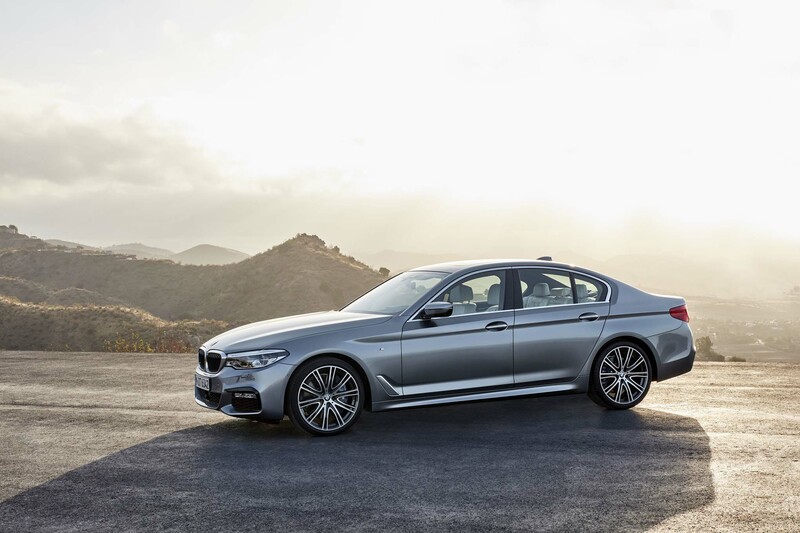 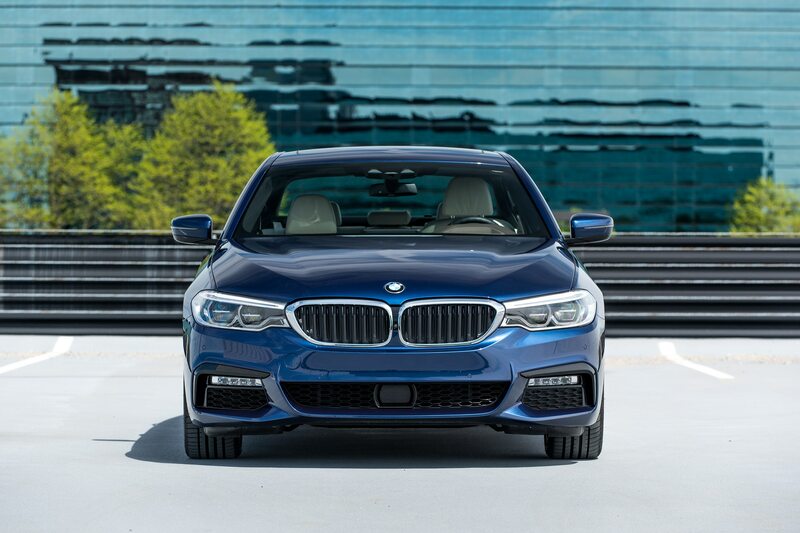 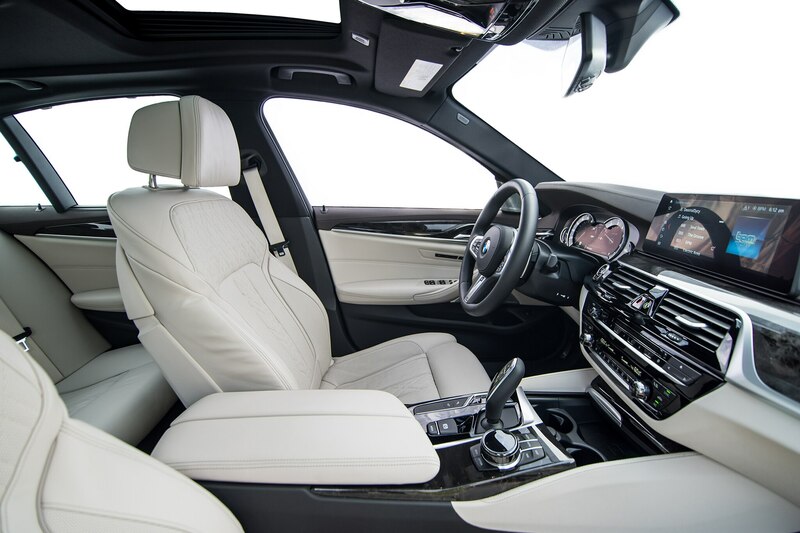 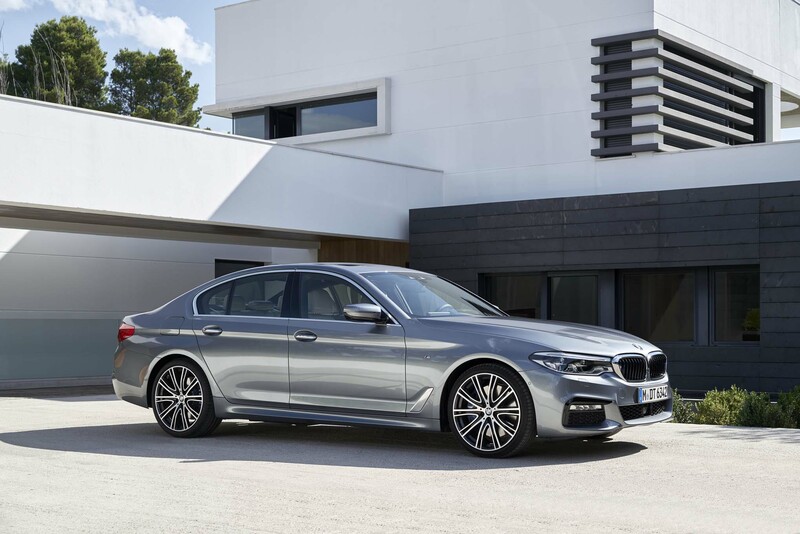 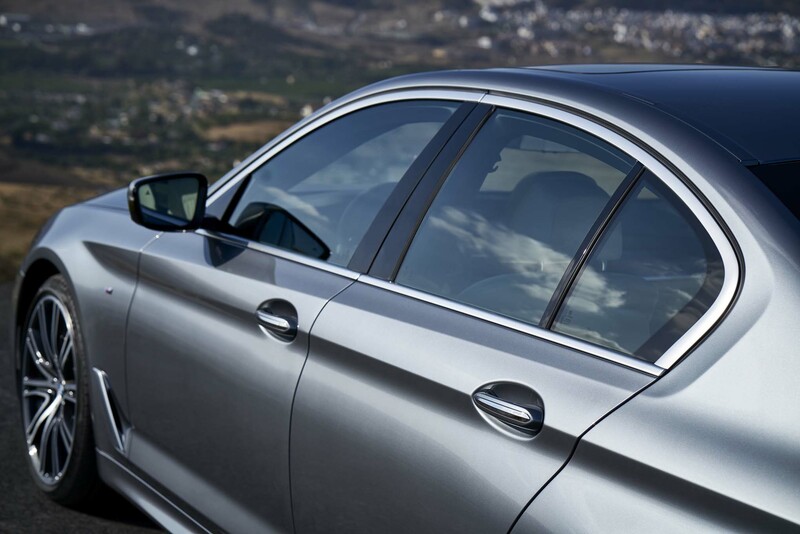 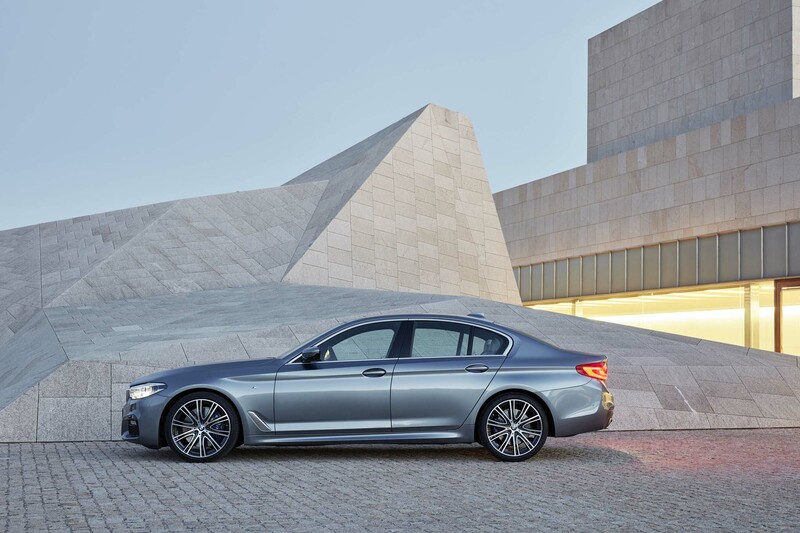 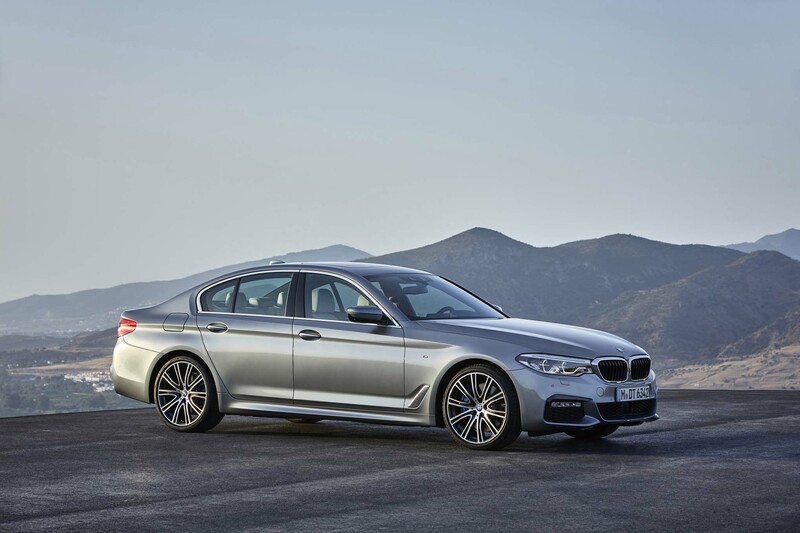 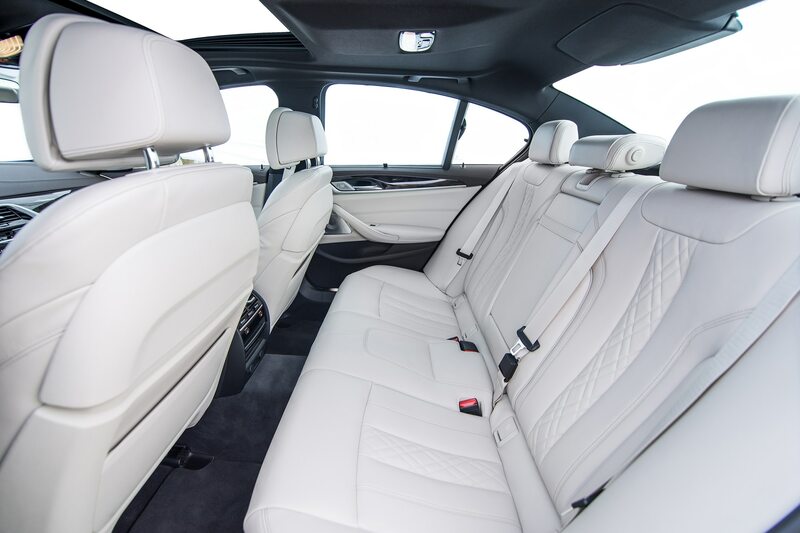 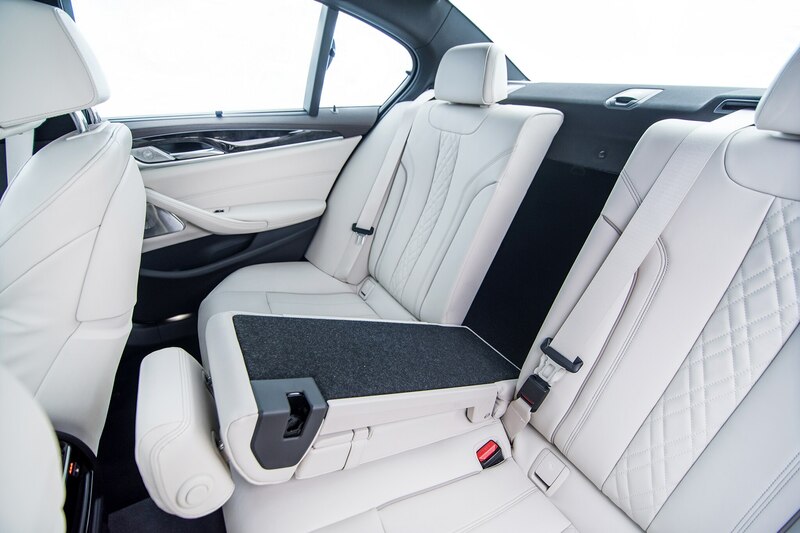 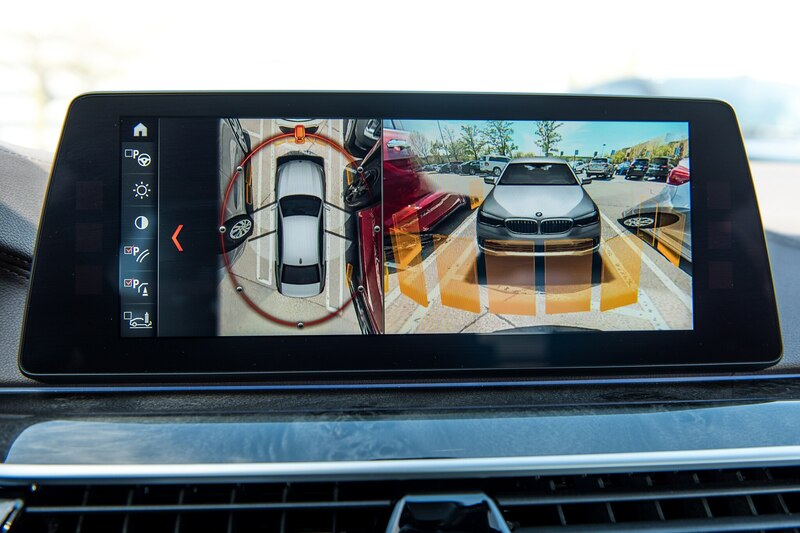 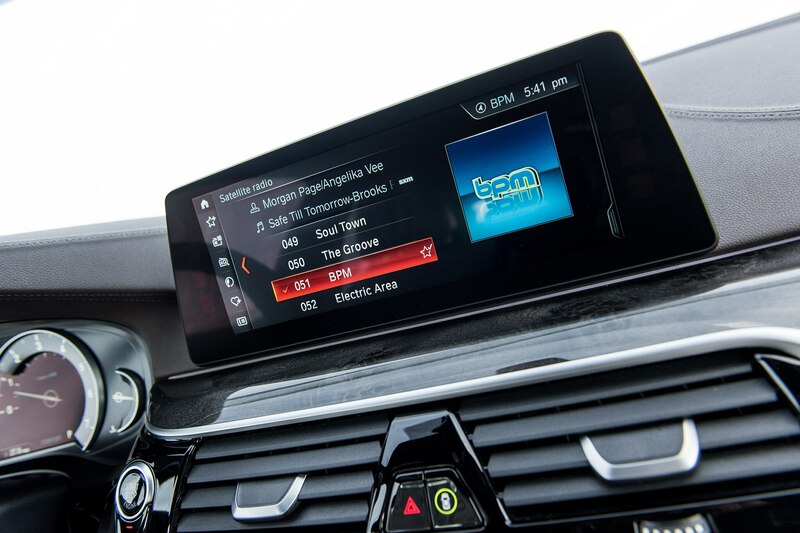 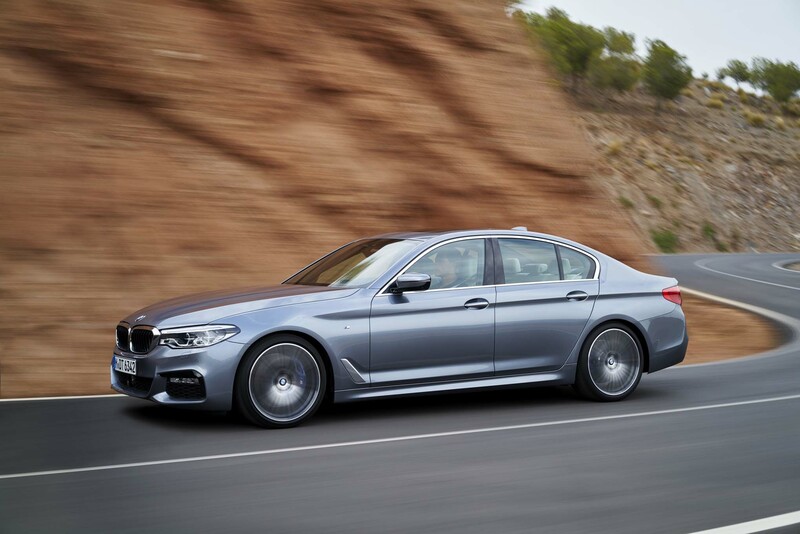 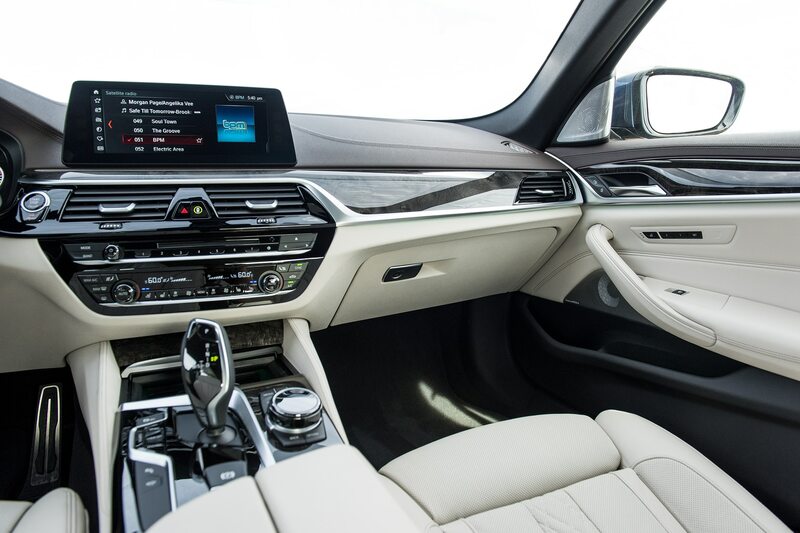 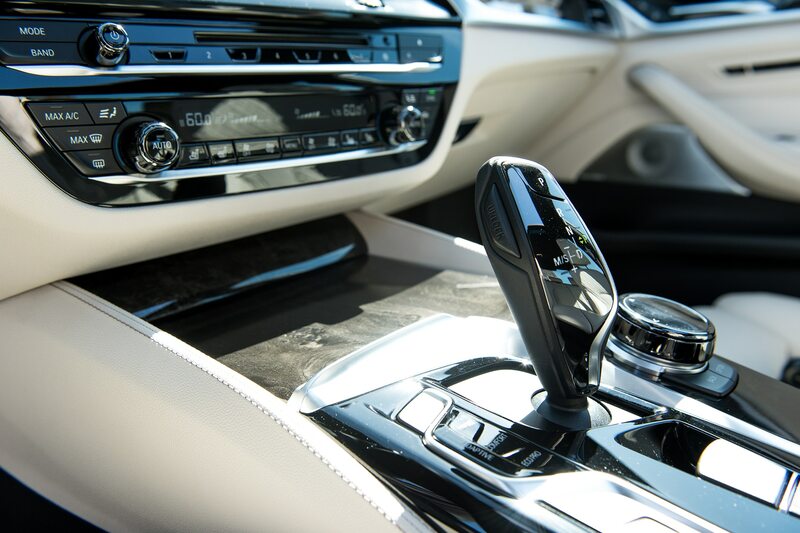 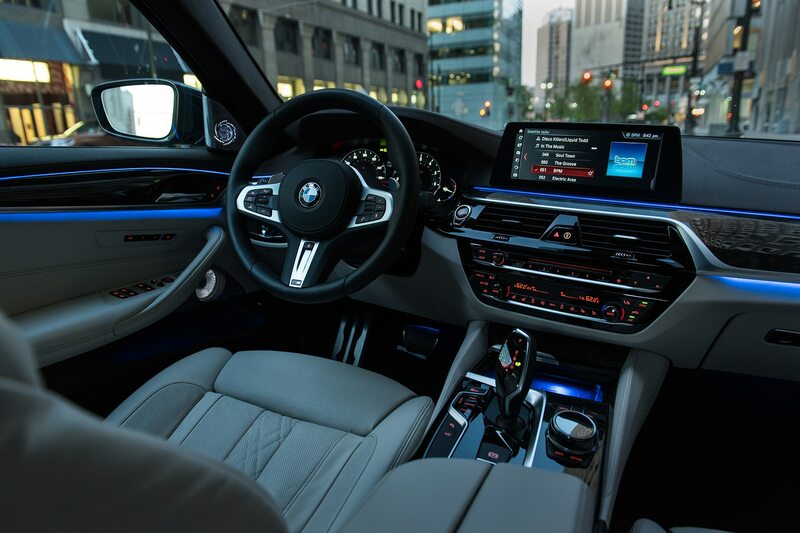 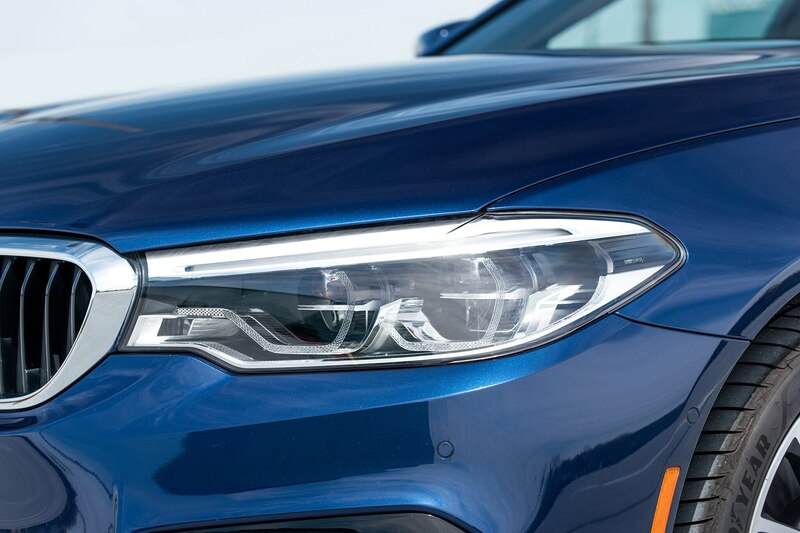 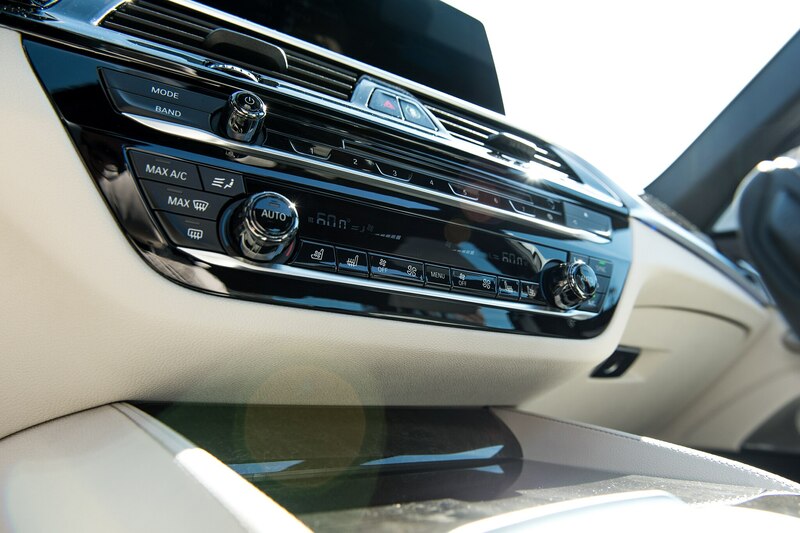 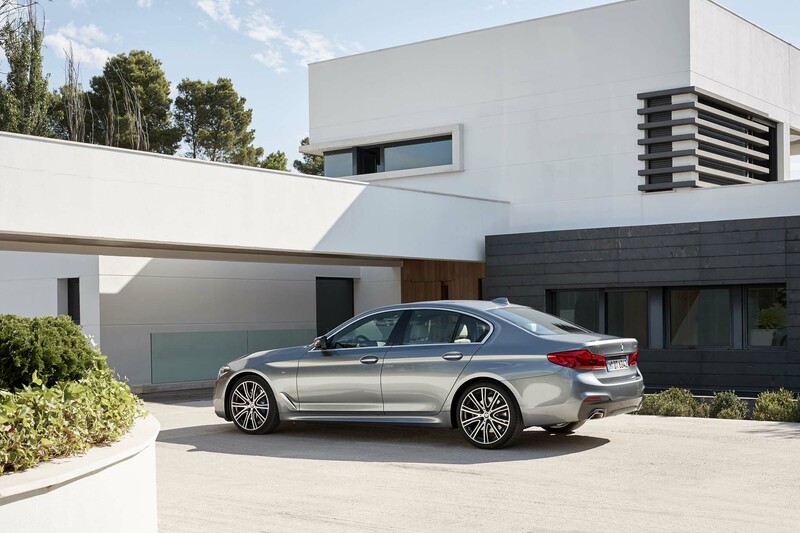 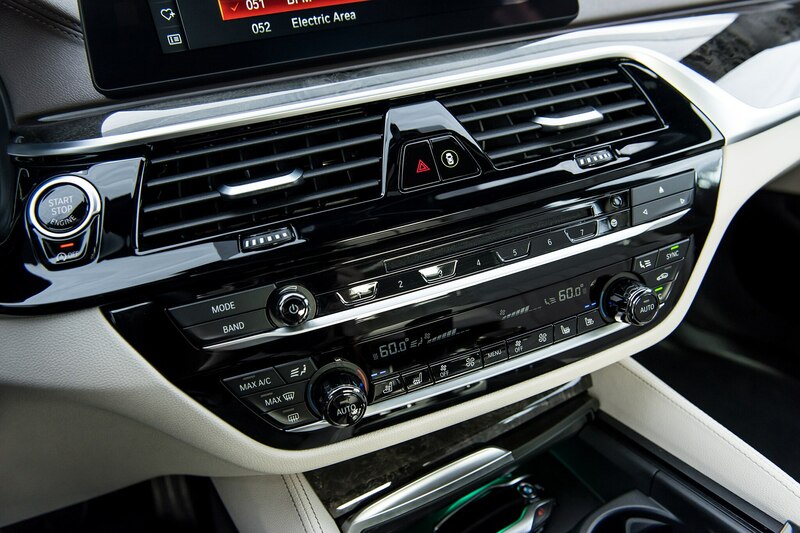 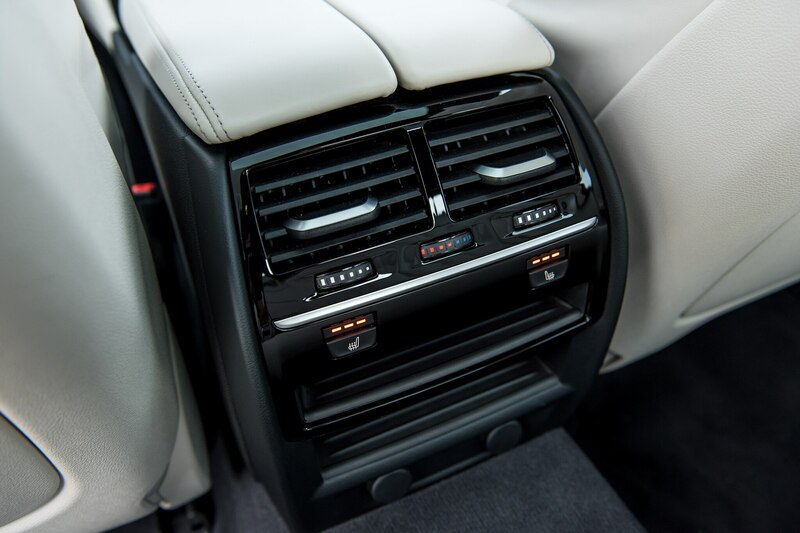 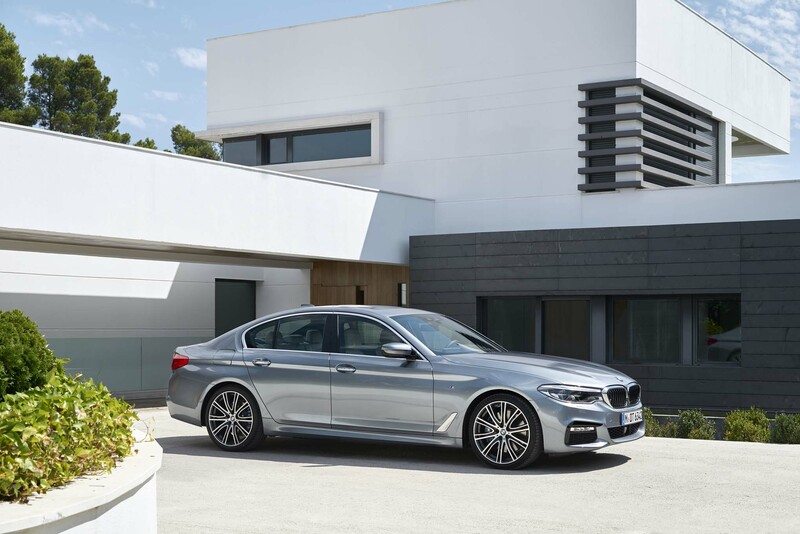 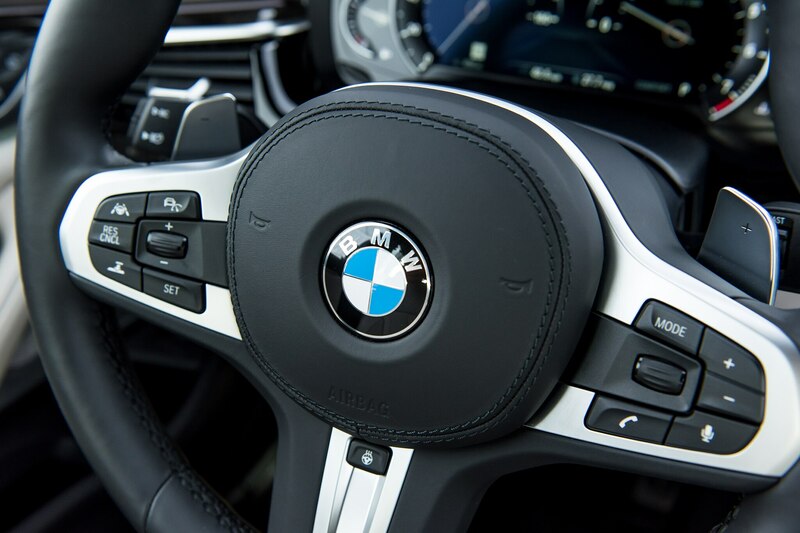 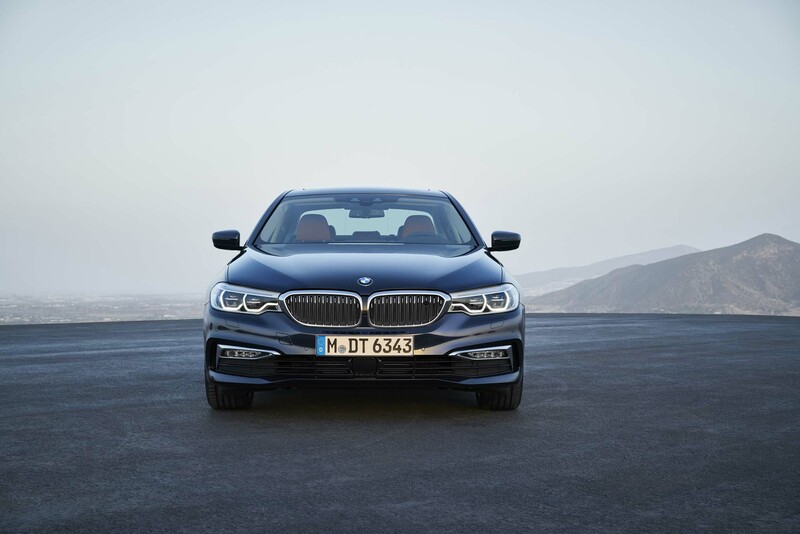 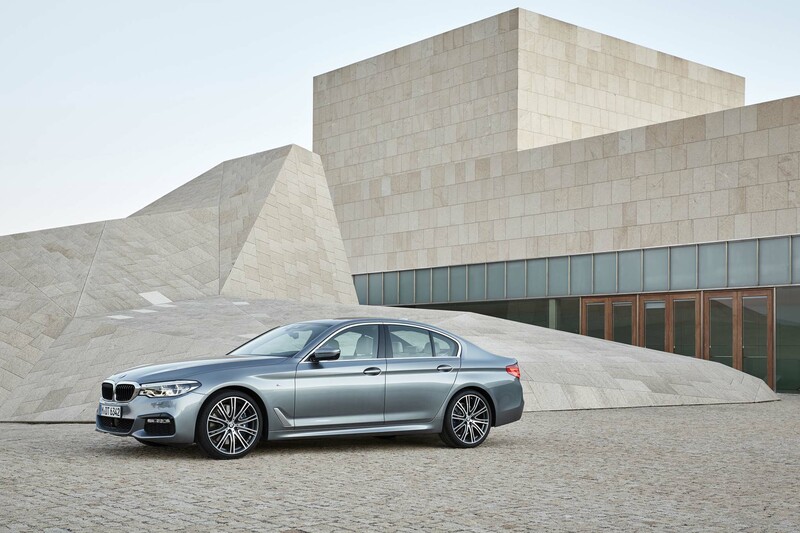 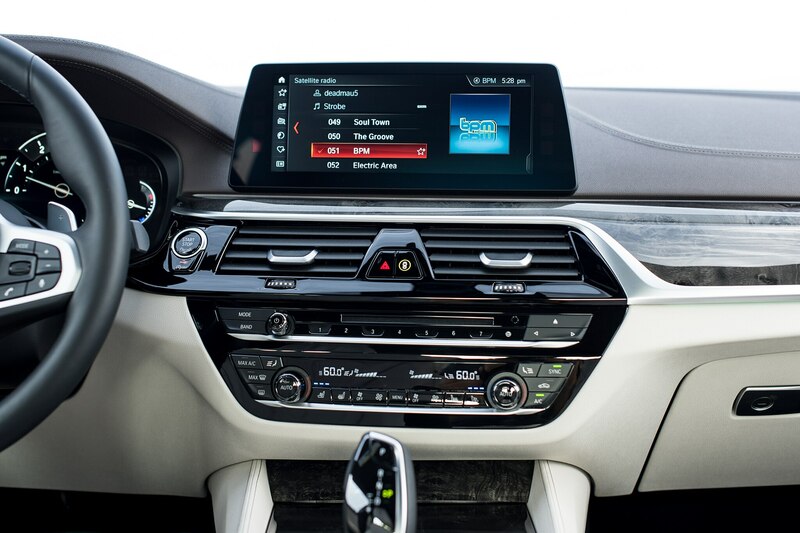 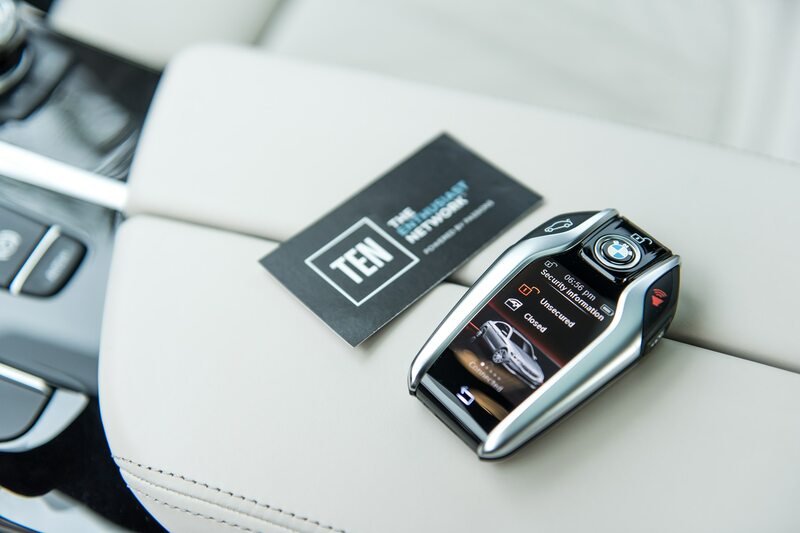 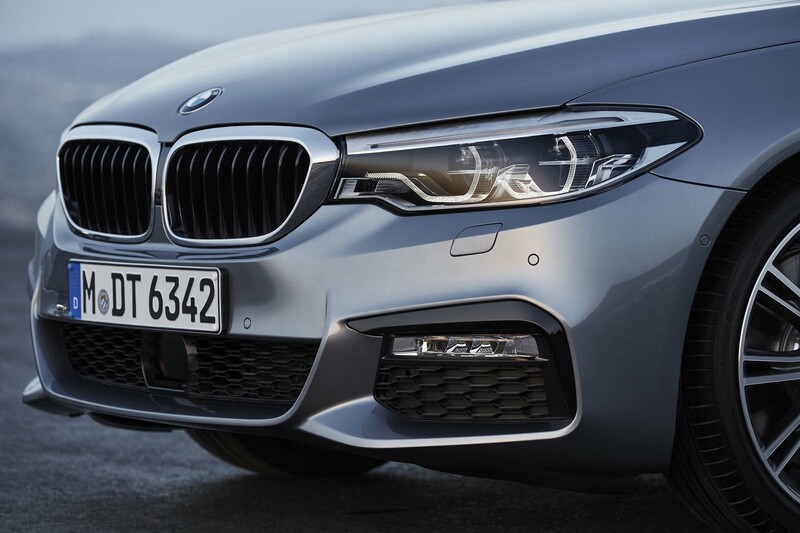 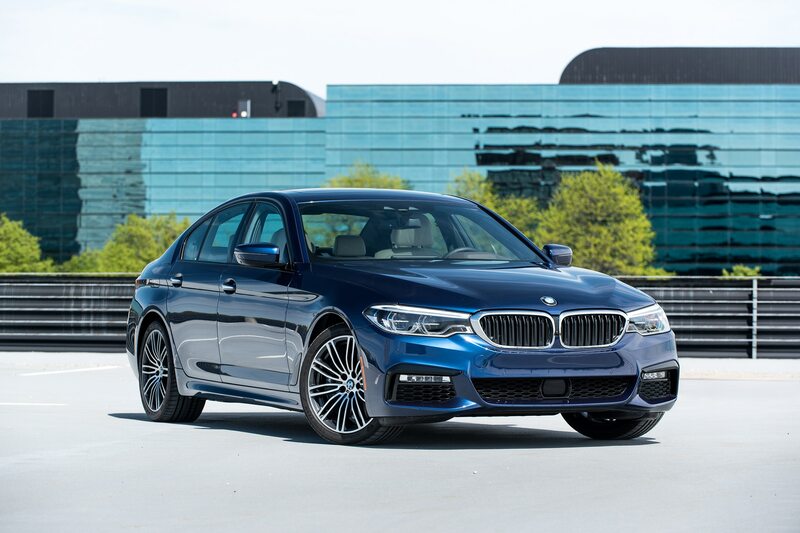 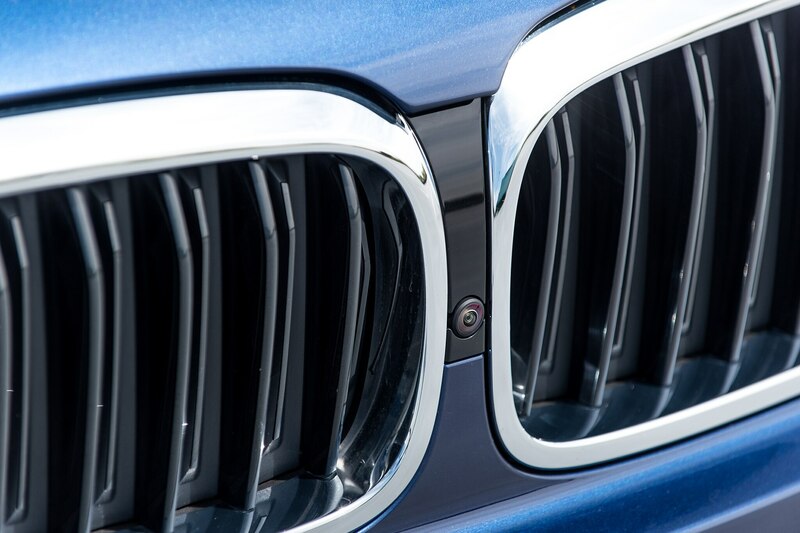 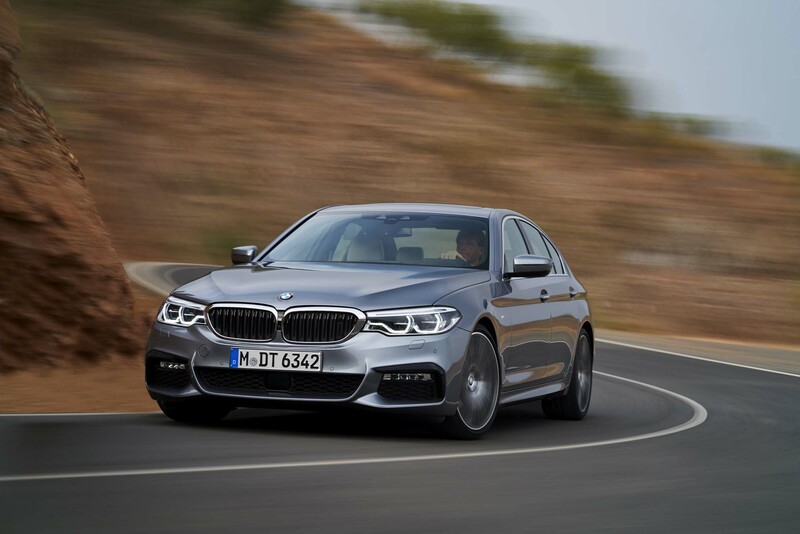 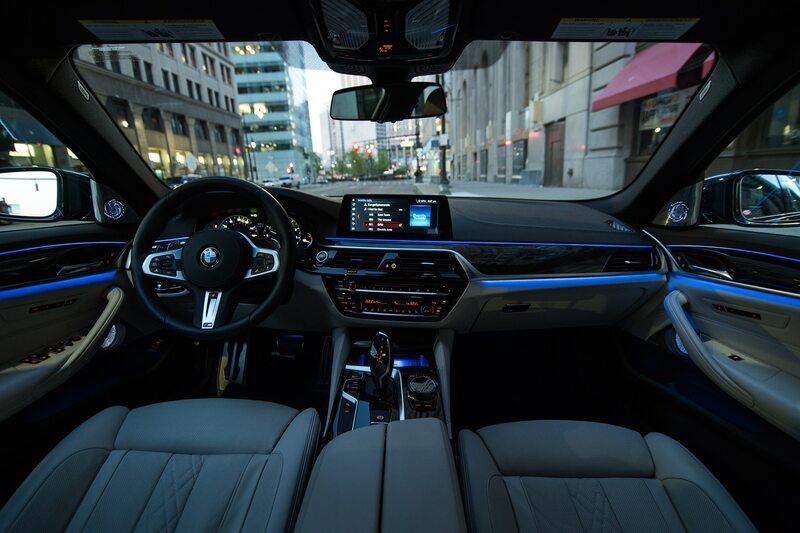 Those features barely scratch the surface of the features the 5 Series offers, and from the perspective of a luxury sedan, BMW has hit a home run. 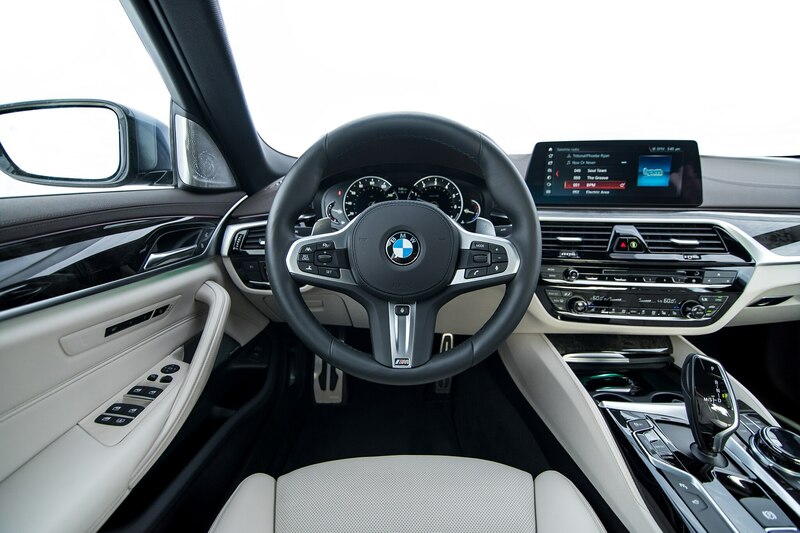 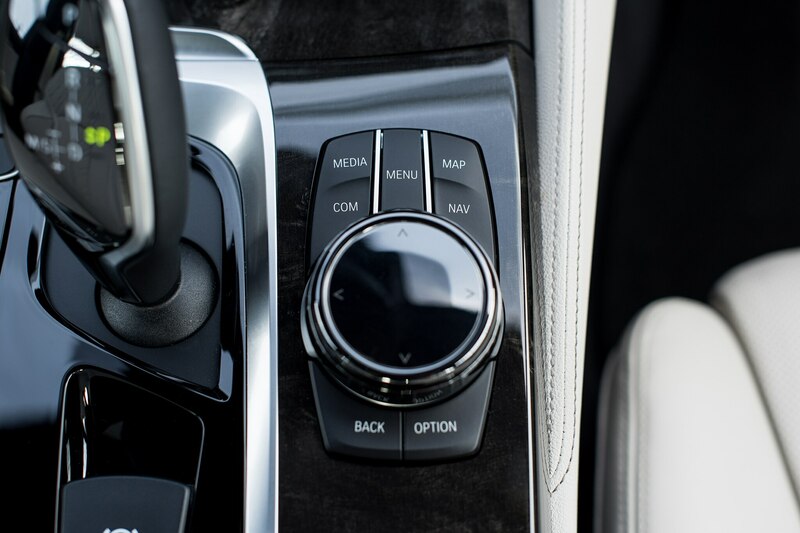 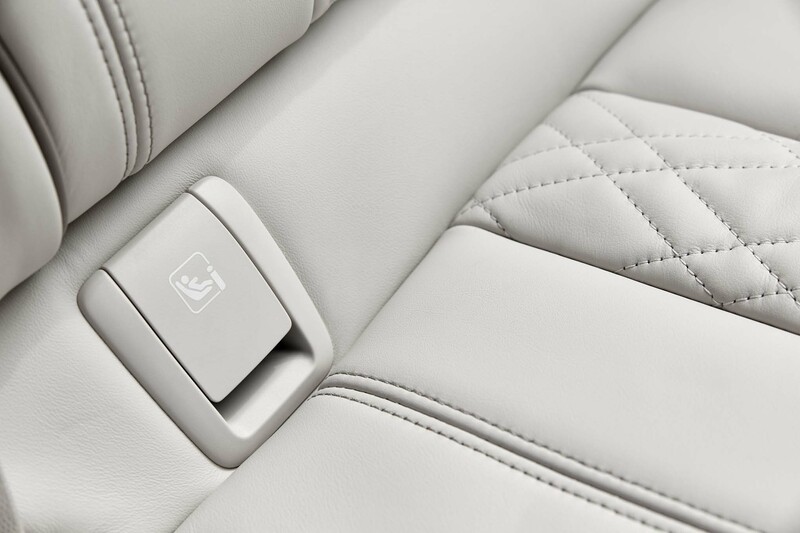 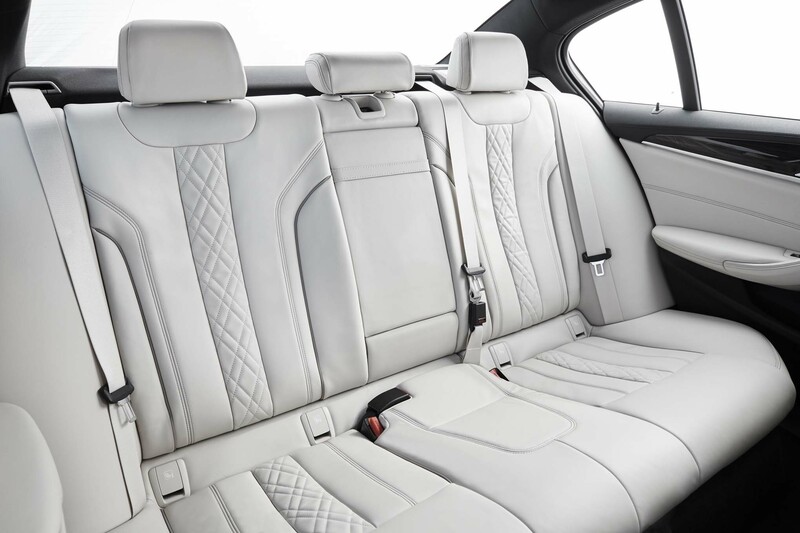 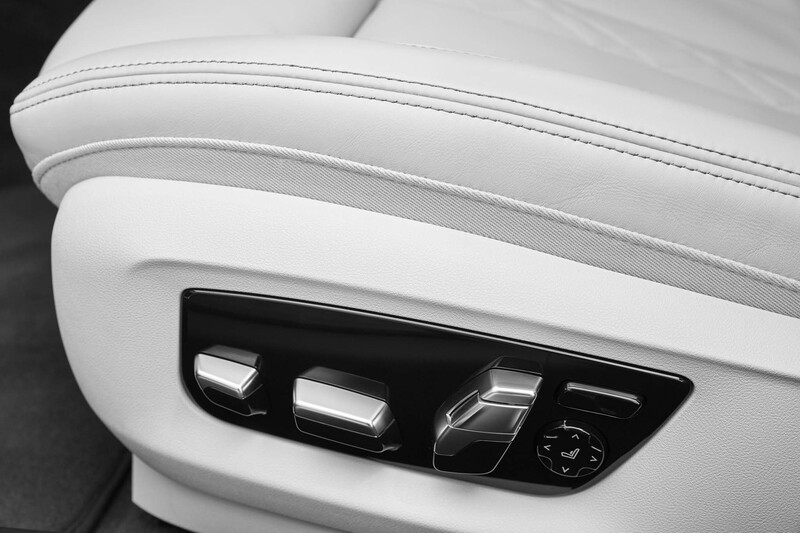 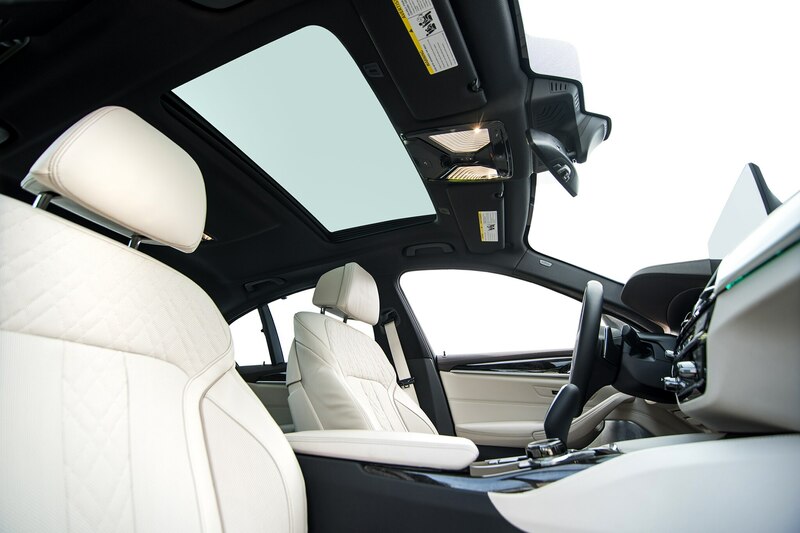 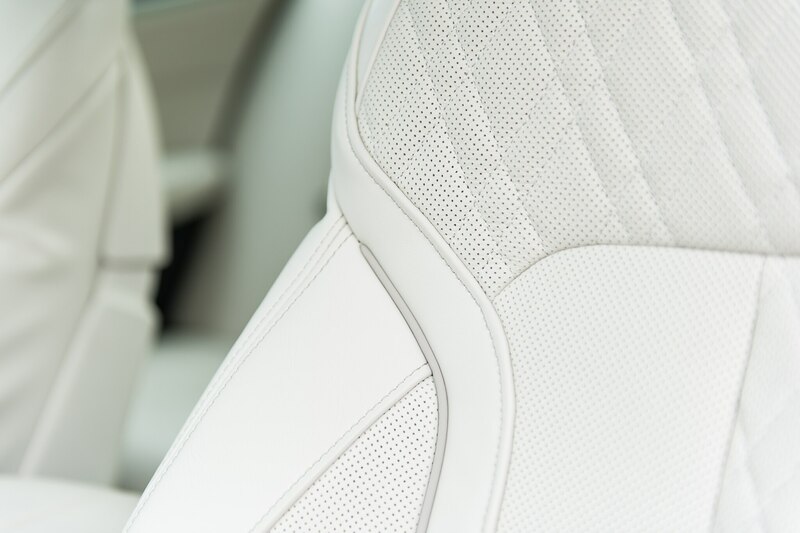 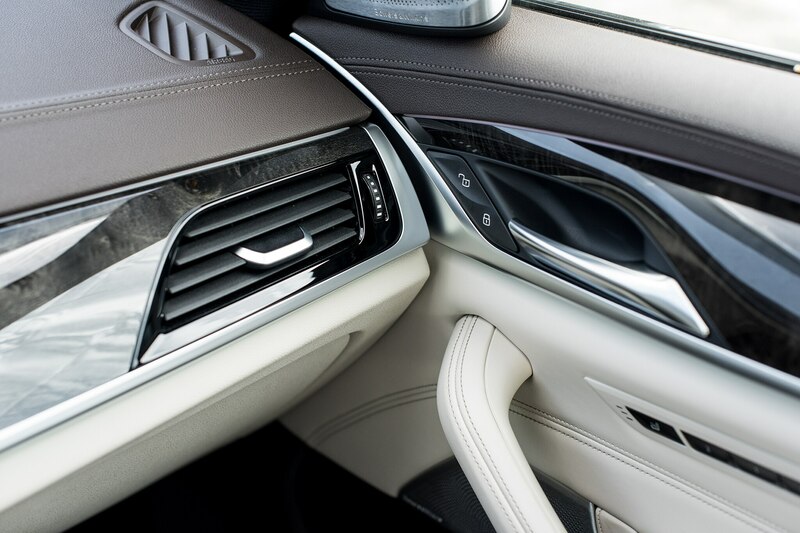 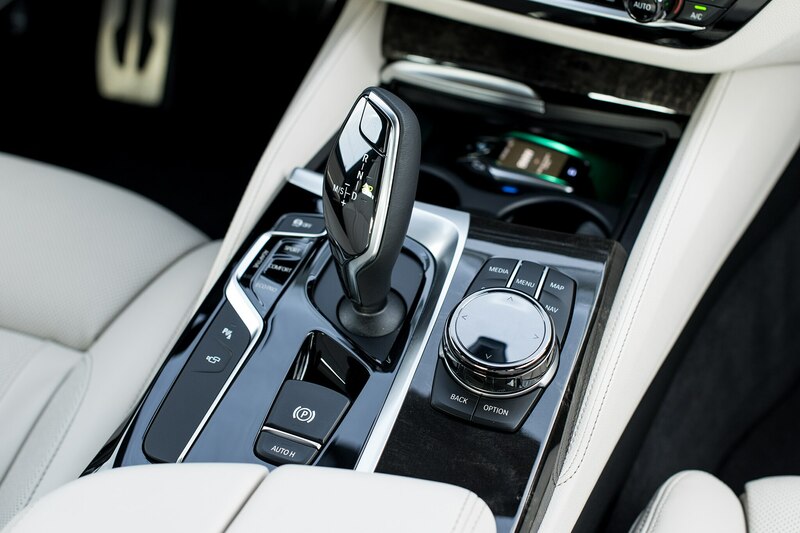 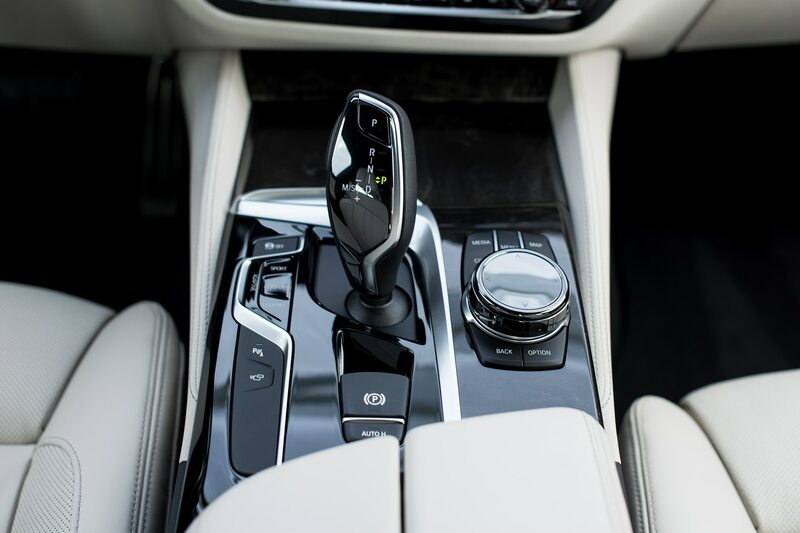 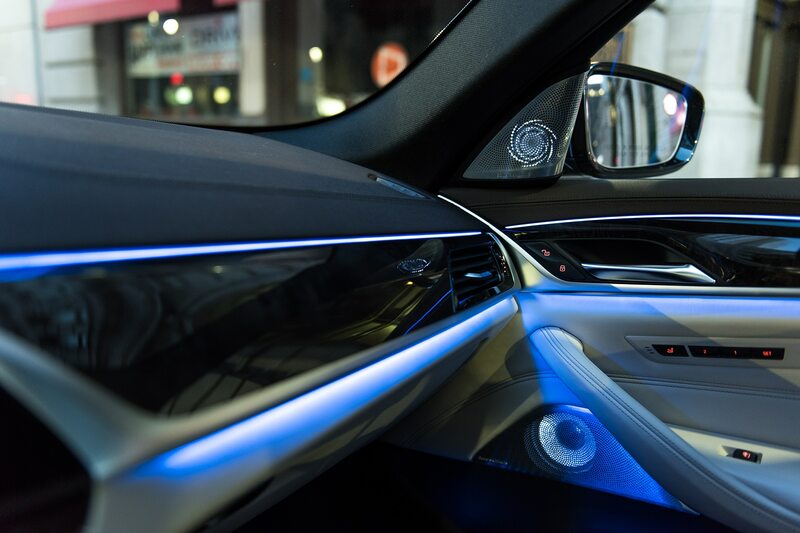 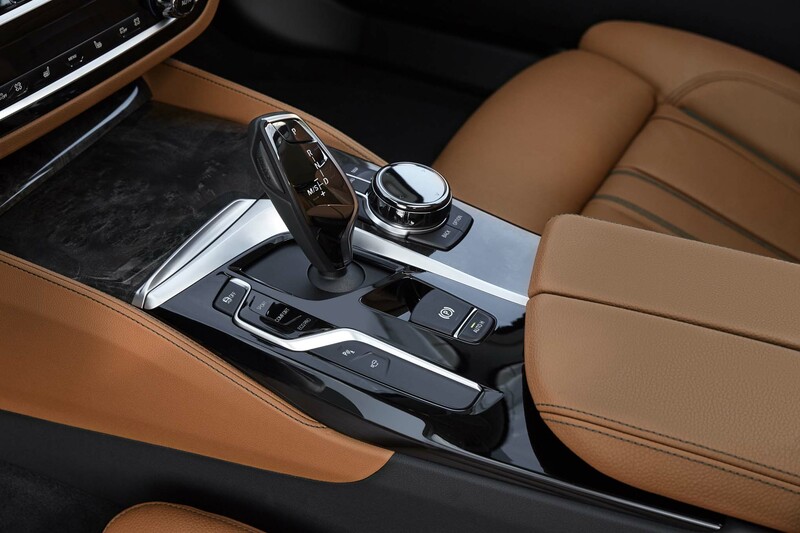 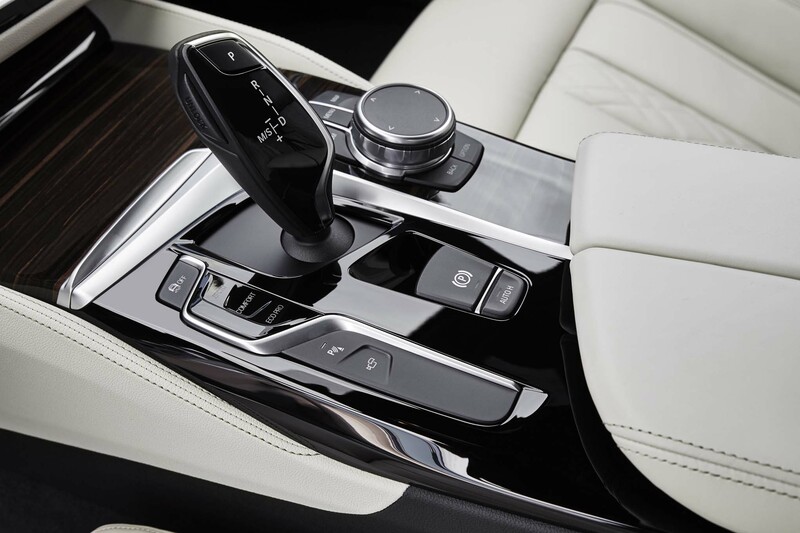 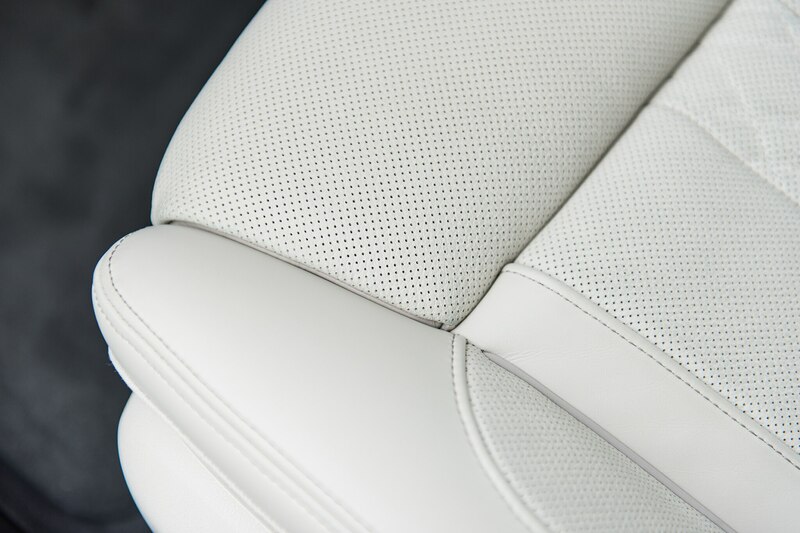 The interior is handsome and well-designed, while the mix of materials from ivory-colored Nappa leather, to dark wood, to aluminum, and piano black trim all convey a sense of warmth and futuristic cleanliness. 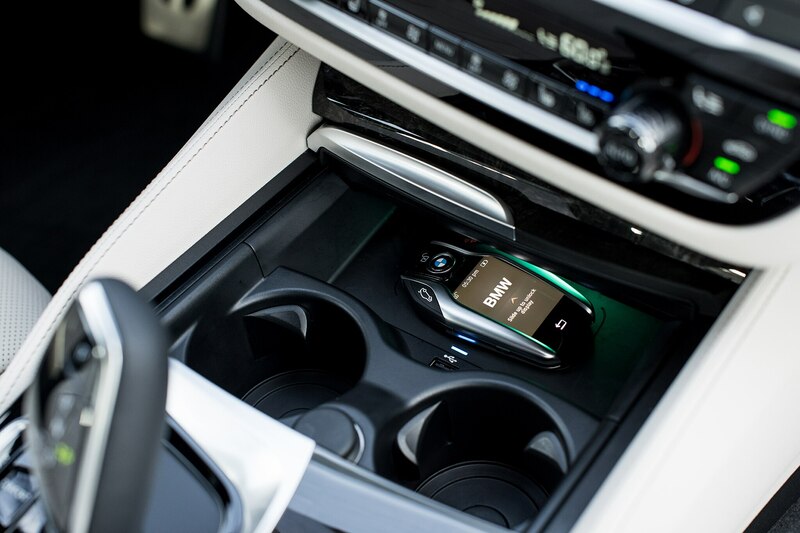 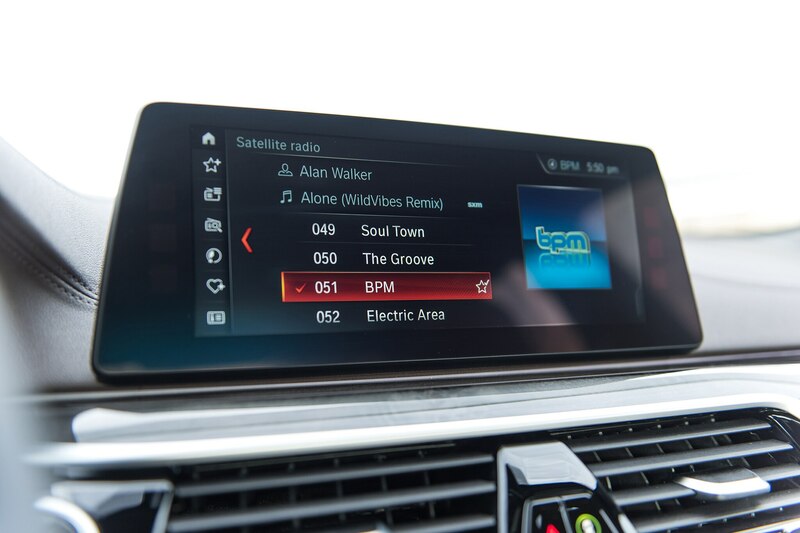 The new iDrive is easy to use either by rotary controller or touchscreen, and there’s also the option to mirror your smartphone with Android Auto or Apple CarPlay ($300). 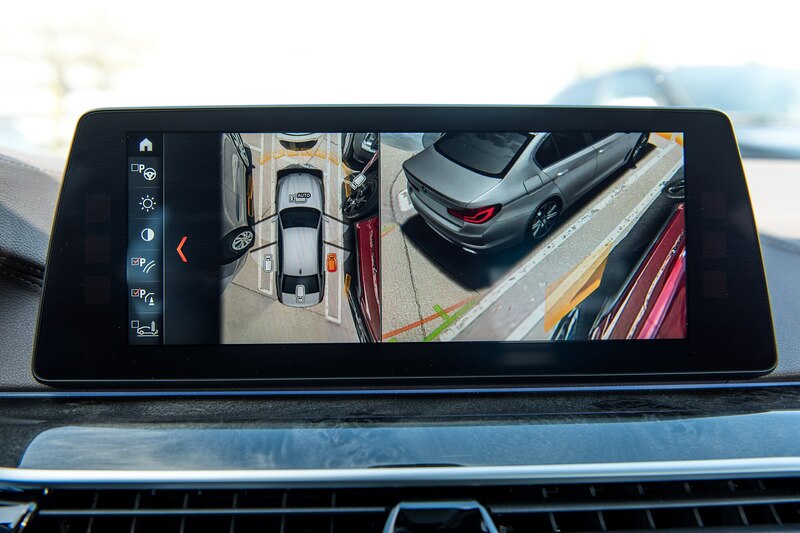 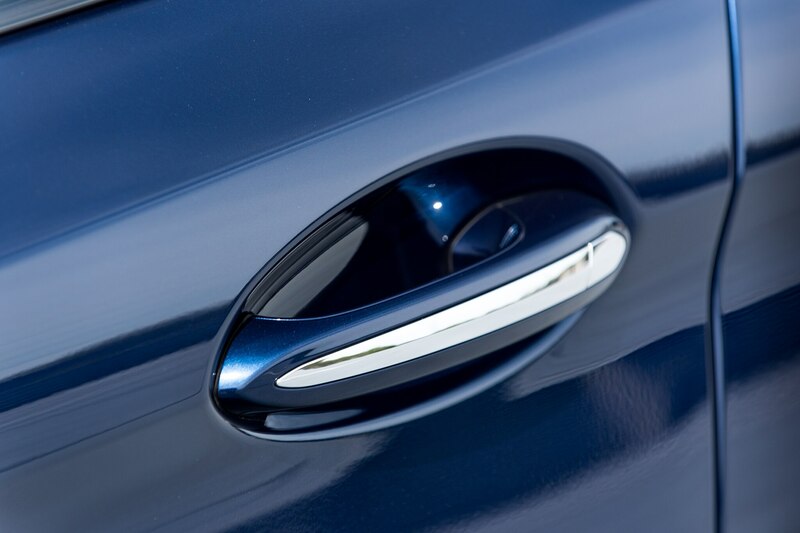 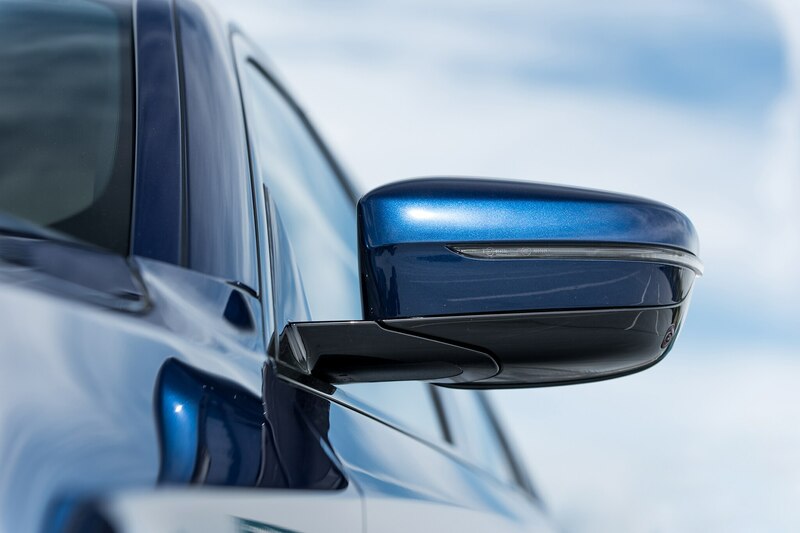 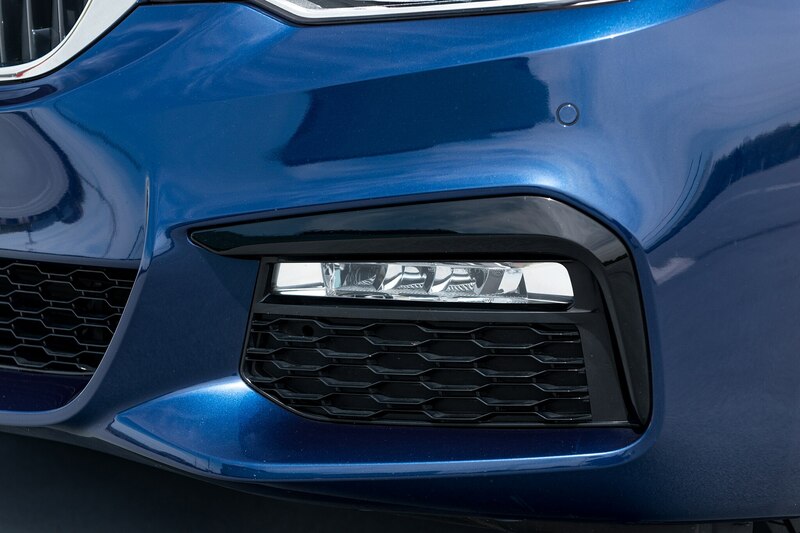 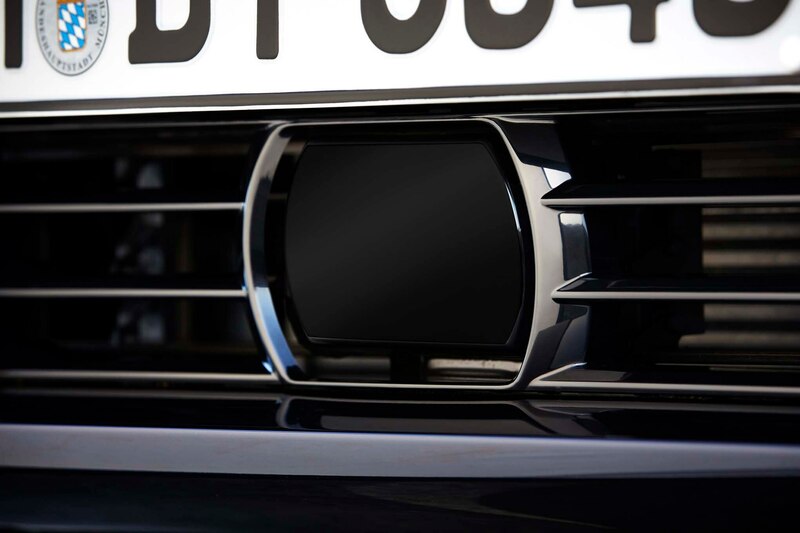 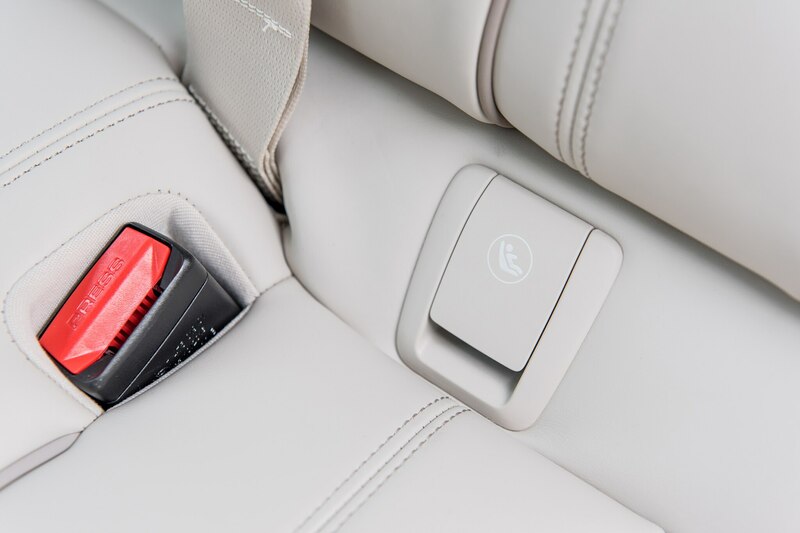 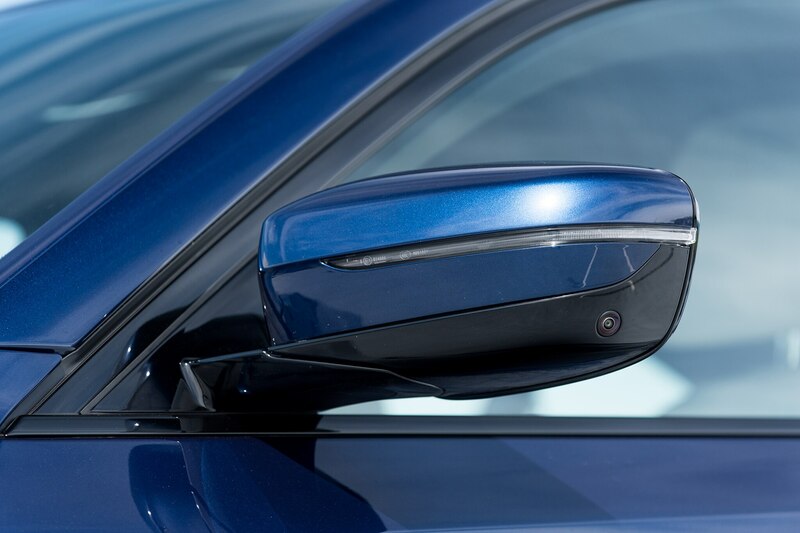 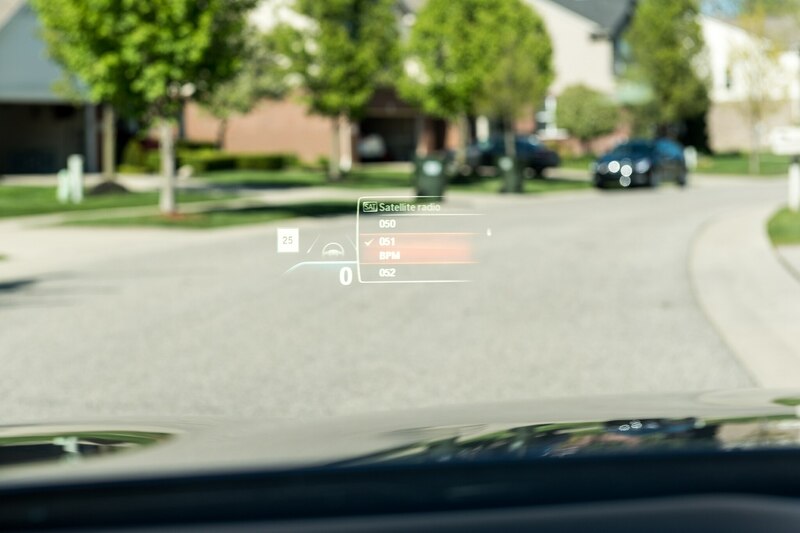 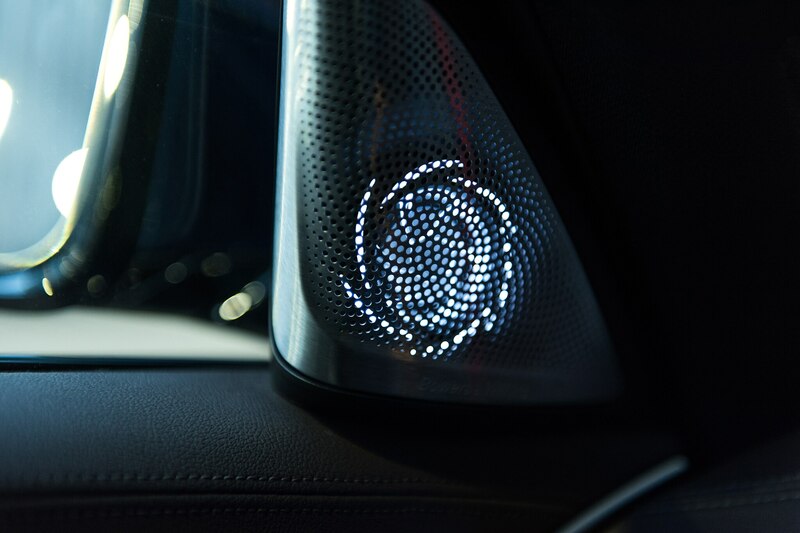 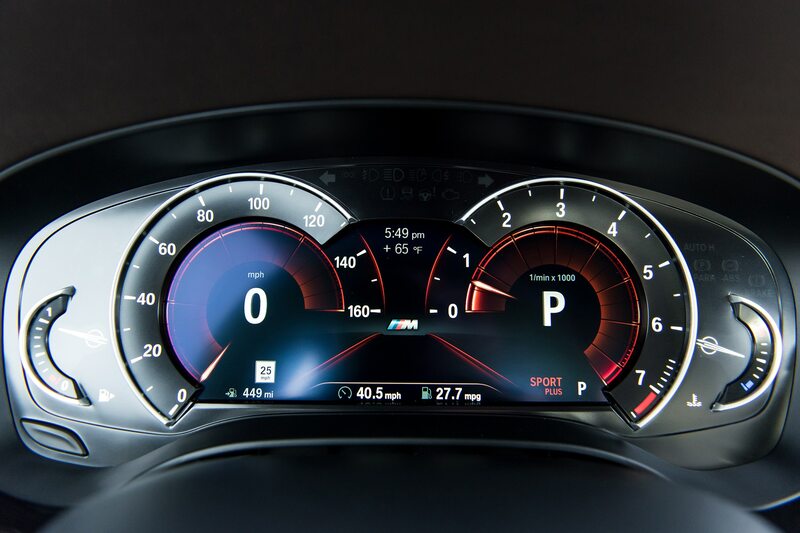 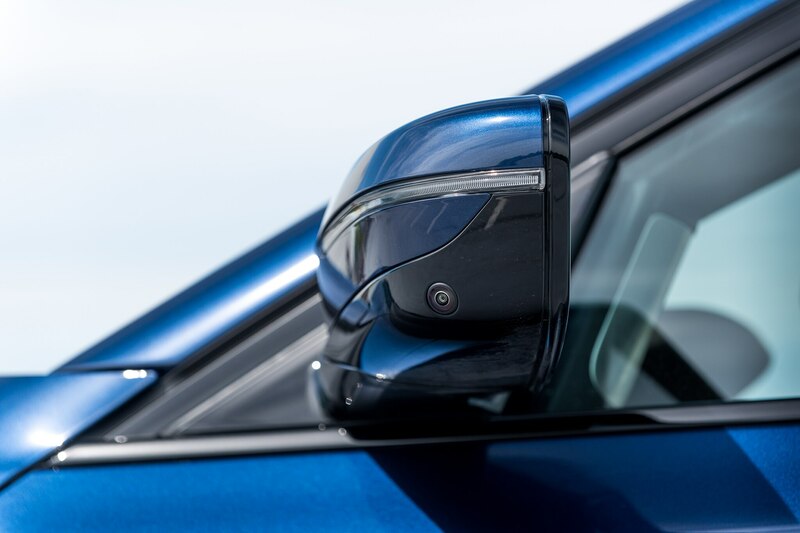 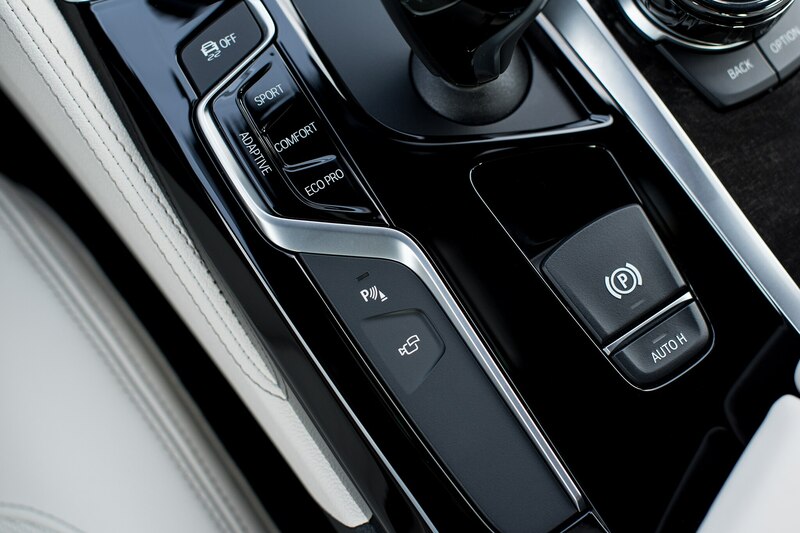 Active safety technologies are plentiful, with the full suite of adaptive cruise control with traffic jam assist, lane-keep assist, blind-spot monitoring, active park control with parking sensors, a 360-degree camera, Wi-Fi hotspot, keyless entry, wireless charging, and gorgeous color head-up display. 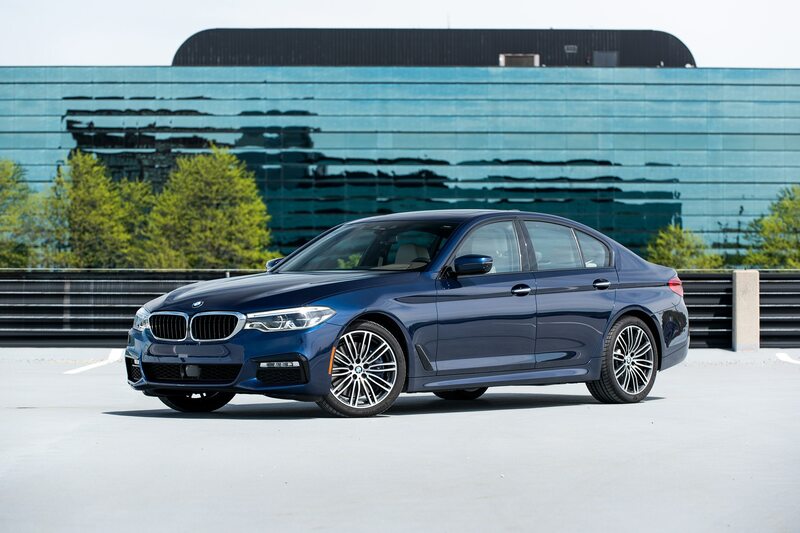 None of these come cheap however, as all of this tech is encapsulated within the Driving Assistance ($1,800), Driver Assistance Plus ($1,400), Driver Assistance Plus II ($1,700), and Premium packages ($1,950). 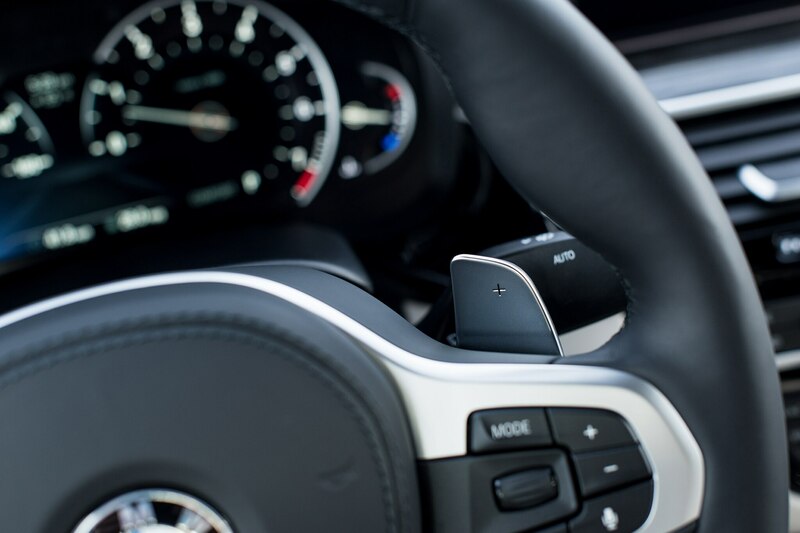 Want remote parking with the fancy digital-display key? 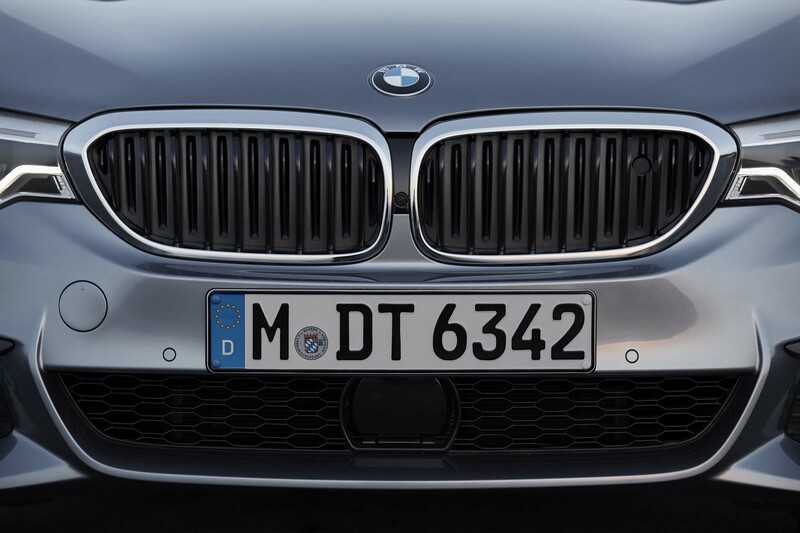 $750. 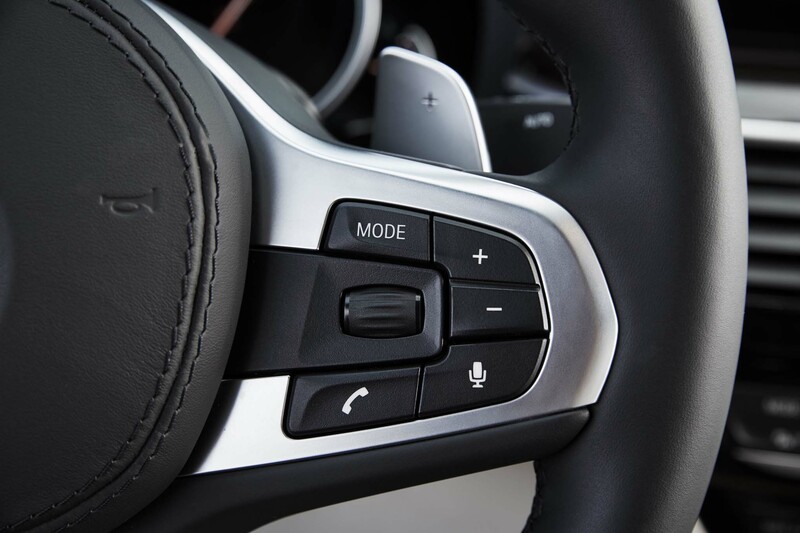 Gimmicky gesture control? 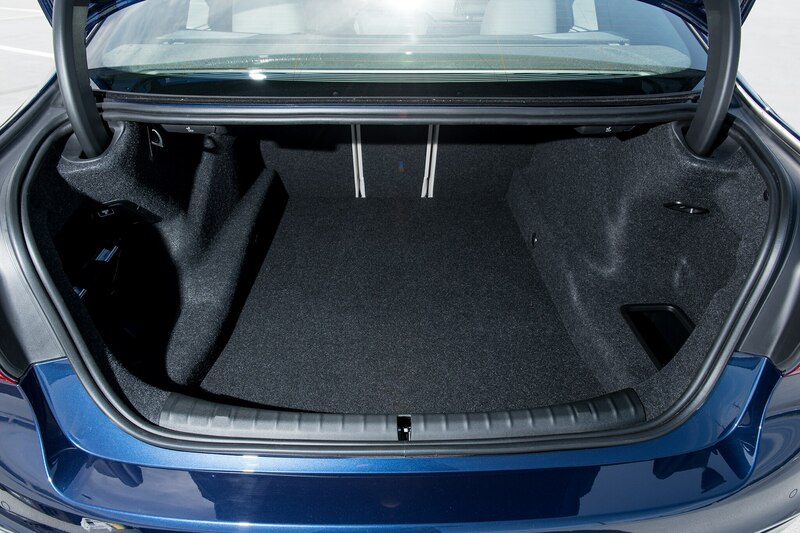 $190. 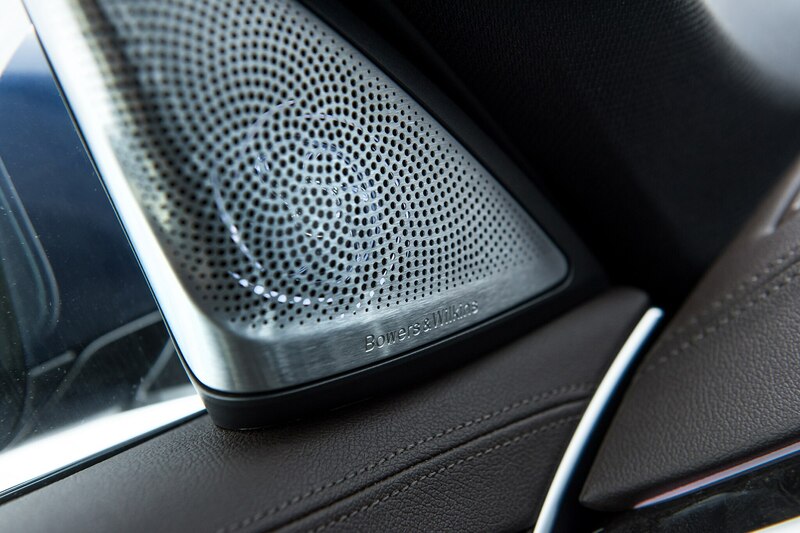 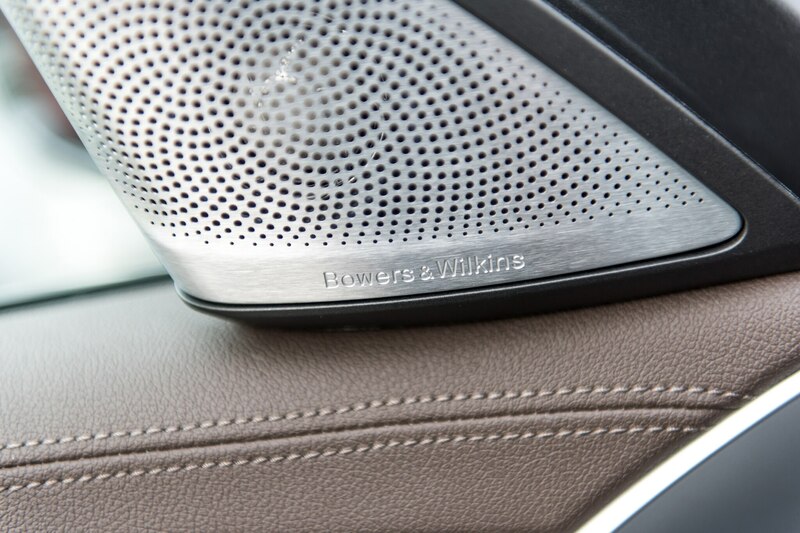 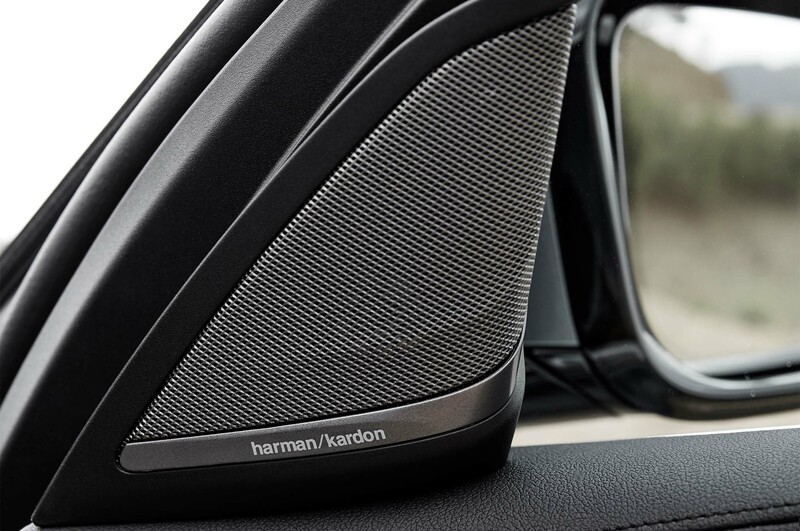 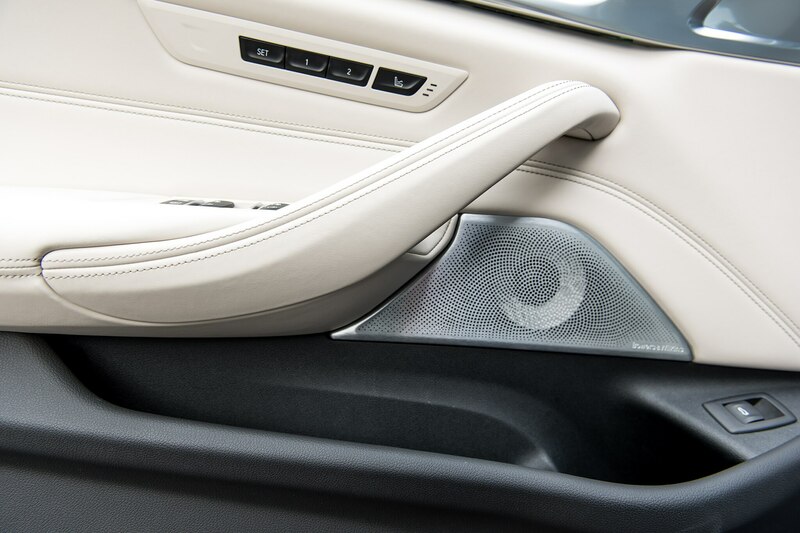 Bowers & Wilkins premium sound? 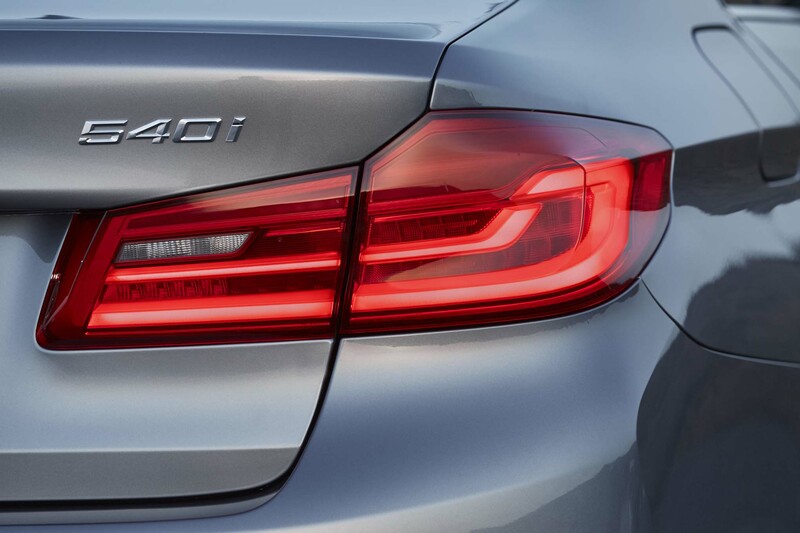 $4,200, please. 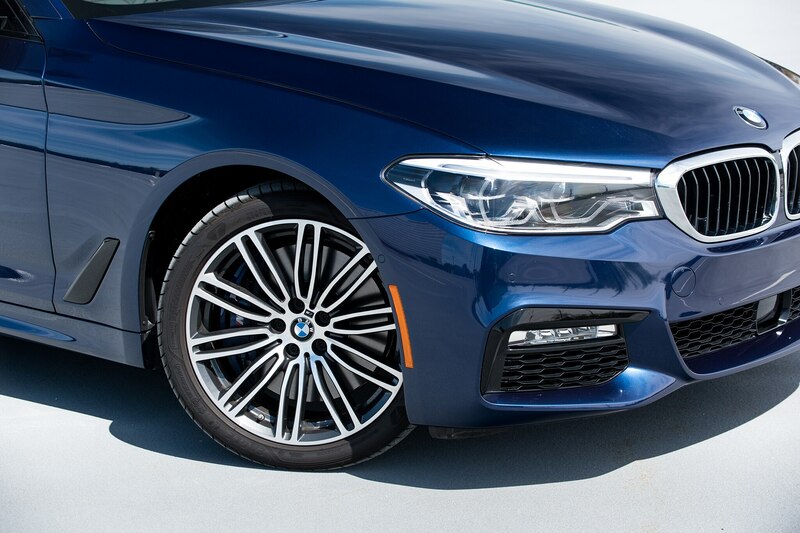 Fully loaded with all the goodies for comfort and performance, this 540i rings in at a harrowing $82,610, with more than $25K in options alone. 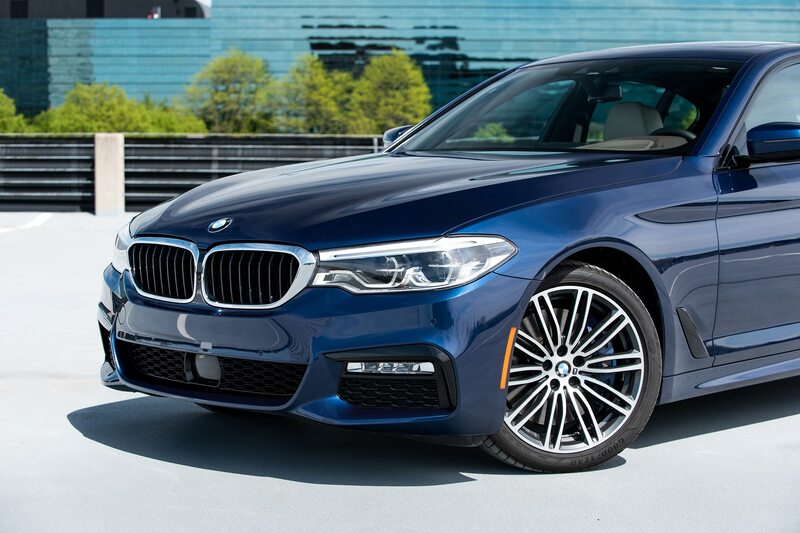 For 540 fans that remember a balanced, distinguished, and satisfying executive sport sedan, I’m not so sure this latest model will pass the smell test. 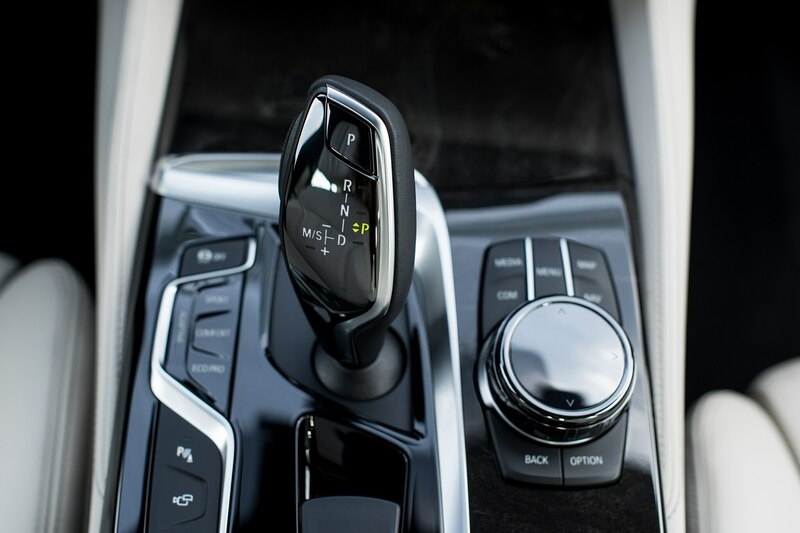 Yes, traditionalists of this sort tend to turn their noses up at all of the advanced technology and equipment that has crept into modern vehicles. 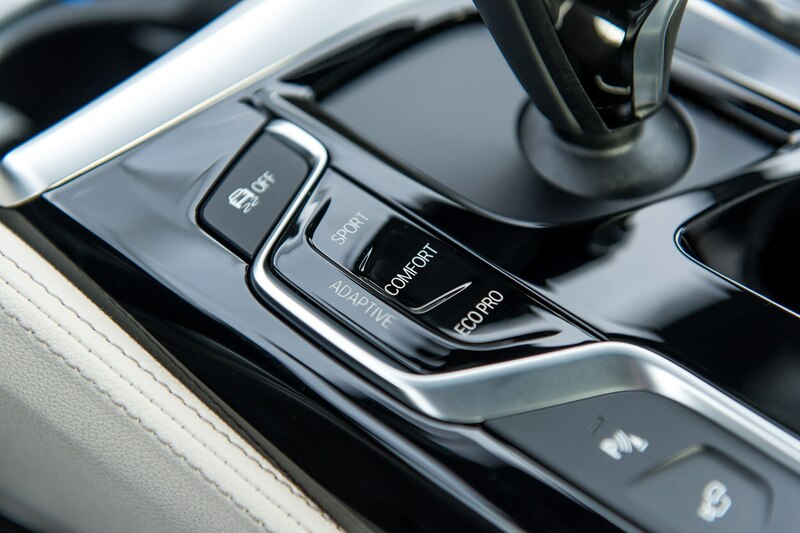 But ask anyone who has driven a Cadillac CTS Vsport or Mercedes-AMG E43 lately, modern luxury sport sedans, at least ones that make you want to spend more time driving rather than getting a heated massage, aren’t dead. 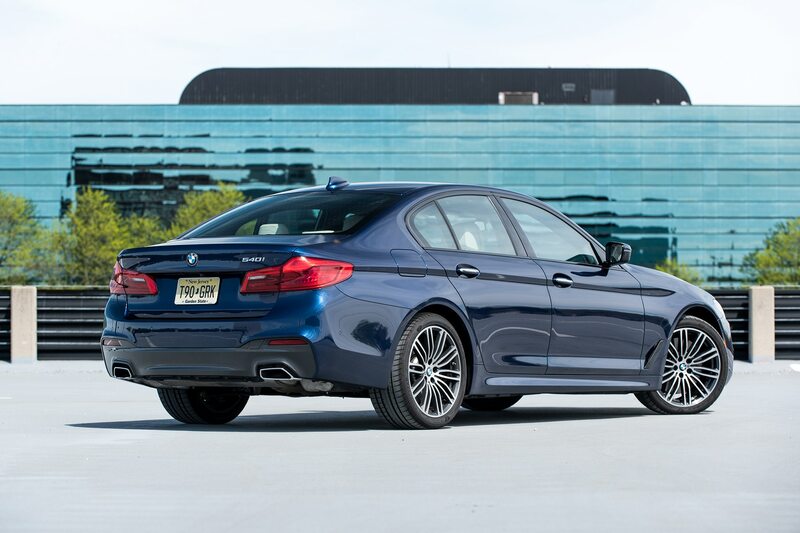 No doubt BMW still builds one hell of a powertrain, and the 540i is still best in class when it comes to what’s under the hood, but a once-loved badge isn’t enough to make me fall for this latest 5 head over heels. 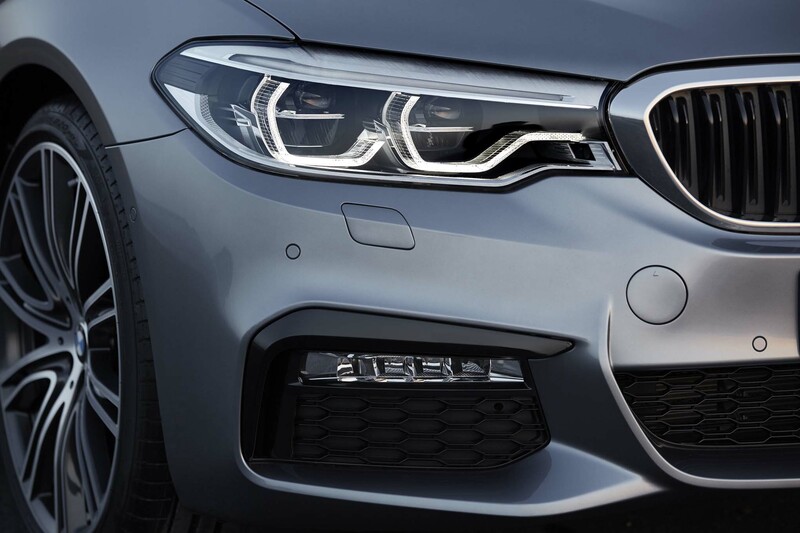 But it isn’t for the U.S.